This AAR was originally on the Paradox AAR forum but given some uncertainty about the future of that, I've decided to copy it over to here. We've heavily modded the leader death chances. The base die roll is 10 times higher and the individual chance to die for brigadiers is 15, 2/3 star is 5. After a discussion we left Fred & Daun as unkillable (they can be wounded) as loss of either will really unbalance the game. Unlike all the other AGE games, officers are just not a constraint in RoP (indeed from about 1758 onwards you can't even be bothered to promote people), this should cure that. Narwhal found that the 'Northerner' trait for the Swedes was acting oddly. It meant that in Pommerania they were hampered but if I put them in say Hannover they got very enthusiastic. 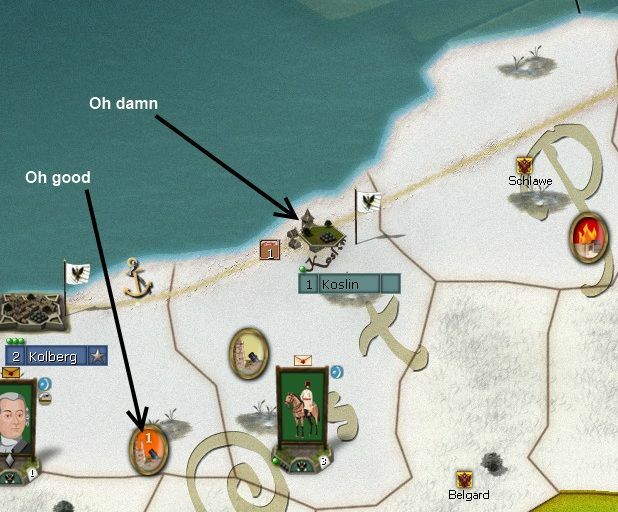 We've modded out the trait to remove this, and I've agreed to some restraint as to their deployment. There may be more but those are the main ones. Not too intrusive on the game, or hard to remember when putting together orders (we discussed more complex things such as limits on multinational forces etc), but they address things we felt were unbalanced one way or another. Thanks to Narwhal both for the research and coding. If the leader loss rate becomes too extreme, we'll mod back to a mid-point between these changes and the default settings. Well some of you may have seen this map before, but it does set out the opening position for both sides very clearly. 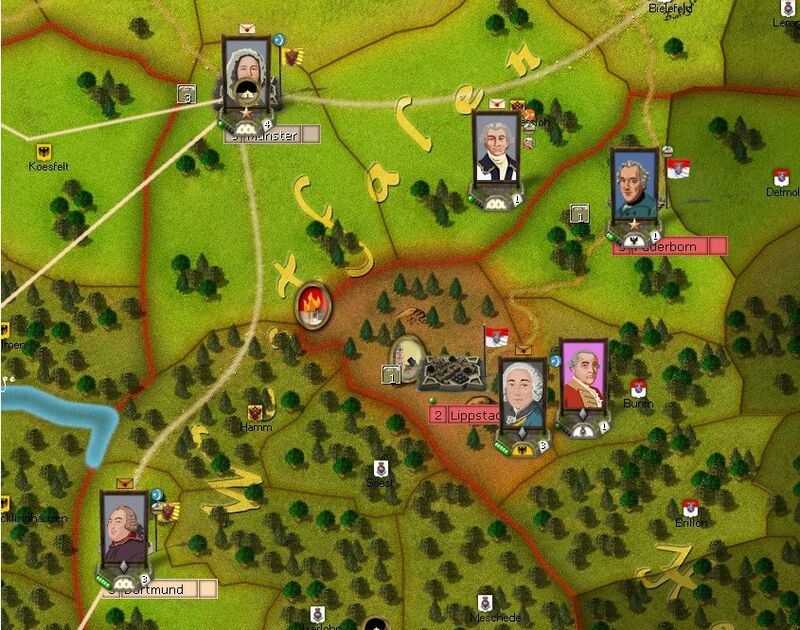 In effect, the Prussians are in an arc to the north and east of Bohemia, led by one of history's greatest generals. 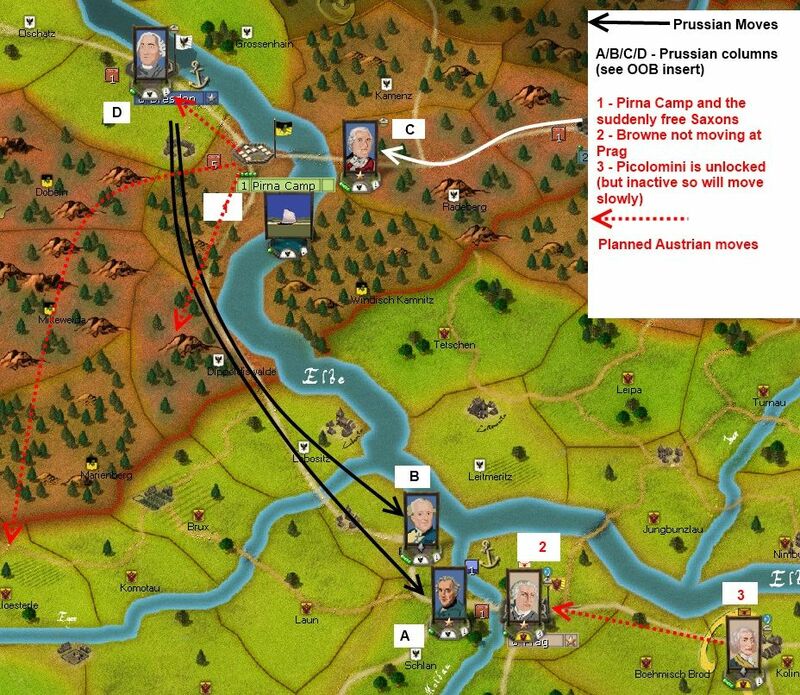 The Austrians have 3 corps in and around Prag, one of which, led by Picolomini is locked for the first two turns. And, finally here's the goals of the game. Note there are 176 turns to go, so in theory neither of us needs to rush. 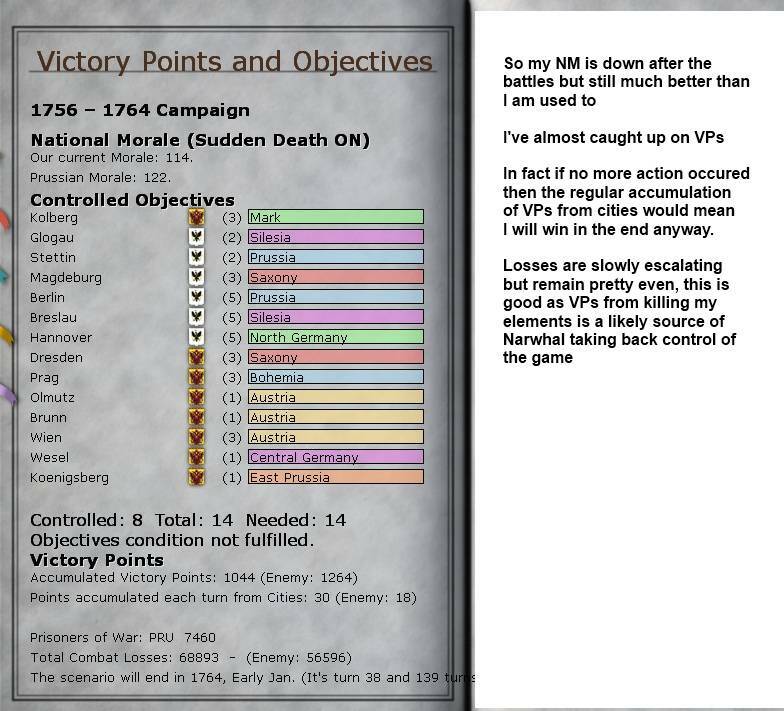 In practice, Narwhal has a real advantage to the end of 1757, at that stage if I've survived more or less intact he has a problem of pressure from multiple fronts and the possibility of an increasing desparate campaign to fend me off. Now this only becomes a threat if I can keep all my main armies (Austrian, French. 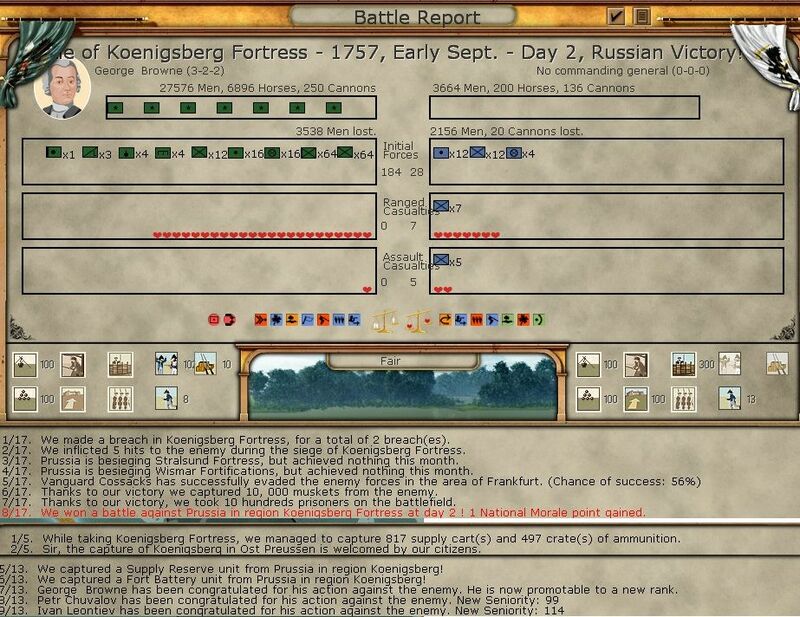 Russians) more or less intact and solve the problem of getting the Russians past Koenigsberg. 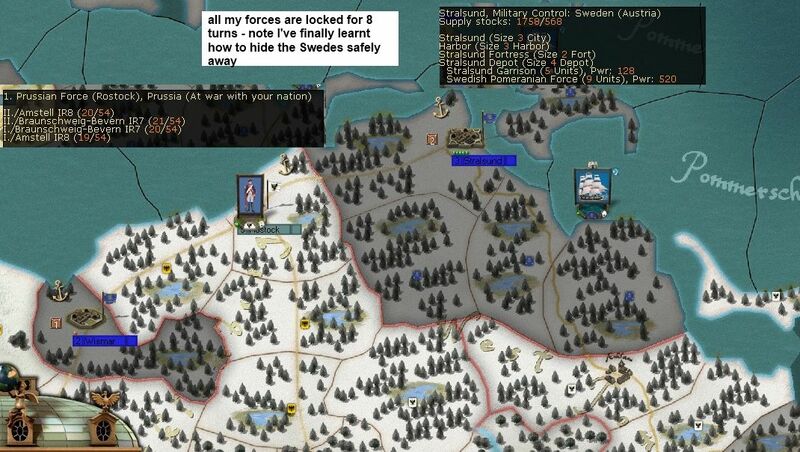 I have minor but important forces in Bohemia and Sweden. None of this lot, apart from the Austrians, will appear till Spring of 1757, and the Austrian field army will double about then. In the short term, that army at Prag is it for me. This influences strategy quite substantially. 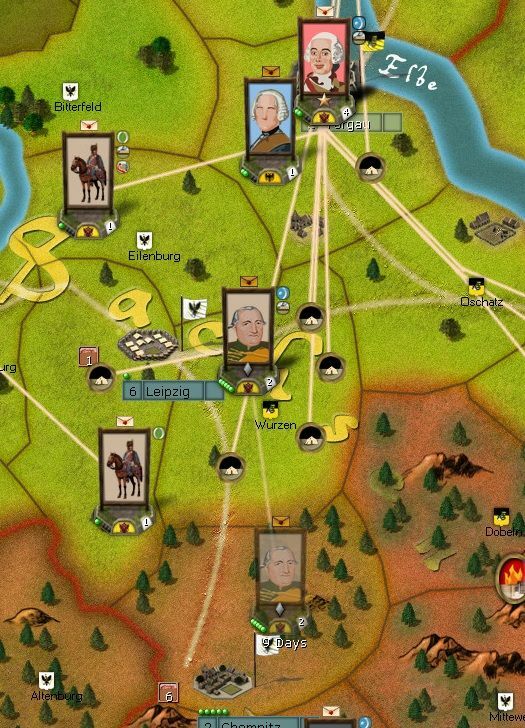 For the first 18 months, to me, any gains in terms of cities are a bonus, what I am committed to is not to lose any of my main armies. Narwhal ideally would like to take out at least one. Now, I can't just retreat and evade, so the balanced approach with the Austrians is never to fight (especially Frederick, Keith, or 'little' Fred), unless I am on the defensive. Then I will tend to 'lose' the battle, but hold my ground and from experience the loss ratios tend to be around 1.2:1 against me. At that rate, unless the defeat leads to something worse (such as being forced to manouver out of supply), I will survive. For the French its worse. 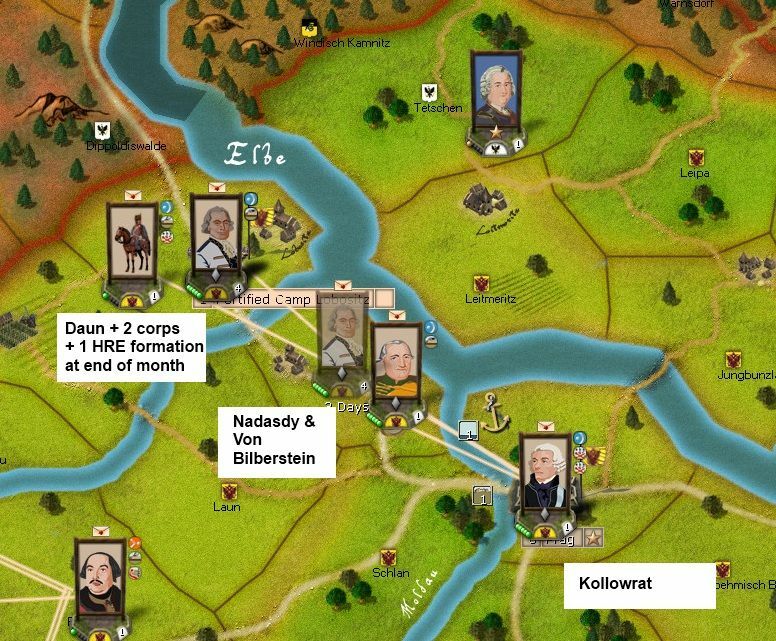 They lack the very good defensive leaders I have, particularly von Daun and von Bilberstein (note he starts in Picolomini's corps), so are very vulnerable if hit by Frederick and Prussian troops. They tend to lose at about 2:1 (which I can't sustain), so are a much more fragile force. The Bavarians and Swedes are worse, the group of HRE formations I gain in early 1757 are somewhere between the Austrians and the French in terms of competence. You'll note I've ignored the Saxons. 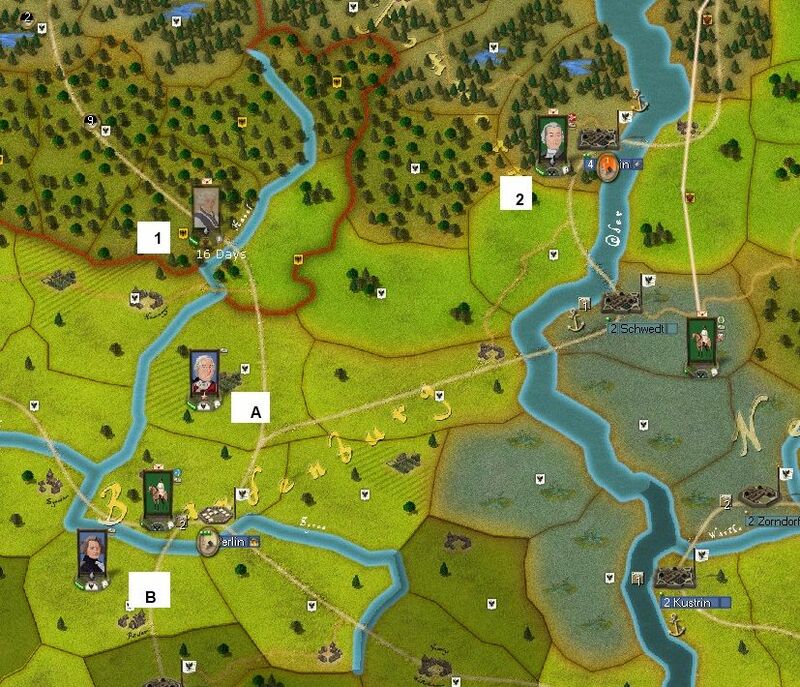 Well they start trapped in Pirna and are doomed if the Prussians surround and besiege the camp. Some more appear in 1758 in France and are similar in value to a typical HRE formation. If I reach late 1757, then I need an offensive strategy and broadly I need 4 columns (Saxony, Hannover, E Prussia and Silesia). By that stage the Prussians will be balanced between trying to land a knock out blow on one and having to fend off steady incursions into their heartlands. One other wider conceptual bit. Austria is cash poor/manpower rich, so my ability to reinforce and/or replace is heavily limited by the money I have. 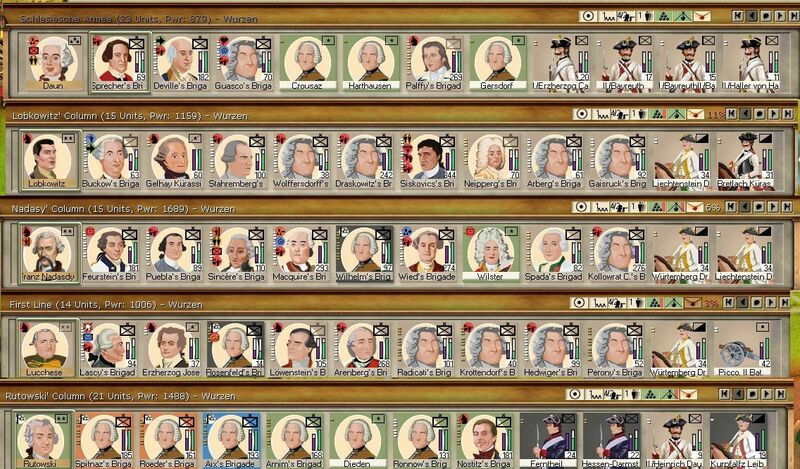 Prussia is cash rich/manpower poor. 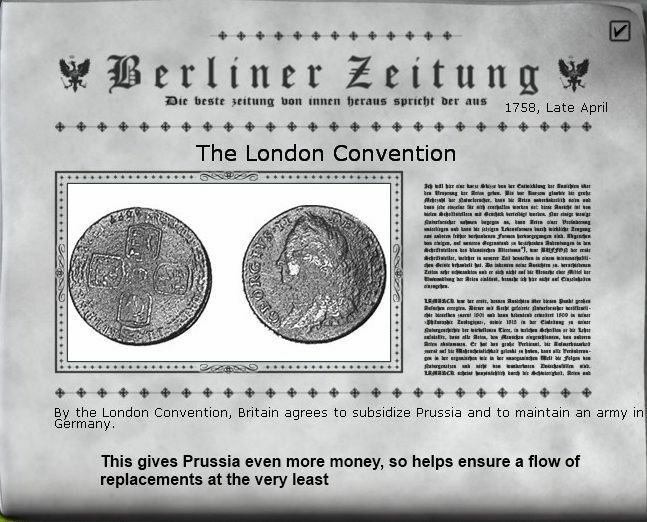 The balance for Prussia is the substantial British reinforcements that come in via Bremen. So taking/holding Bremen becomes quite an important goal in its own right. 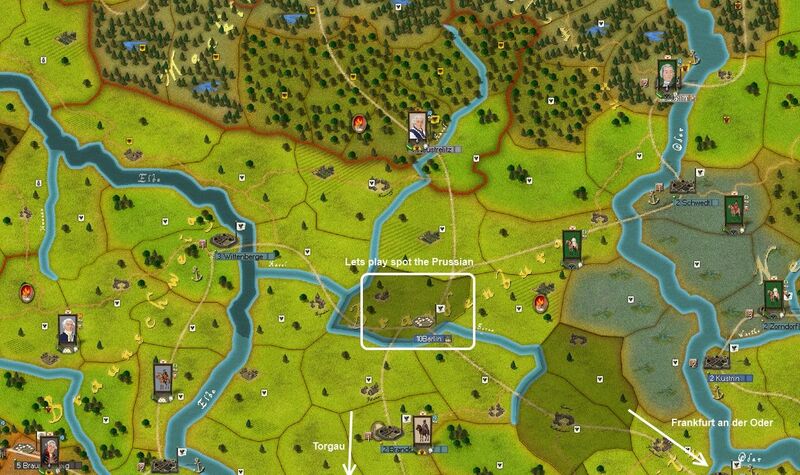 So the war opened with the now rather standard moves of Prussia investing Pirna, the Austrians forming up in defend at all costs stance in Prag. In our email discussions we'd agreed that the 'Prag gambit' was dead as by the time the Prussians arrived they only had one real chance to shift the Austrians (& that with an early Pirna surrender). Naturally I trusted Narwhal about this. 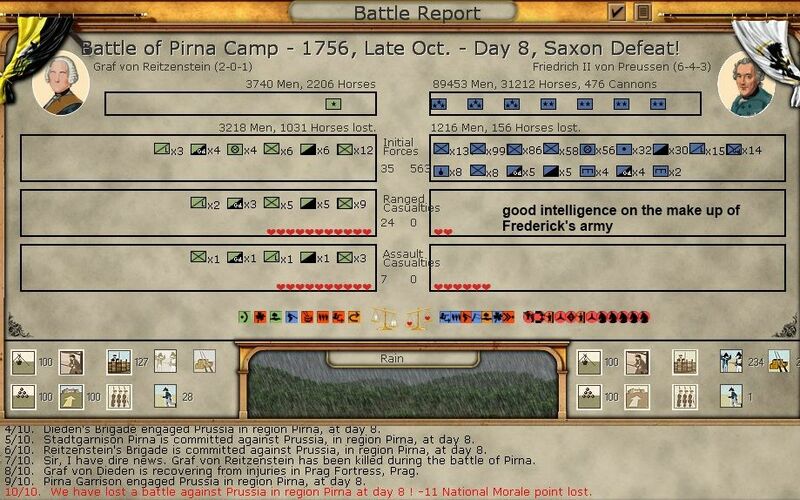 Well, he didn't stop to take out Pirna so by the end of September, this was the situation. Now this was interesting. 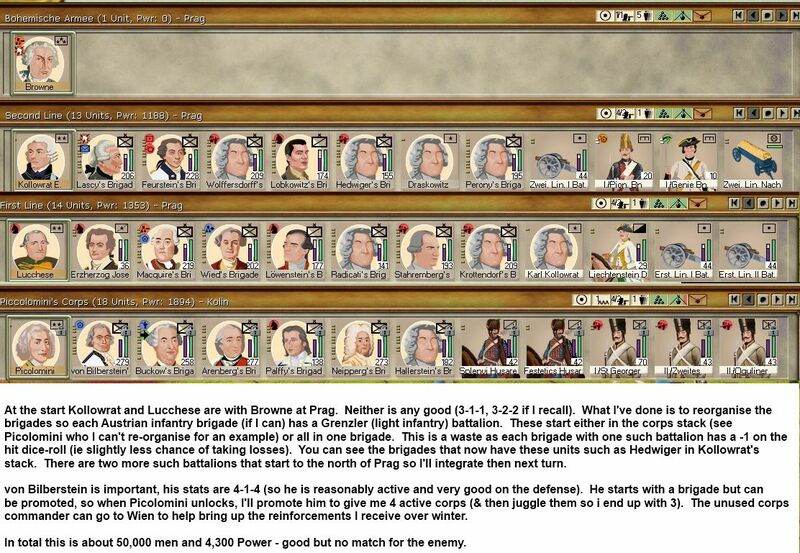 Fortunately Picolomini has just unlocked so his army was re-organised and ordered to Prag. Even if the Prussians attack over the river, he should be in a position to arrive by 'marching to the sound of the guns' (ie a corps that are in the same army and in adjacent provinces will usually enter a battle after the second hour). But I've never had the chance to play with the Saxons before. I decide I want to do two things. One is to catch Frederick's attention and the other is to run away. 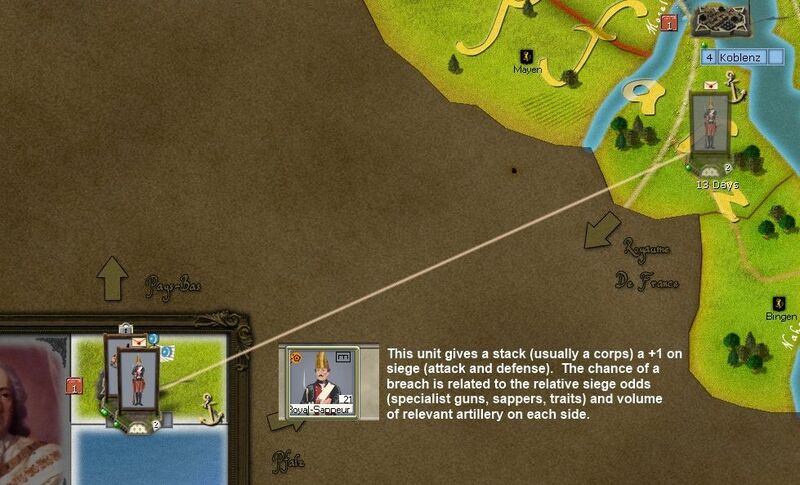 The units aren't that great but the supply wagons and artillery would be a nice bonus. So I send a cavalry brigade to take back Dippoldiswalde, another runs off up the mountain side towards and turns south. 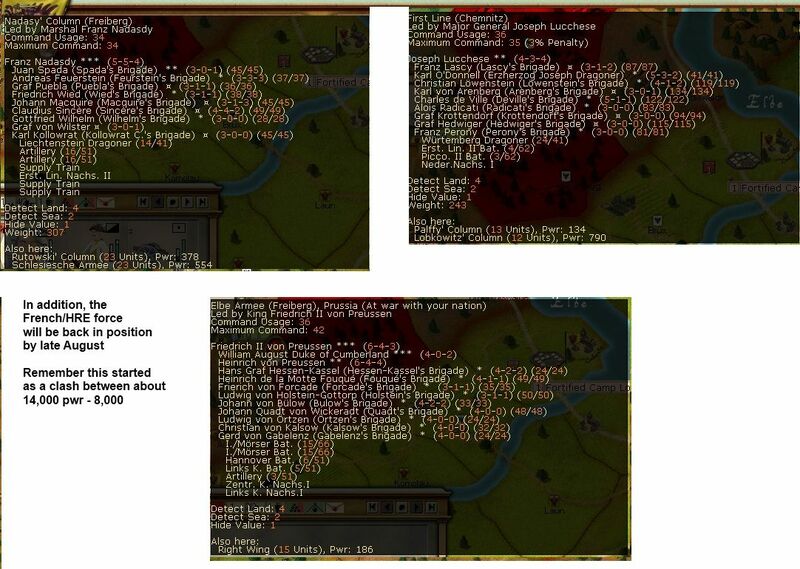 The infantry I organise into two columns. My goal is to hit Dresden and then move to either Chemnitz or further west (I forgot that a very useful depot at Erfurt is locked at this stage of the game). With hindsight, they should have all run up the mountains (I think). Now there is a huge negative side to all this. Killed in battle, all those Saxons are a potent source of VP gains for the Prussians and lost NM (national morale) for me. I hadn't realised but there is a nice balancing event that fires, giving me +10 on NM on balance. I guess on the assumption I'll lose it when the Saxons meet their ends. Well my goal is that they do not get the chance to die in battle ... its time to run. As the Austrians this is a huge shock. 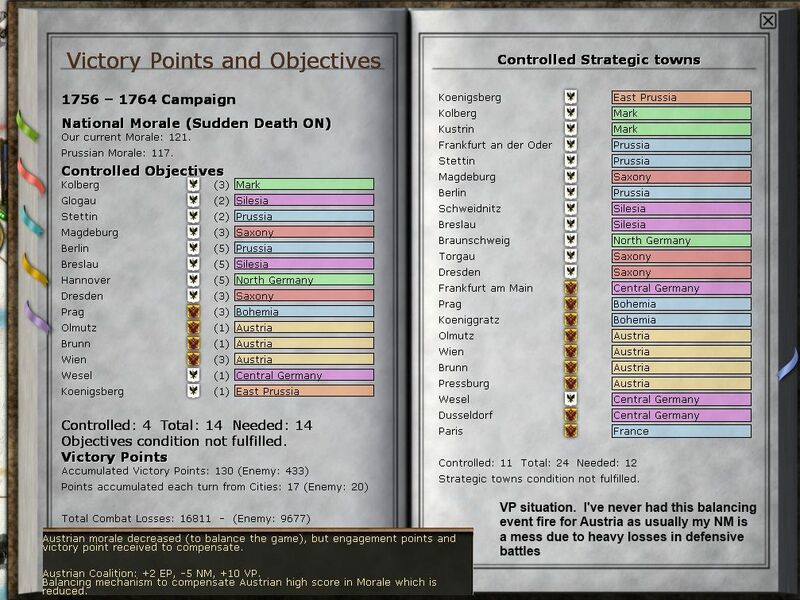 Usually after the early bloodbaths, my NM is down in the 90s, and by 1758 can be in the 60s (in turn this adversely affects your combat performance) due to the need to fight bloody, hold at all costs, battles in order to weaken the Prussians. This seems ... wrong ... nice but wrong - but I doubt it will last. Oh, and when the turns are processing you sometimes see enemy moves in other regions. I think I have seen the mobile force that starts at Koenigsberg moving west across Poland. If so, that is yet another threat to the Austrians in early game, but of course means that taking Koenigsberg itself will be a lot easier later on. 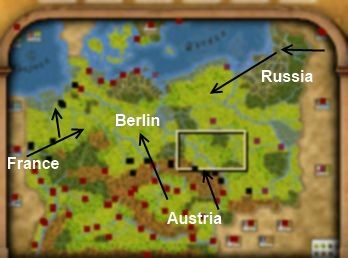 I'd like to use this update to discuss not so much my detailed plans for an offensive but my understanding of how to read the map presented by Rise of Prussia from the Austrian perspective. I'm going to concentrate on how it looks if I want to move off the defense and into Prussia, now first I need to survive 1757 which is always a challenge. Not least as Narwhal is equally keen to land a killer blow, preferably on the Austrians but if not then one of my other main armies. However, by doing this now, it may help put some of my moves into a better context. In effect, I have five armies, some of more use than others. 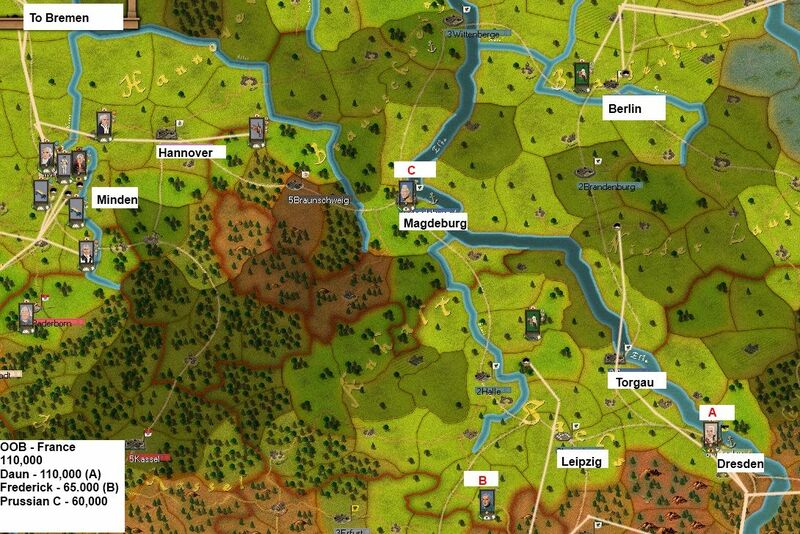 So I'll break the game map down into 4 parts of the Rhineland, Saxony, Silesia and E Prussia. The main French army goes into the Rhineland (arrives from Brussels near Wesel in about April 1757. 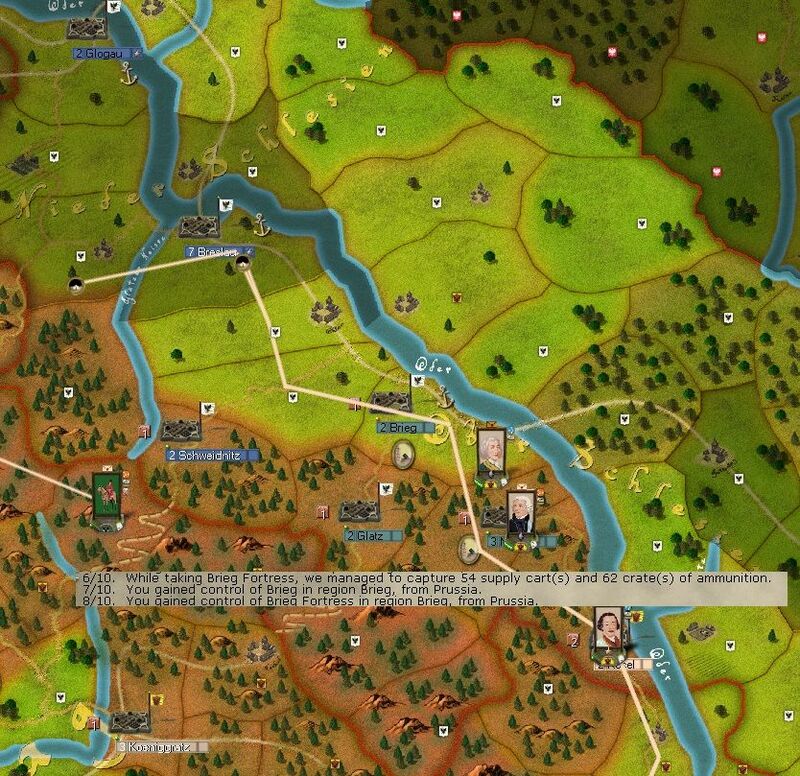 Now on the assumption that the Prussians don't manage to concentrate one of their own armies on this sector, in effect you can take that block of cities from Dortmund-Munster-Lippstadt-Paderborn and, hopefully Minden in 1757 or early 1758. Its at Minden it gets difficult. I find with the French, by this stage you've annoyed Freddie and are close enough for him to pay you a visit. The only solution is to make sure you are in a cluster of mutually supporting corps. This brings two issues. One you need to spend some supply wagons on building up the depots (say Wesel-Munster-Minden) to keep this large force in supply. The other is that from Minden, you have two targets and threats. Bremen is hugely important as if the Prussians lose that, they lose all the British reinforcements. Equally at any time, a large British army can spawn there. Hannover is important as a VP city and a source of Prussian/Hannoverian manpower. You need to split to take them both. If you take both, the next step is the Elbe. Unless the Prussians are off wailing on the French, this is likely to be closely contested. In effect up to Torgau, its relatively easy as you can only really be attacked from 1 direction and you can keep the army together. Supply is easier here – bigger depots – and you can use the Elbe to shuttle supply wagons up and down. 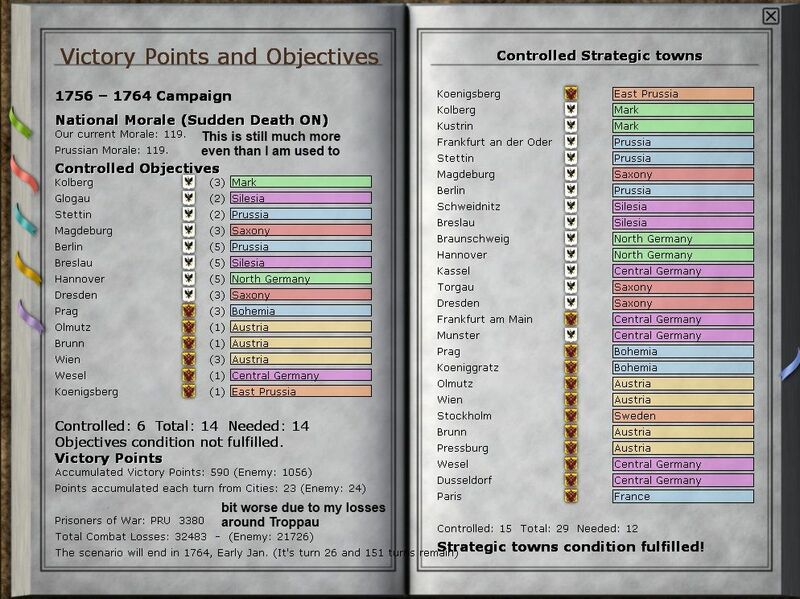 Its at Torgau there is a big choice, go for Magdeburg (a level 3 fort) and link with the French, or onto Berlin. And depending on the layout of the whole map, in theory you can be attacked from any of 4 directions. 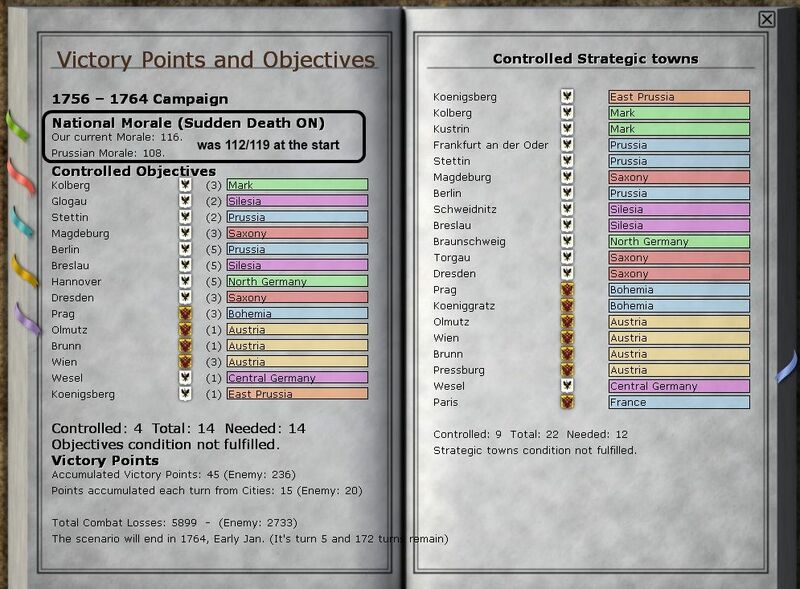 Even if its going ok, you don't want to engage in a campaign of manouver and you really do not want to be in the position of having to attack to redeem a strategic mistake. 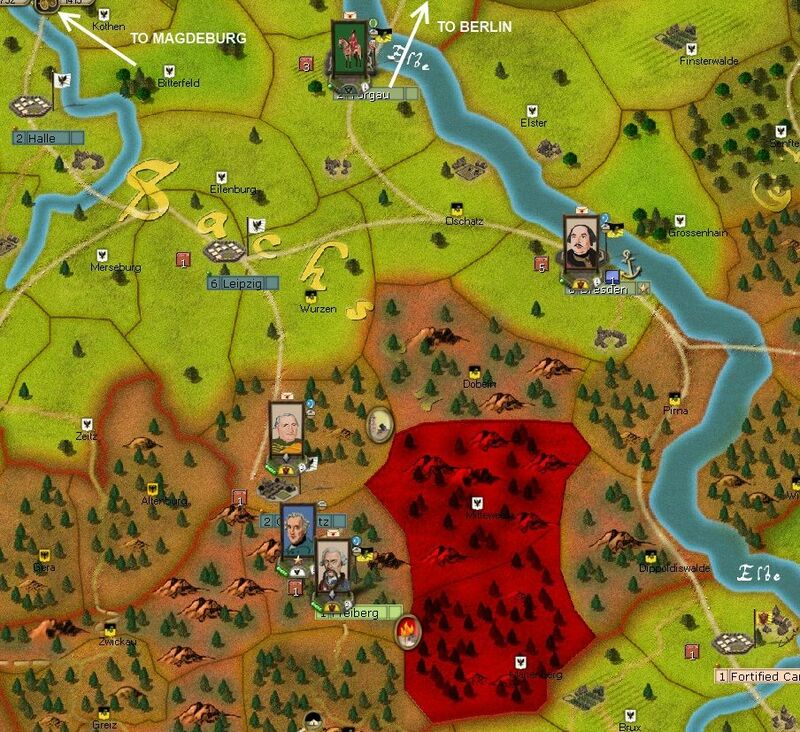 Some say to ignore this area, but I think there is scope to take some useful ground often with no resistance, or to divert forces from the Rhineland/Saxony and to block off one threat to an advance into Saxony. Also Breslau and Glogau are valuable VP and manpower producing cities. Plus, you can link up with the Russians and make an additional pressure point on Berlin. As with Silesia this is pretty linear stuff. Just not easy. 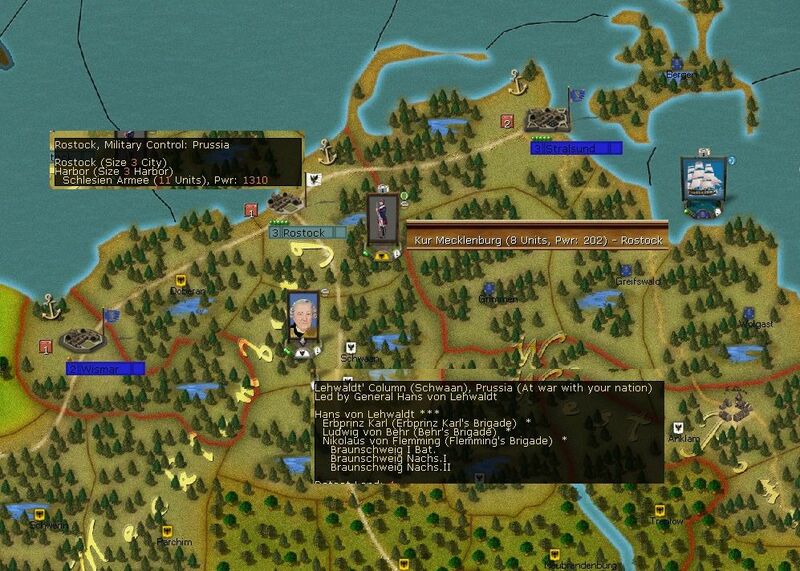 Take Koenigsberg, take Kolberg, threaten Stettin. Supply is a problem but the cities in Poland all act as permanent depots (for both sides), so you can traverse Poland using them as safe havens. When I played a PBEM game with Squarian we had another house rule which seemed to make the game feel more historical. No light troops were to be brigaded with line troops. They should be in independent commands or attached to the army stack. 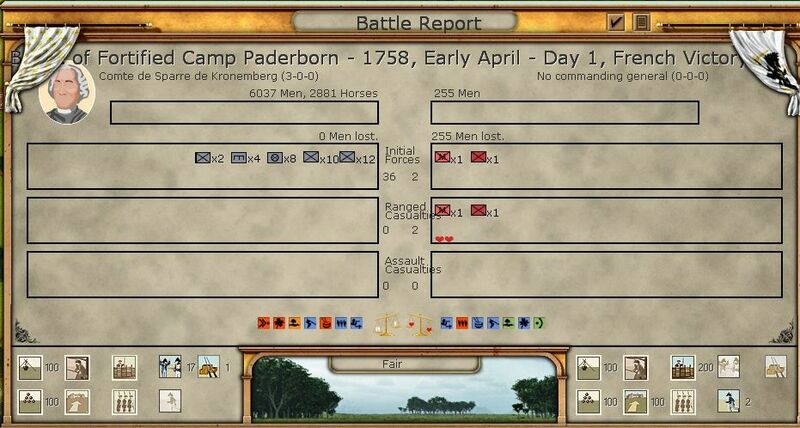 Light troops giving their initiative bonus to the brigade seemed a bit too "Napoleonic" for this period. Edit. Another thing we changed was the march to the sound of the guns rule. Again this seemed too "Napoleonic" for the period. We changed this setting to 0 I think it was, it meant that corps only MTSG if they are in the same region. Ebbingford wrote: When I played a PBEM game with Squarian we had another house rule which seemed to make the game feel more historical. No light troops were to be brigaded with line troops. They should be in independent commands or attached to the army stack. 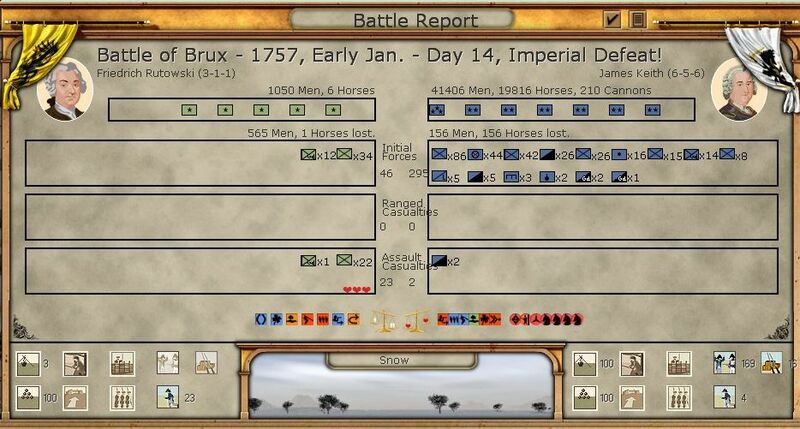 Light troops giving their initiative bonus to the brigade seemed a bit too "Napoleonic" for this period. 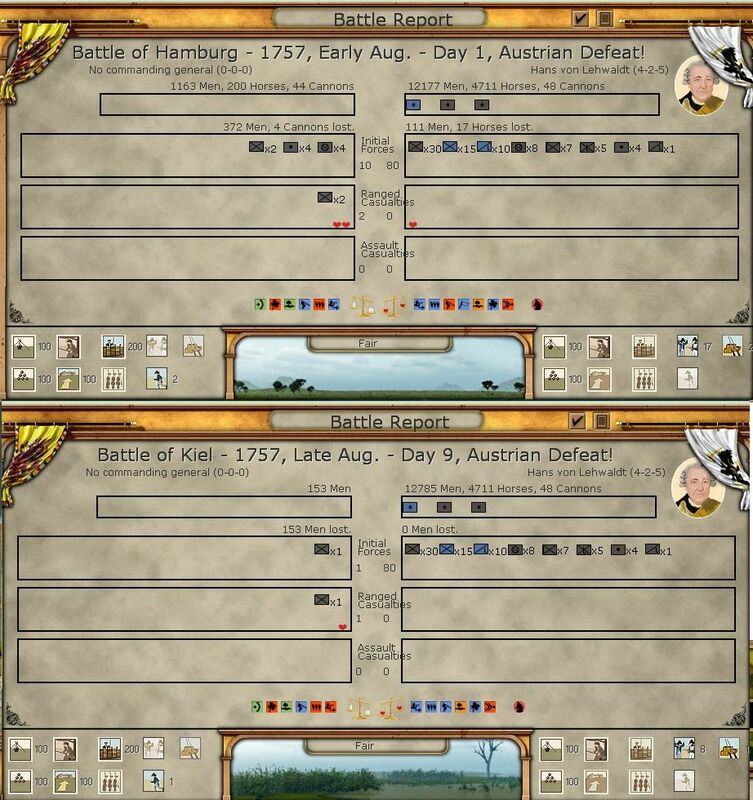 I'm just finishing up (ie losing) a Prussian PBEM where I kept the light units in separate brigades - I have to say with a bit of testing I don't think it makes any noticeable difference to battle results or losses. 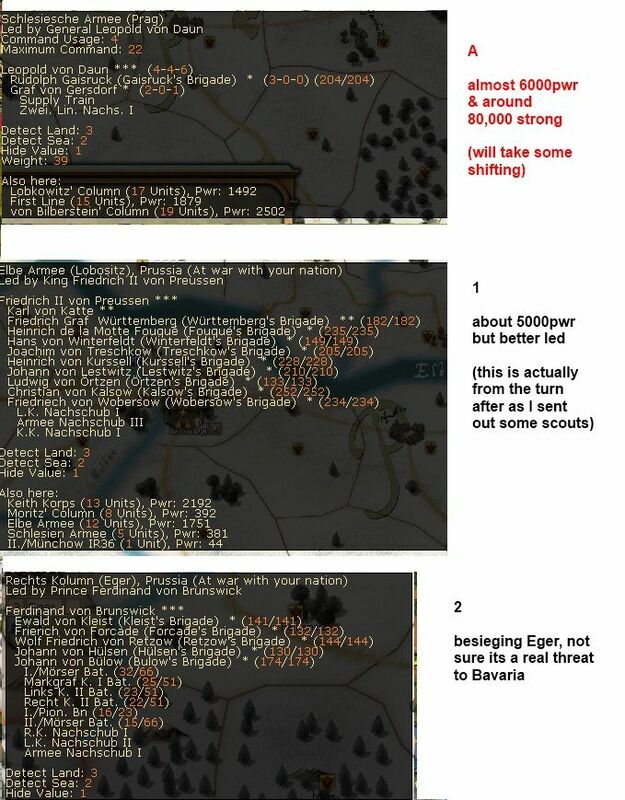 The only problem is that in a typical RoP game, I'm not sure there are regions where you get the scope for 'petit guerre' so either way I tend to end up with them fighting with the main field formations. As to march to the sound of the guns - thats an interesting variant. As you'll see in this game, that became my key tactic. Narwhal has a taste for outflanking moves and cutting your supply lines. By spreading my corps I was able to deny him that space, ok once in a while a battle went very wrong if the activation failed but in the main it allowed me to squeeze him into a confined space. I think your variant would produce a game more akin to WiA. One real issue in WiA is trying to second guess where your opponent will move and I think fits the lower density/poorer tactical intelligence of N America. Tis each to their own preferences, but to me, thats a key part of the operational options that makes RoP so great to play, you still have much more clunky corps structures than evolved over the wars of the Revolution and Empire. So by the end of October, the Saxons are split into three groups. A cavalry brigade running off into Bohemia, another cavalry brigade, an infantry brigade and the fixed garrison at Pirna and the two main columns at Dresden. Damn ... well both columns can escape via Mitteweida instead. even so by the end of December, the smaller column was safe (I reorganised and combined a lot of the battalions that had suffered badly from attrition) and the main column had a reasonable chance to get out. the supply wagons will really help, and the guns will be nice. That depends on the force led by Ferdinand not interfering, but it would be high risk if I put a reasonable force onto Loboswitz. 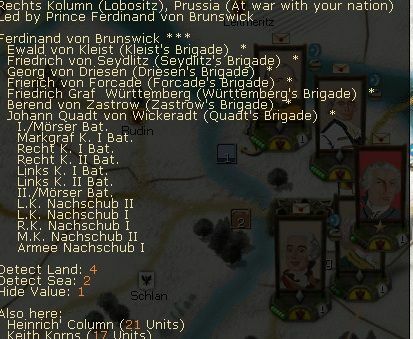 loki100 wrote: I'm just finishing up (ie losing) a Prussian PBEM where I kept the light units in separate brigades - I have to say with a bit of testing I don't think it makes any noticeable difference to battle results or losses. The only problem is that in a typical RoP game, I'm not sure there are regions where you get the scope for 'petit guerre' so either way I tend to end up with them fighting with the main field formations. Perhaps it would be better if the rule could be changed so that you can have a corps MTSG from the next region, but make it a very low chance that it will. This would then perhaps better replicate the problems of the day. 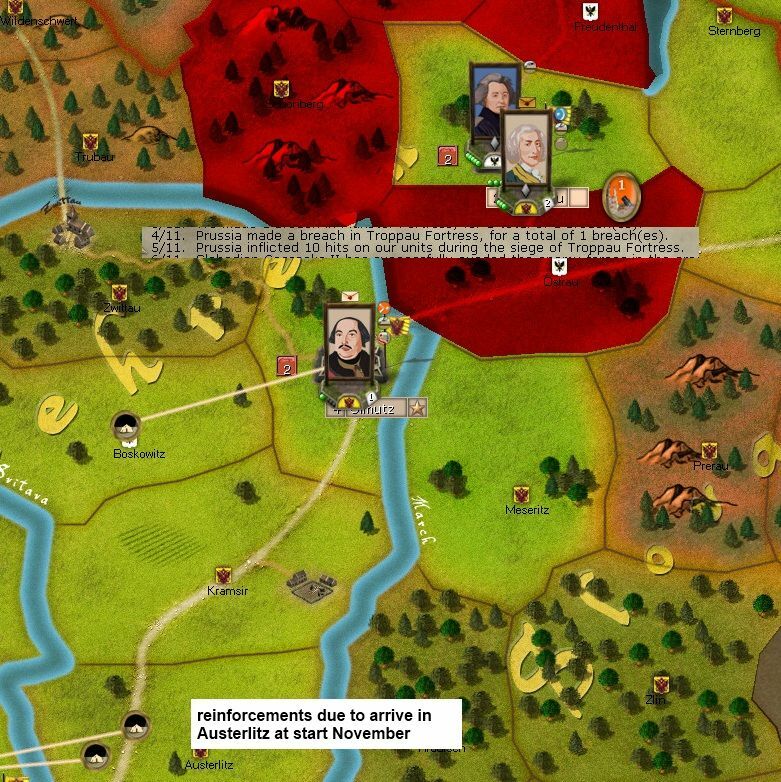 You could still have your army and two corps on a 3 region front, but the chances of each coming to the aid of another when attacked would be low. I tend to agree that it is a bit too systematic in ROP, but a chance too low might increase randomness frustratingly. Will it ? Will it not ? Ebbingford wrote: Perhaps it would be better if the rule could be changed so that you can have a corps MTSG from the next region, but make it a very low chance that it will. This would then perhaps better replicate the problems of the day. 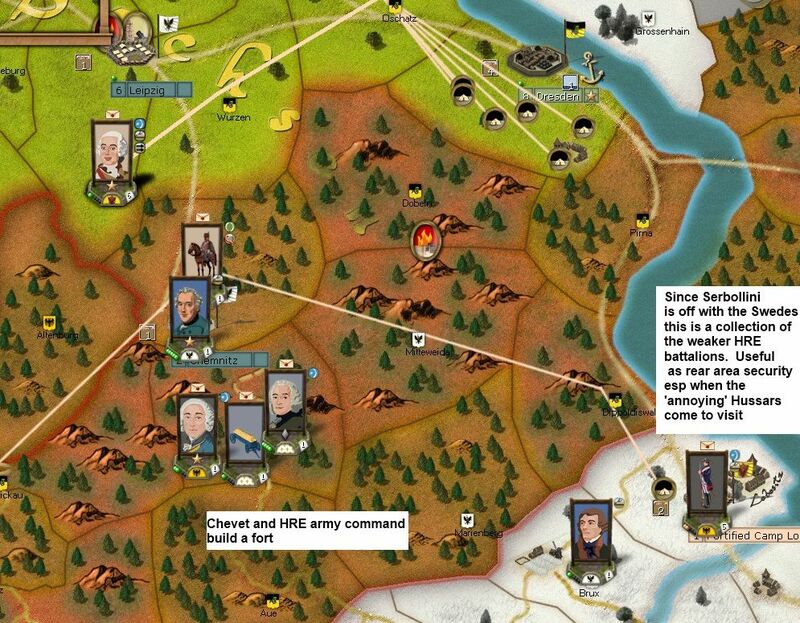 You could still have your army and two corps on a 3 region front, but the chances of each coming to the aid of another when attacked would be low. Narwhal wrote: I tend to agree that it is a bit too systematic in ROP, but a chance too low might increase randomness frustratingly. Will it ? Will it not ? The main focus of us both in January 1757 was the fate of the Saxons. 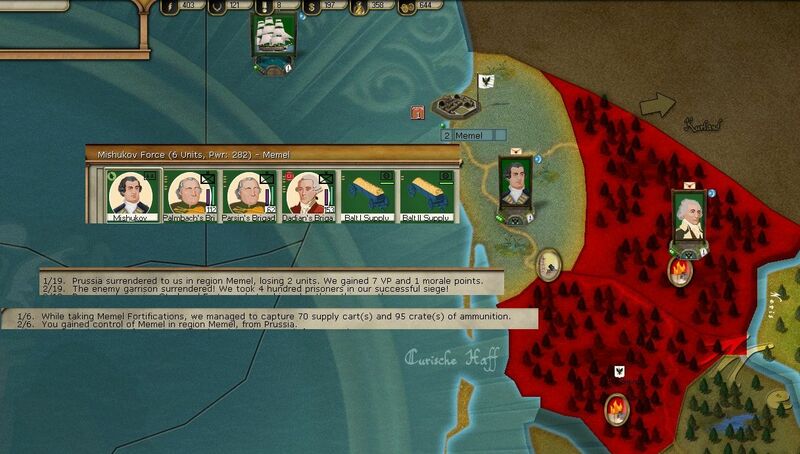 I wanted, at the least, to secure the supply wagons and guns, Narwhal just wanted to kill them all. 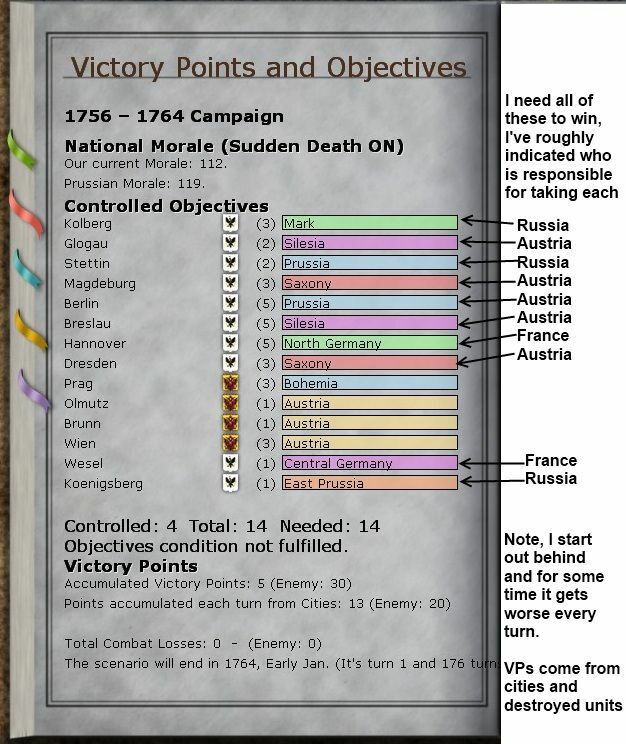 One thing I did a lot of in this game was to set the Austrians up in a network of supporting corps rather than as a single clump (although I did that too at times). My logic was over time I could constrict Narwhal's operational space (he would have to make wider marches to get in behind me) and that at the worst, one corps or the other would be mauled in the first phase of a battle before the others arrived. This was the first test of that, using Daun and von Bilberstein in tandem, but with the latter able to cover Prag as well. Since a direct attack on the city would still be in winter, over a river and at two entrenched formations, this is not too big a risk with Prag, It was, however, a big risk with Daun. 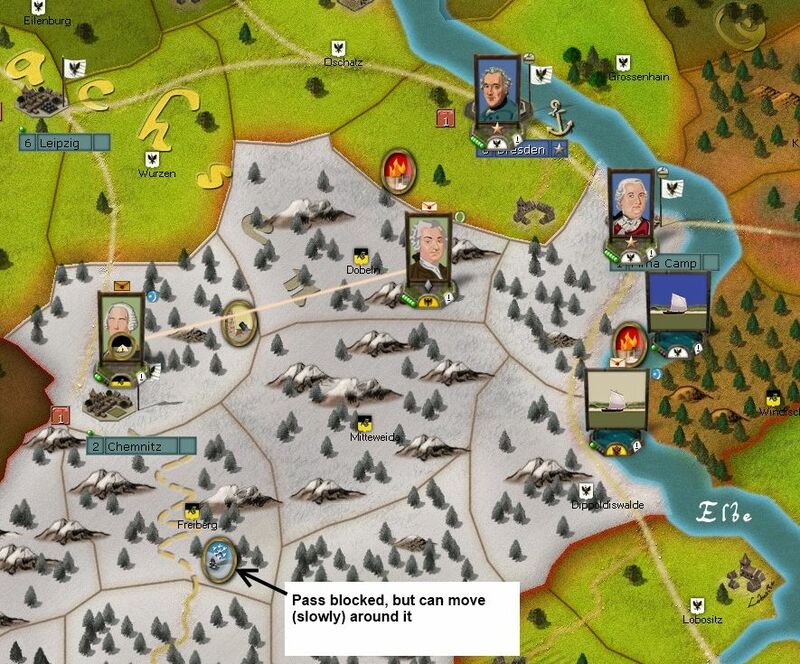 My logic was that the Prussians woudl try to take out Karlsbad and possibly Eger as well as try to block the escape. My hope was I wouldn't run into a too powerful a force, equally although Daun was ordered to Brux, my hope was he wouldn't reach and stay there. Wiped out the fixed garrison (it is unfortified), fortunately the damaged Saxon brigade that was resting there had moved south to safer places before they arrived. More importantly, Moritz's Prussian cavalry deployed to Brux. Now Daun had fairly weak orders (I didn't want to attack outnumbered over a river with commitment in case a large force was there). In the battle I did a lot of damage to the cavalry in the first phase, and was then driven off when the bulk of Keith's army marched to the sounds of the guns. Unfortunately the Saxons arrived too late and had to fight there own way out. 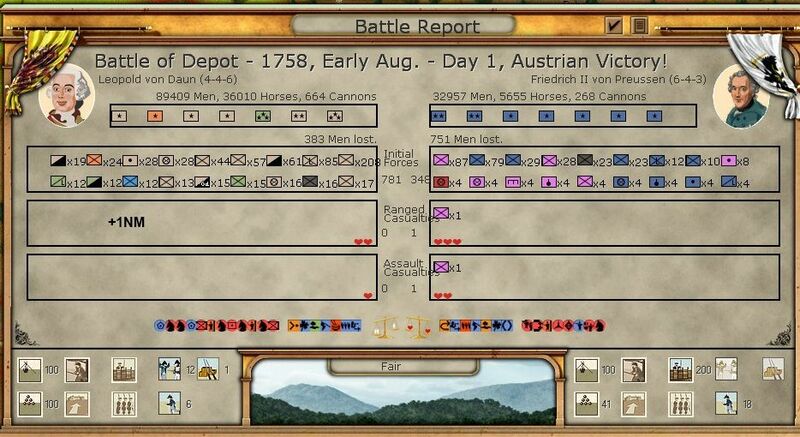 Oddly trading all those damaged Saxon elements for a couple more Prussian cavalry is no bad deal. I also was incredibly lucky with the retreat route, they lept the Prussians and joined Daun and Von Bilberstein at Laun. 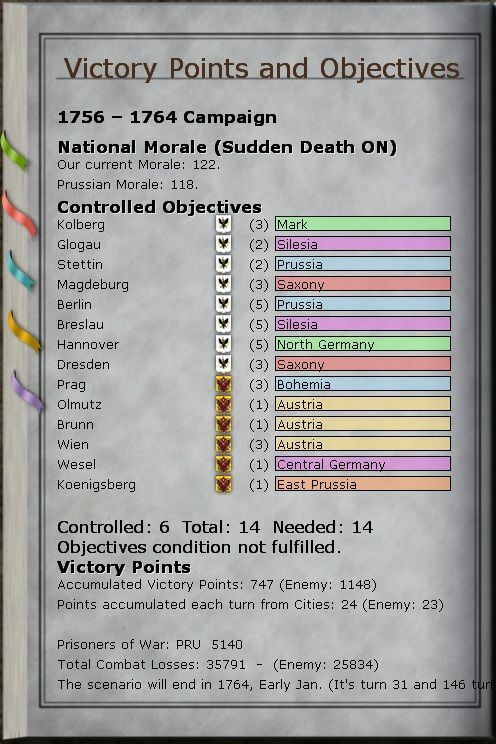 Other bonuses from the action was a very useful promotion, this gave me 4 corps in and around Prag and the ability to send the less good leaders back to Wien to organise all the reinforcements that pile up over the winter. Its about this stage, that a number of important events fire, bringing France and Russia to the war (they stay inactive for a while) and replacing Browne with Charles. I then buzz Charles back to Wien (to organise the new stuff) and put Daun in charge of the army at Prag. 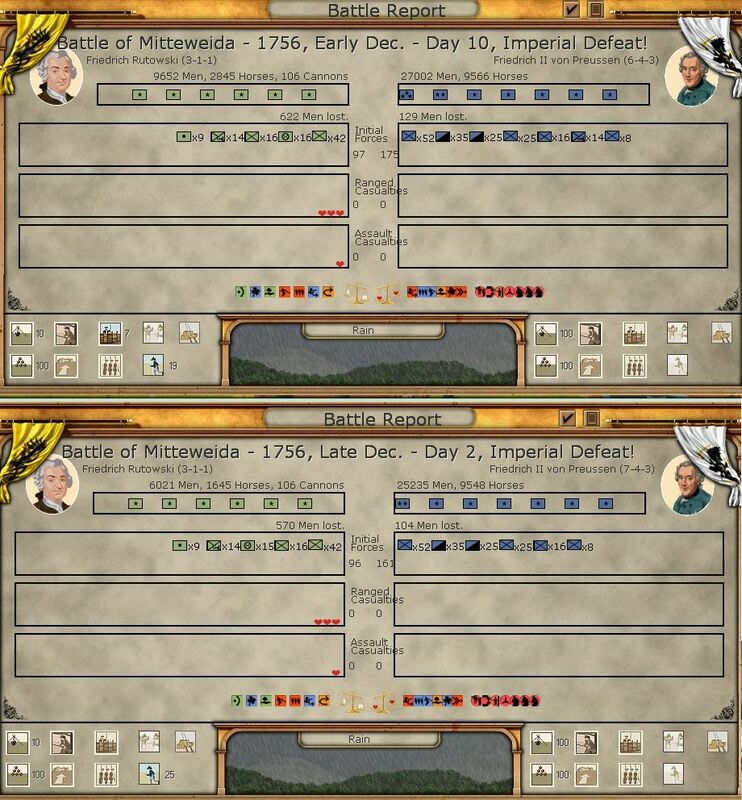 Its not too important in Rise of Prussia, but it does have an effect on the combat performance of your armies. 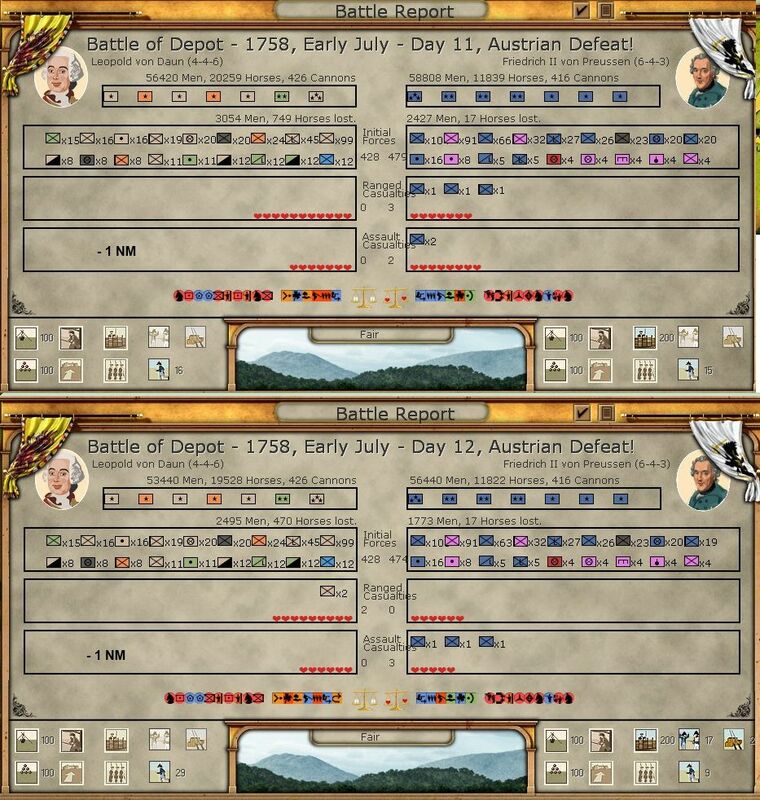 One thing I did a lot of in this game was to raise a number of depot battalions for the HRE, Bavarian and Wurtemburg forces. You can do this before they unlock so they are in a better shaper than I usually have them. 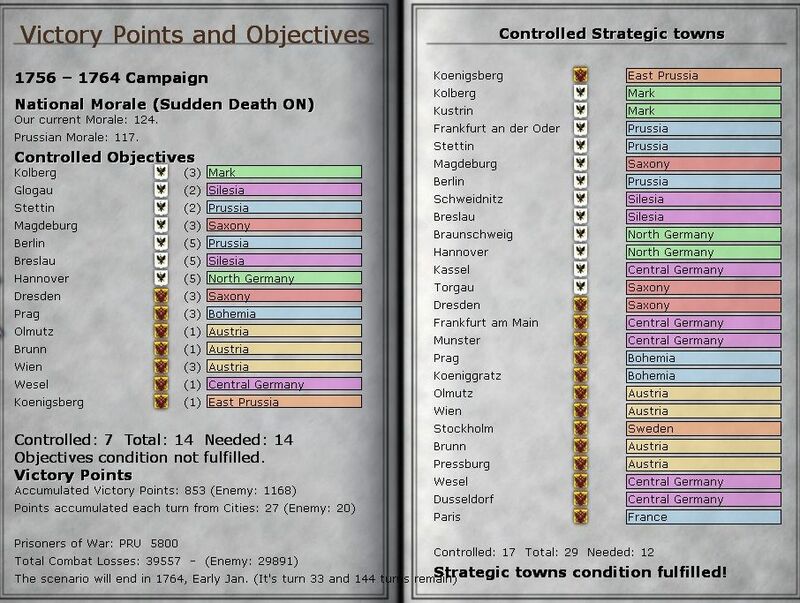 In this game, with Rutowski available, I can actually organise that large army that unlocks at Nuremburg to some effect. 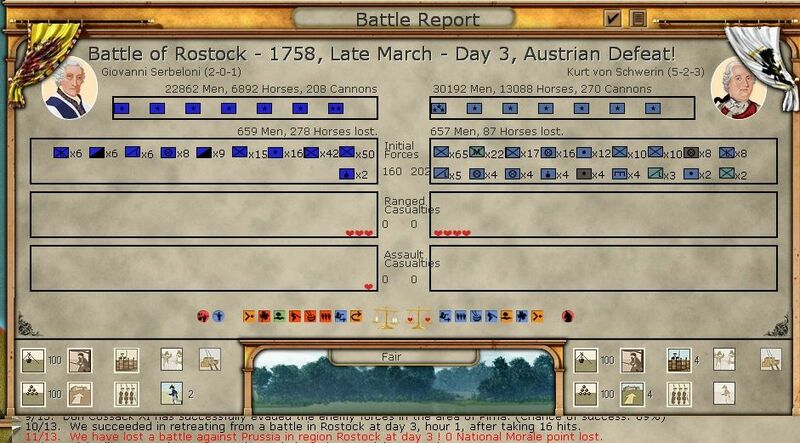 Normally I concentrate on the Austrians, but then often by this stage I have a lot of losses to recover. The balance of February 1757 saw no meaningful action, Daun's raid had allowed what was left of the Saxons to escape. 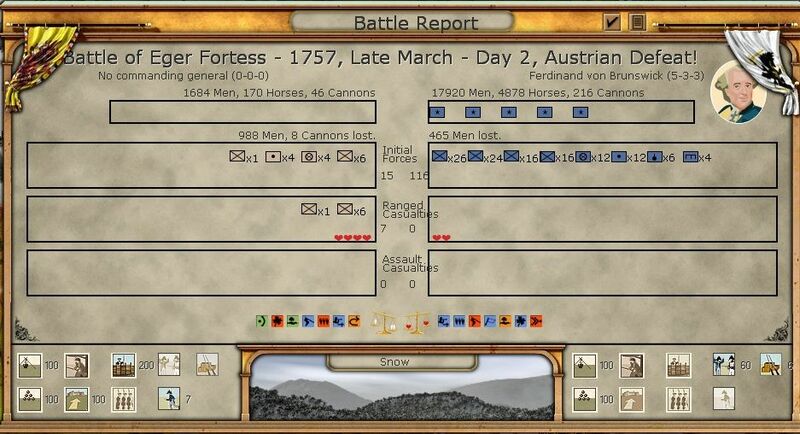 My main goal was to build up the Austrian force at Prag as fast as possible with the reinforcements that unlock steadily in early 1757. So by the end of the month, the situation was as at the start, with the exception of a Prussian siege at Eger. Not much I can do about this and I'm not too worried. By the time the passes clear, even if the Bavarian-HRE force at Nuremburg is still locked, it won't be damaged by a single Prussian corps. 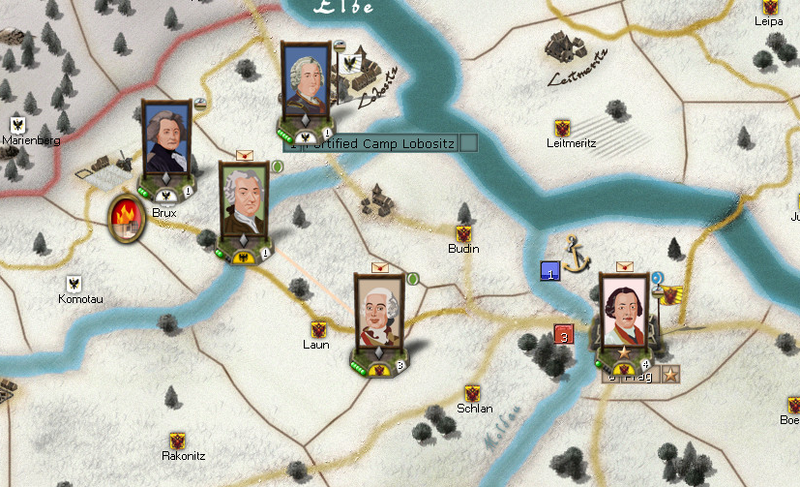 Equally Daun is strong enough to keep the bulk of the Prussians at Lobositz for now. In the meantime while I am spending most of my money and conscript companies on a steady stream of depot battalions (and a few regular Austrian battalions), I decide to buy a new supply wagon for the French. 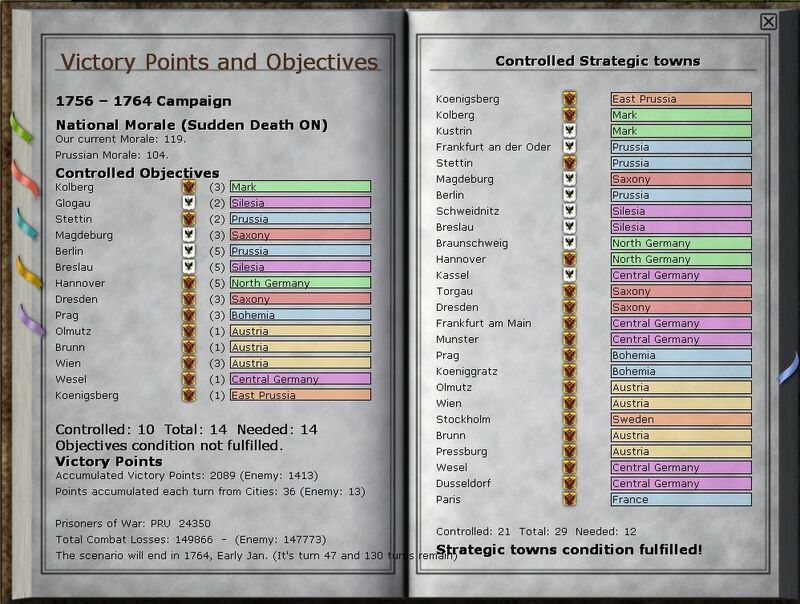 The main reason is that once you reach Munster, you probably need to build up the existing depots (in fact a sneaky Prussian player may even blow them up) so as to put your army in force onto the Wesel and threaten Hannover. And France starts to mobilize. One decision is the best use of those forces that start on the lower Rhein. 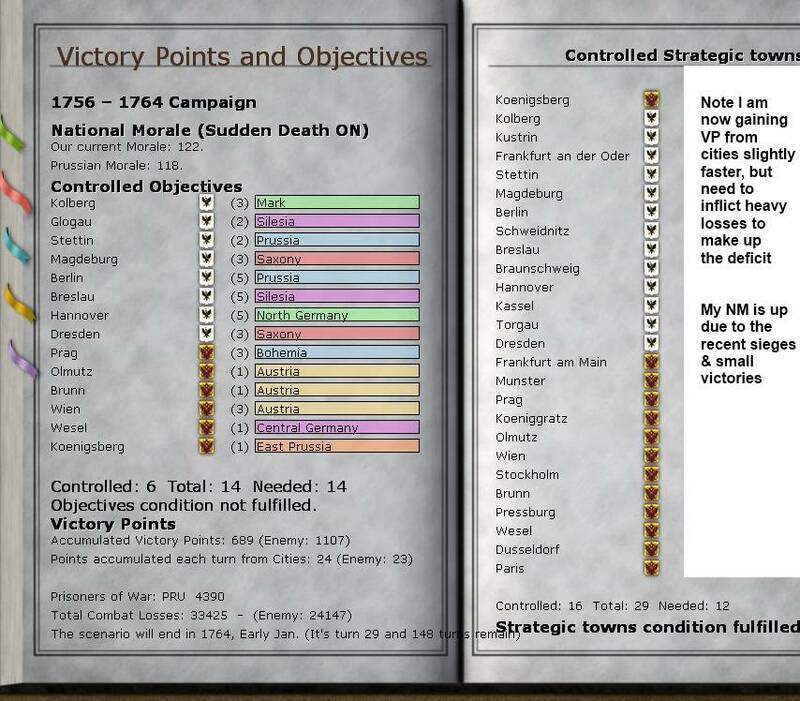 Options are Kassel (hard to take but quite useful), reinforce the main army or send to Bavaria. 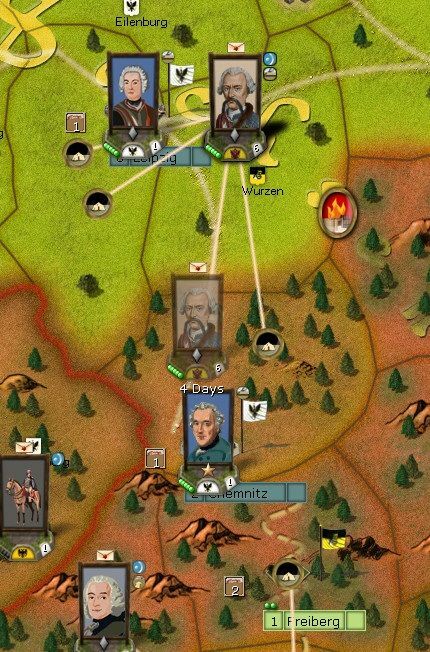 Since this time I feel that Bavaria is threatened, and I have the means to make better use of the Bavarian army anyway, I decide to send Chevert's corp to Bavaria. The bulk when they unlock in April will go to support the Rhineland campaign. On the middle Rhine, the French cavalry that unlock first at sent to Wesel, if I get lucky I may catch those Prussian infantry unawares. 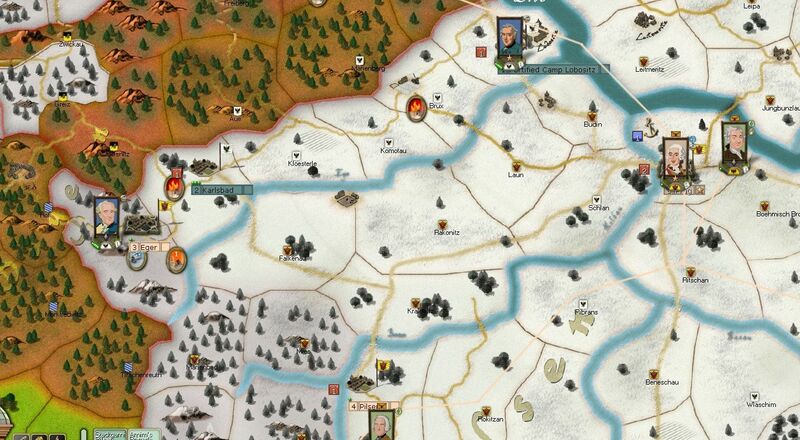 Sweden decides to join in the fun, and a fresh HRE force arrives at the now Prussian occupied Rostock, since they are locked for 7 turns this is not going to end well. This was a quiet pair of turns, so I'll mostly concentrate on background stuff. The final part of the update is a discussion of the reinforcement and replacement cycle, those only interested in the AAR can easily skip that. One main job in this period is sorting out all those Austrian units that pile up at Wien and Pressburg over the winter. They mostly unlock about now (some a bit earlier, some a bit later). Here I'd sent Picolomini and Kollowrate back in the winter, and Nadasdy appeared (you get him by event) to help out. Charles is back there to make an army. 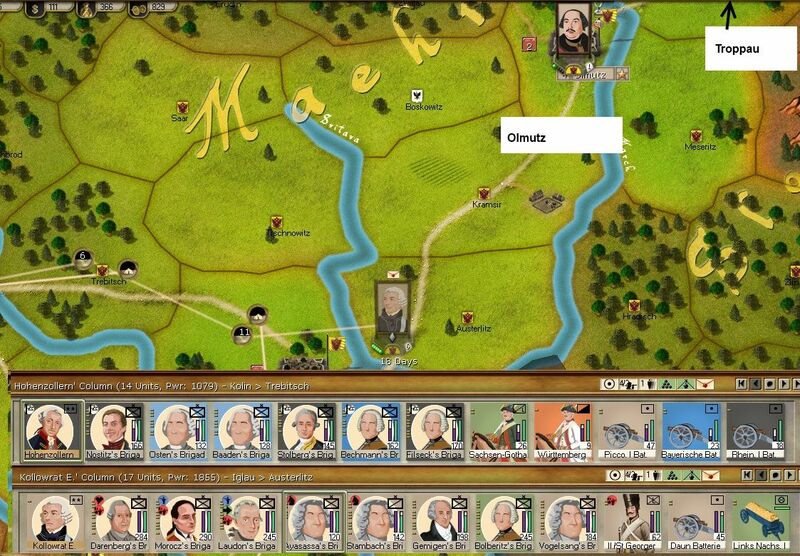 Now my plan was to use Picolomini as the heart of a force to campaign on the Oder. As you get more brigadiers later, the basic organisation of this army is a bit of a mess for now. 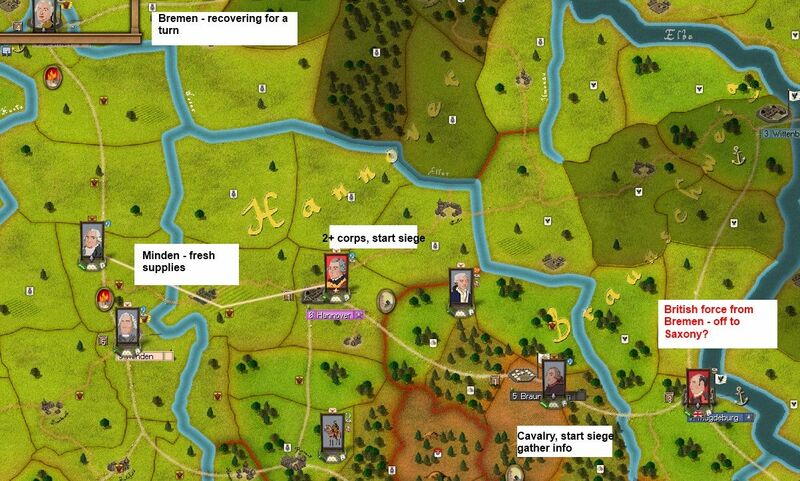 Another job (these turns are a bit 'administrative' for the Austrians) is to do with the HRE/Bavarian forces. But till they unlock you cannot do much to allocate brigade command etc. 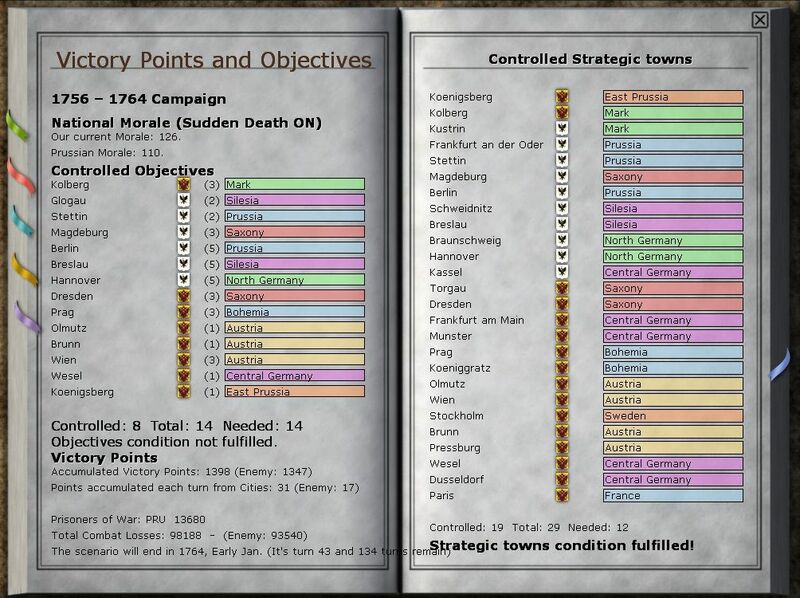 One choice is what to do with 5 brigades of quite useful units. 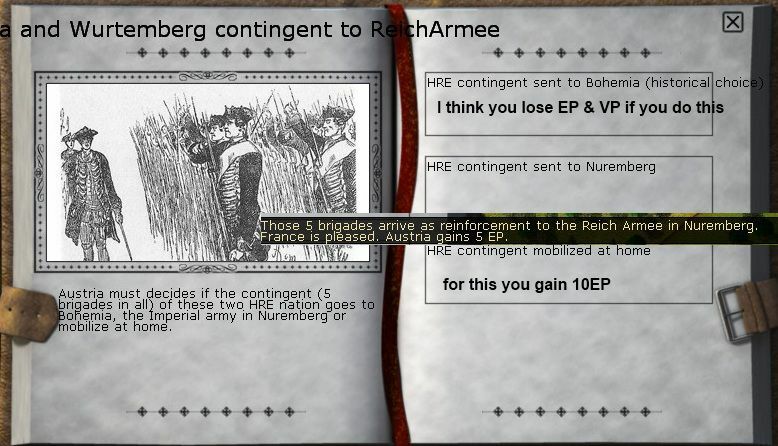 You can send them to Bohemia where they join the Austrian army. This will annoy the French and cost you VP. 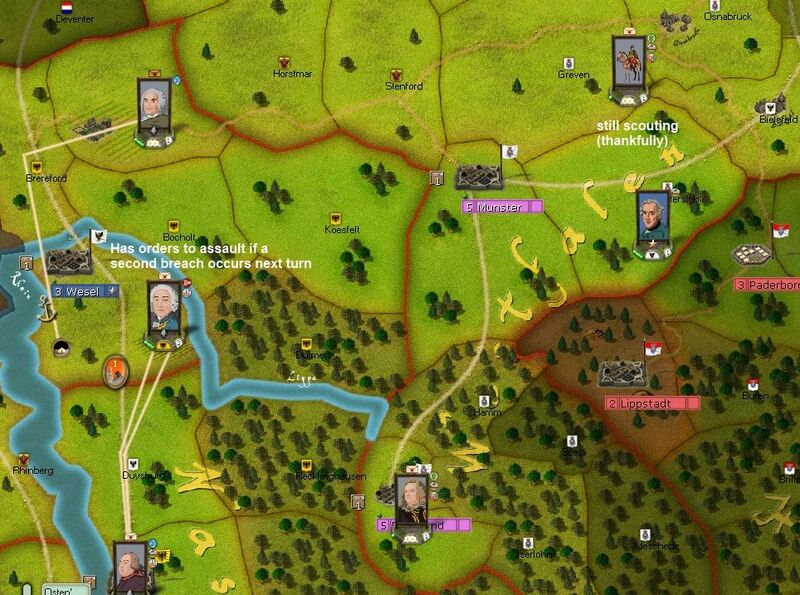 Allow them to mobilise at home (the south of the map, about 3 turns marching from any use but you get more EP for this). Or, as I tend to do, at Nuremburg with the rest of the Bavarian army. And finally the French unlock. Now I started with quite an ambitious plan to leapfrog Wesel and go for Munster at the same time. In reality you can't do this due to supply problems, but this was my original set of orders. But unusually for us, the overall death rate has remained very low. Which sort of leads me to a short digression on reinforcements and replacements. Narwhal has already covered the essentials in Learning from Prussia and, as far as I know, all that is still valid. So this is purely from the Austrian perspective. In essence you get reinforcements from 4 sources. 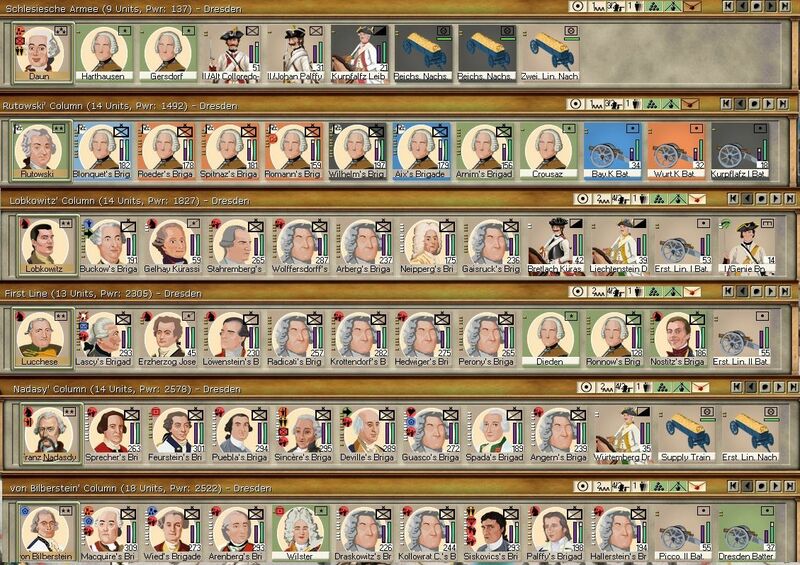 For example a large French force (in addition to the above) unlocks in early Autumn 1757 and the final batch in early Summer 1758 (I forget the exact dates). The Russians receive an additional corps this way in the Winter of 1757-8. Now these are 'on the map' at the start but unuseable till they unlock. The bulk of these pile up around Wien and Pressburg over the winter of 1756 and unlock in early Spring 1757. As above, its a good idea to preposition Charles and some corps commanders to sort them out and move them to the front. Actually you need combat ready corps to go to Prag as it maybe an active battle zone. 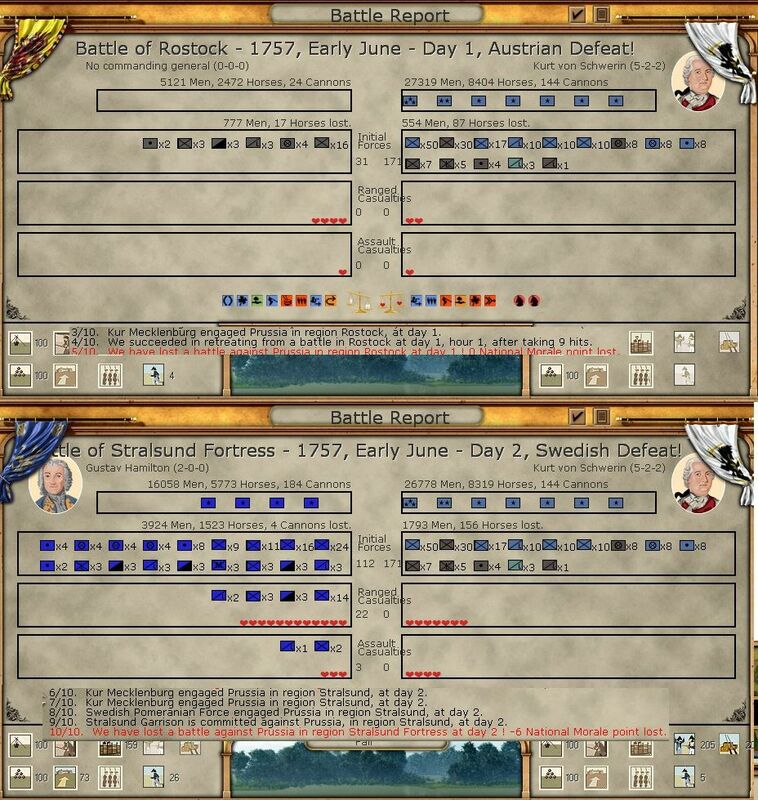 You get another 8 battalions in late summer 1757 and 4 (I think) in Spring 1758 as the Empire strips its forces in the quiet sectors (remember that notionally the Turks are in alliance with Prussia so the forces in Croatia and Hungary are essential in case of active war breaking out). 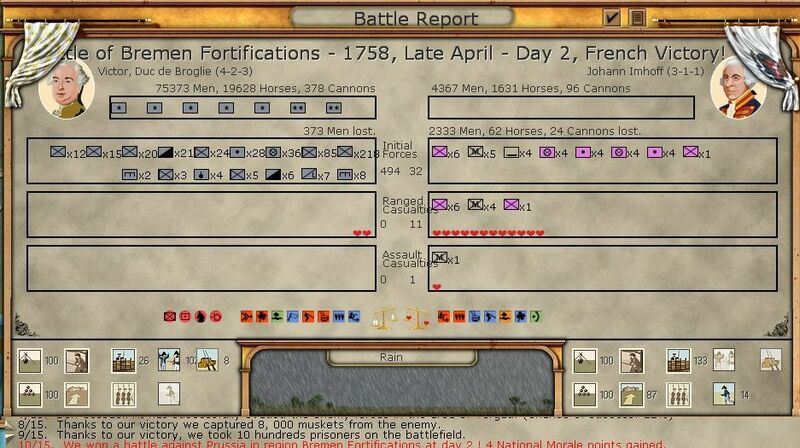 The French get 3-4 brigades of Saxons in 1758 by the same method. Usually for the Austrians these are hard to come by (not least you often have them stripped off you to restore your National Morale (NM). You mostly get 1 of two things this way. You can spend them on replacements, these go into a stockpile and are then used to replace losses in your field battalions. 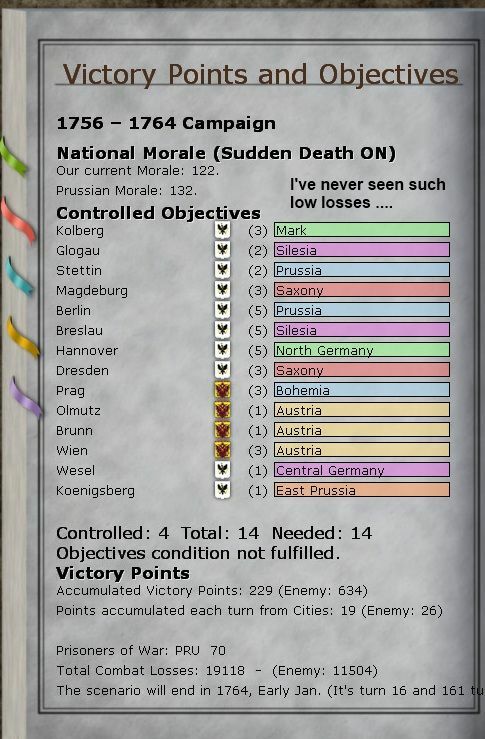 This is the only way to replace losses in your cavalry, artillery and light infantry, and you have separate pools for every nationality. You can also use EP to buy 'mercenaries' for France. I think these are good value (10 EP+60 cash) gets you 6-10 battalions (incl 3-4 cavalry), usually with their own brigade commanders. 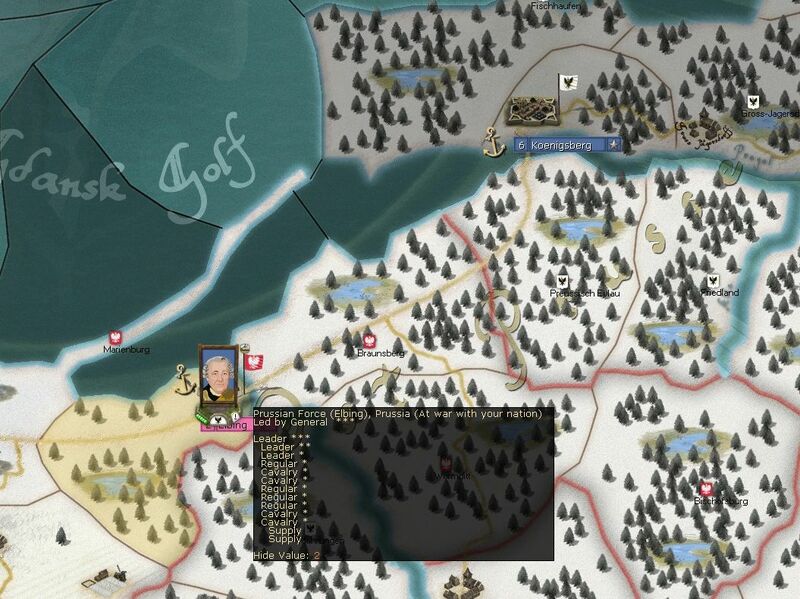 You can also spend EP to gain more Swedes, the 25EP 'large reinforcement' brings 10 brigades (around 30 battalions) but with no corps commander, so you will need to send someone with the 'HRE' trait to help out with the command structure. Conscript companies come from cities you own, from Prisoners of War and returning losses (differential rates for those lost to attrition and those lost in battle). For Prussia this is an easy source of new units (as they have no cash constraint), for Austria, your cash problem limits the ability to draw these down. However, they are 'generic' and can be used by all your nationalities. With these you can build almost any regular battalion – infantry, cavalry, guns, supply wagons or specialists. Or you can build depot battalions (either regular or elite). Once these 'finish training' they go into your replacement pool and allow you to rebuild losses (but only for the appropriate type of infantry). For the most part, I concentrate on depot battalions as you have a shortage of brigadiers and can't often make the best use of the field army you have. 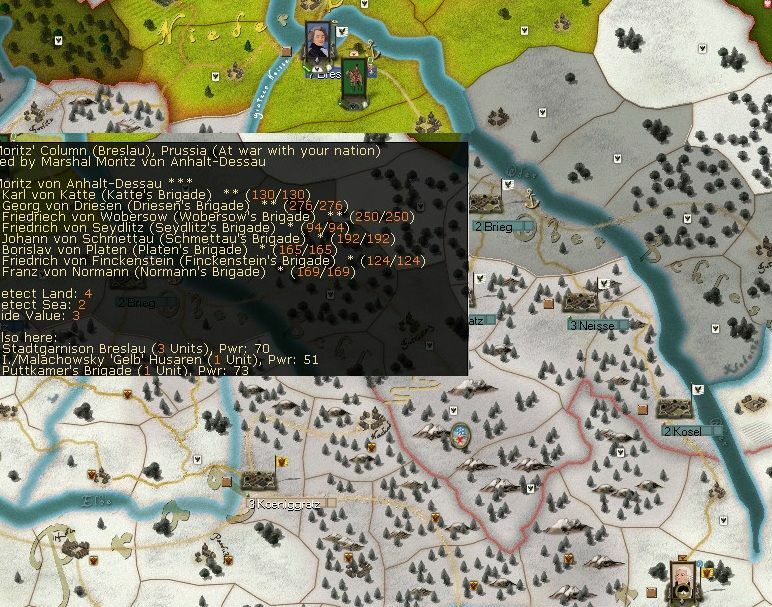 You can, for example, build about 8 depot battalions for the HRE, Bavarian and Wurtemburg army at Nuremburg so when it unlocks it is quite strong. But this rather depends, if you have had a brutal autumn in Bohemia defending Prag, then quite often the Austrians have to be your priority. Actually I very rarely use the other map views as they are not that essential in RoP. But this shows how Wien is critical to my war economy. In truth if this is ever threatened then I lost the game a long time ago. Now in theory this means you can wage economic warfare, in truth I scarcely ever look at this map view as by the time I am taking or losing economically critical cities its also probably a clear victory in any case. One piece of trivia. A large problem with the Austrian side is a lack of artillery (except for the Russians, who are, as is traditional, awash in cannon). 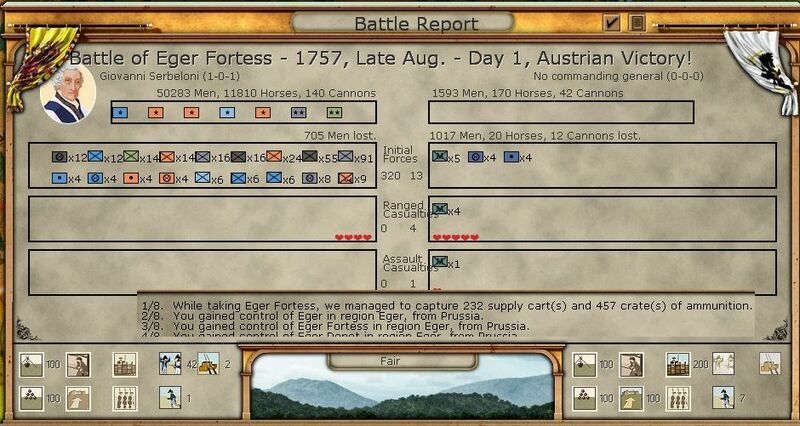 In particular the Austrian start with just one siege gun unit (and I have a habit of losing this – very careless). Now Sappers are good substitutes, they are a lot cheaper than siege guns (which cost 300 units of cash compared to 90 for the Sappers), but also give a +1 on the chances of making a breach. So I'd ordered up this bunch of happy chaps, and they are now off to join that French corps I sent into Bavaria a while back. The main French armies arrive north and south of Wesel at the start of the month, and at this stage scouting implies only limited opposition (a bit of a false illusion as I know there is a 20,000 or so Hannoverian army in the region 'observing'). My original plan had sent Broglie to invest Wesel and the other 2 corps rush for Munster. However I had an outbreak of common sense as I worked out there was no way would I manage to take it before my supply ran out. So they all fell back to help take Wesel (where I can easily resupply from Dusseldorf). Now as it happened, this was a good idea all round as Freddie arrives. 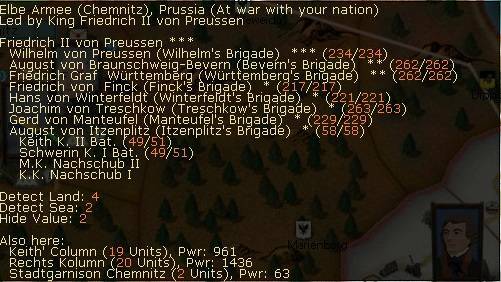 I don't think he has many Prussian units with him but even so. I have another corps moving up from the Lower Rhine, Wesel is very easy to defend, so I'm glad I've pulled back for now. 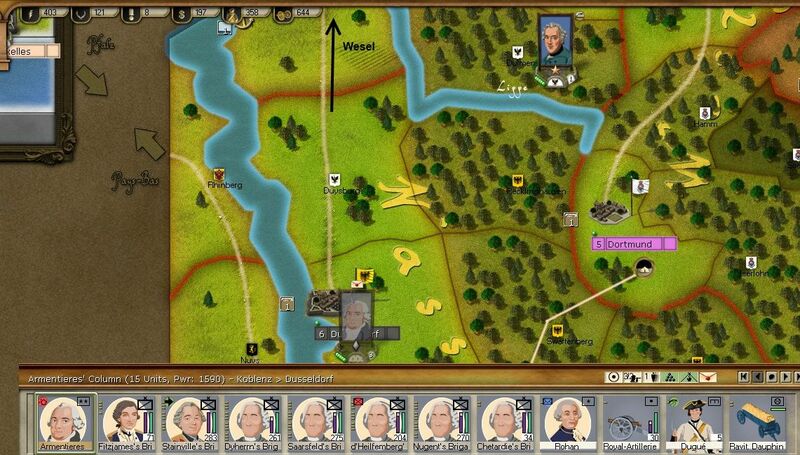 May ends with the fall of Wesel which is handy as a level 3 depot well protected by rivers. 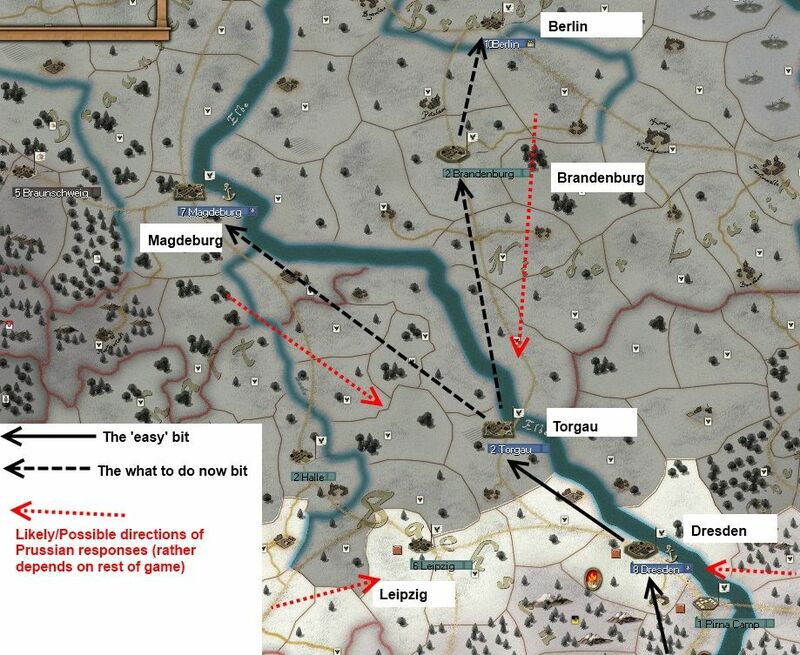 It gives me a useful base of operations as it seems as if Frederick this time is determined to protect the Rhineland. If so, I can wait a while for fresh forces to move and build up the army to around 90,000 (from the 50,000 I have at the moment). Not only did I gain the city, but more NM due to the size of the garrison (I guess this was the infantry force my cavalry beat up in late April). 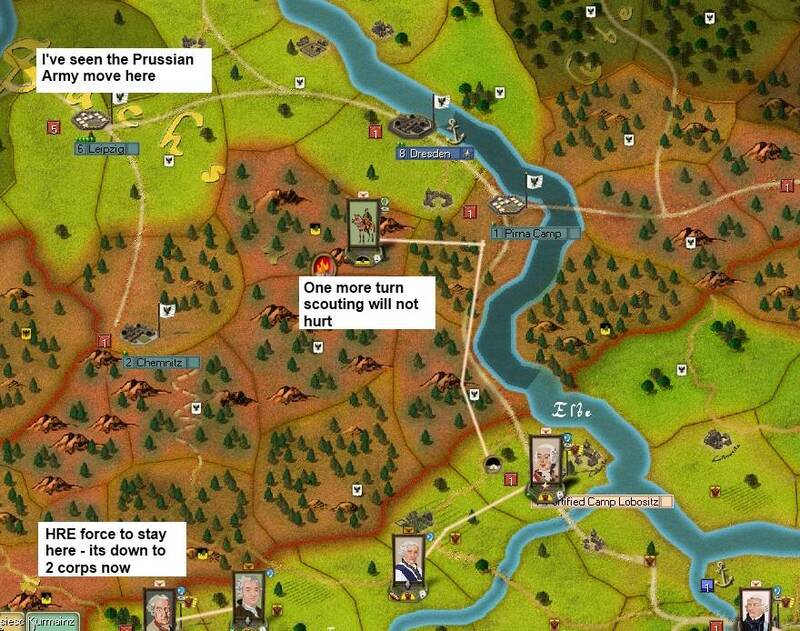 Well May opens with a not unexpected, but rather worrying Prussian move towards Prag. My guess is we will have the traditional move to Ritschan followed by the equally traditional bloodbath at Prag. In outcome the Prussians swung a lot more to the south at Pitbans and my second fear was that Narwhal was going to gamble on his supply lines in order to wreck one or the other of the corps marching up from Wien. In outcome, they fell back to protect Saxony. Again, this indicates that in RoP, often not moving and not responding can be effective. Over in Bavaria the Prussians move onto Bayreuth as the still locked Bavarian army watches with only mild interest (obviously they are not opera fans). This is from late May, the French at Wurzburg are recovering organisation from their march. Also I don't want to risk them till I know what the Prussians have planned. Even locked, the Bavarians are strong enough to defend Nuremberg. And fortunately they finally decide to take an active part in the war in June. In the meantime in Pommerania a large Prussian corps has arrived to threaten my still completely locked HRE formation at Rostock. I don't think this will end well, as you can see they are menaced by a force at least 7, probably 10, times their strength (and they don't unlock for another 4 turns). And the very first Russian cossacks move in East Prussia. I'll scout Memel, check there is no field army at Koenigsberg (I'm pretty sure there isn't) and then send these into Poland (they can draw supply 'for free' from Gdansk, Poznan and Esping). This is nice, but someone has to start paying the Russian army. So May passed off again with no main actions. I've taken Wesel, my current plan is to wait on key sectors. 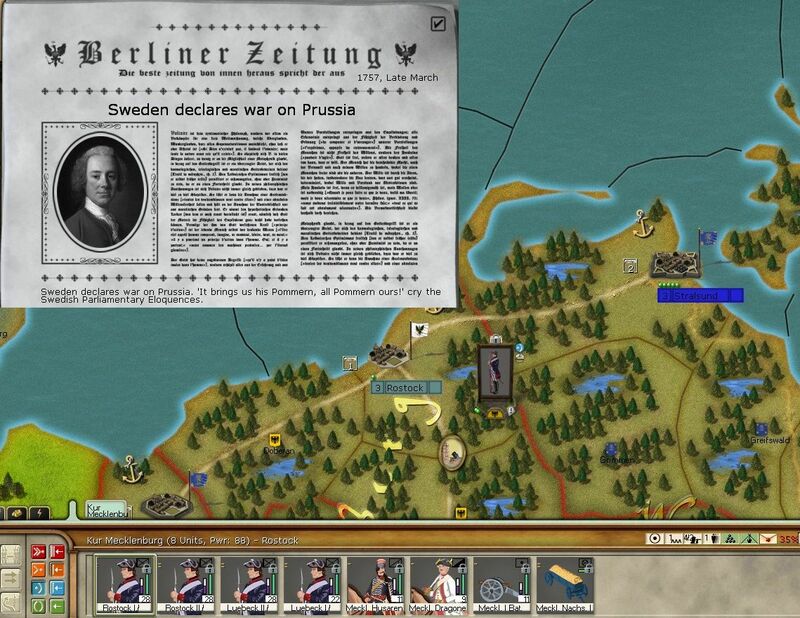 By the end of June the Bavarians should be able to invest Eger, there is a fresh French corps starting to move up the Rhine, 3 corps of Austrians marching to the front and the Russians (underpaid) are on the way. To my way of thinking I gain nothing from big battles now (except to defend key cities) when I will be a lot stronger in 4-5 weeks. In general in this game, neither of us have been too keen on risking a large battle. For various reasons, if you suffer a really bad defeat (ie a long attritional battle or retreat to a bad position), RoP can be very unforgiving and it becomes hard to recover. Not least as a player will then do all they can (sensibly) to maximise that gain. So in part as the various forces facing each other are relatively even (in the summer of 1757), and in part due to some caution, this remained a war mostly of menace and manouver for a while. Again, these turns were mostly cautious moving and watching. I'm still building up in some sectors so quite prepared to wait. The French consolidate at Wesel and await new forces. Equally it seems that Frederick is not too sure what to do. 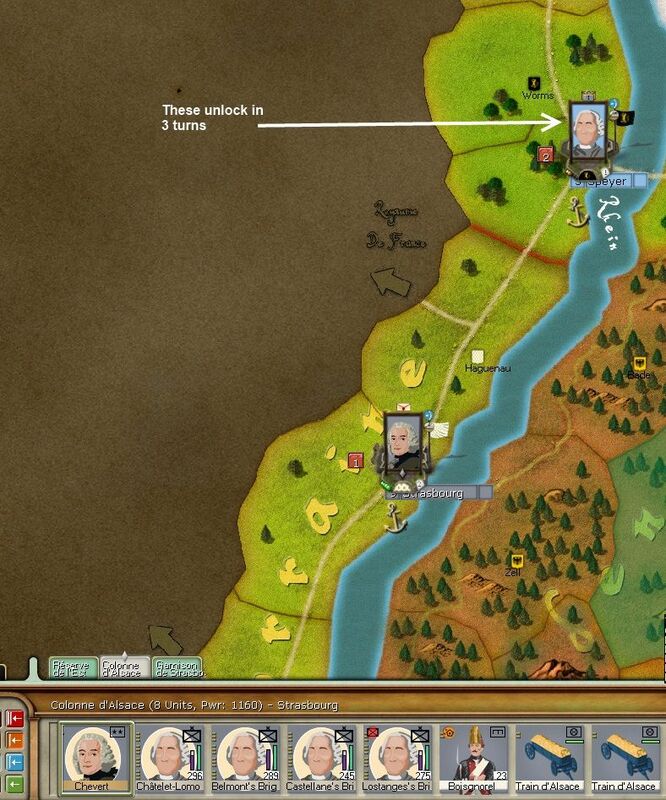 Due to the rivers, Wesel is easy to defend, unless Narwhal is prepared to expose his supply lines to attack. 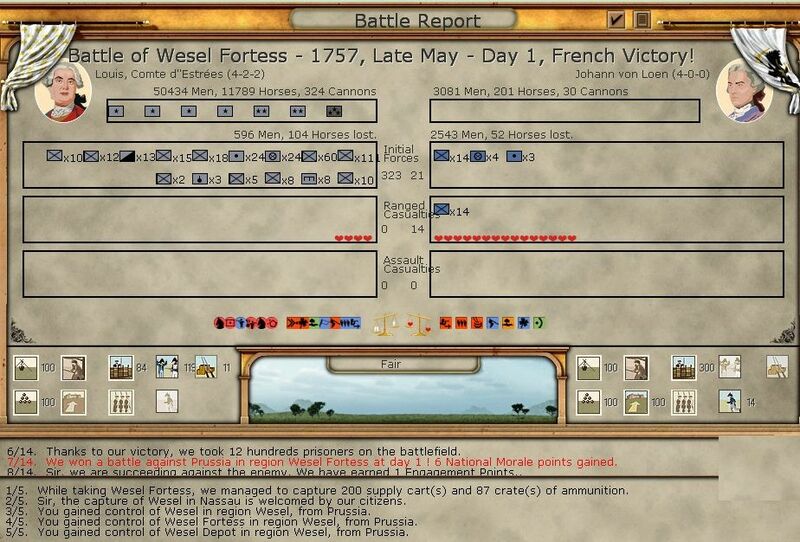 In the meantime, Soubisse's Army of Germany unlocks and starts to move to join the forces at Wesel. 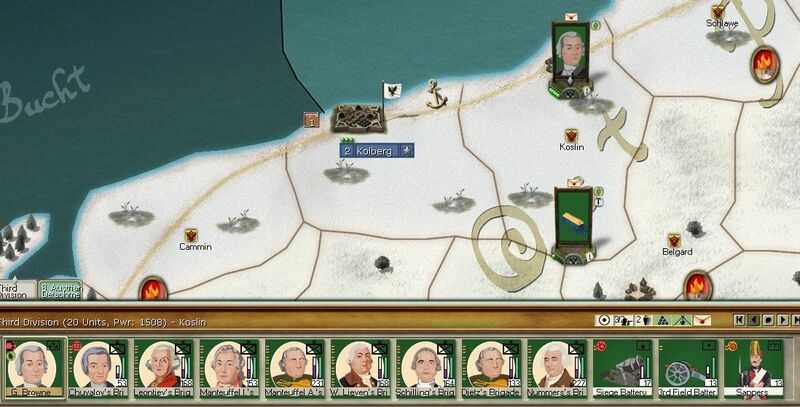 I have another 2 corps due soon to unlock at Paris. Up in Pommerania the inevitable happens to those horribly isolated HRE units, not that there was much I could do to save them. Equally more of the cities around Hamburg fall, and, again, there is not much I can do to resist. In the latter part of June, the HRE/Bavarian army at Nuremberg wakes up. I need to take back Eger, partly to clear the road into Bohemia and partly to secure Bavaria in case the Prussians return to the offensive. I've split it into 4 columns (including the HQ stack) using Rutowski (Saxon and with the HRE trait), Serbolini (Austrian but also can command HRE units) and Hohenzollern (HRE). The HRE command ability is very useful as it means those officers can command brigades or corps of any nationality (except Russians and French ... maybe I'm not sure about this). 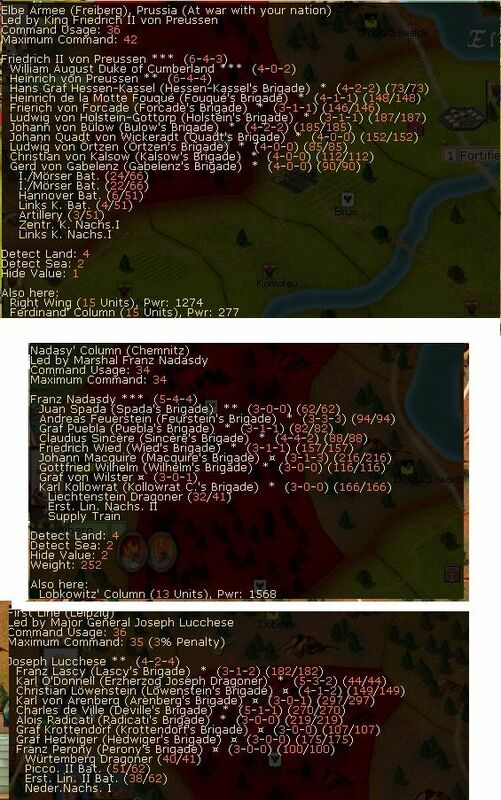 So really help in integrating the HRE, Bavarian, Wurtemburg and Saxon units with the main Austrian army. 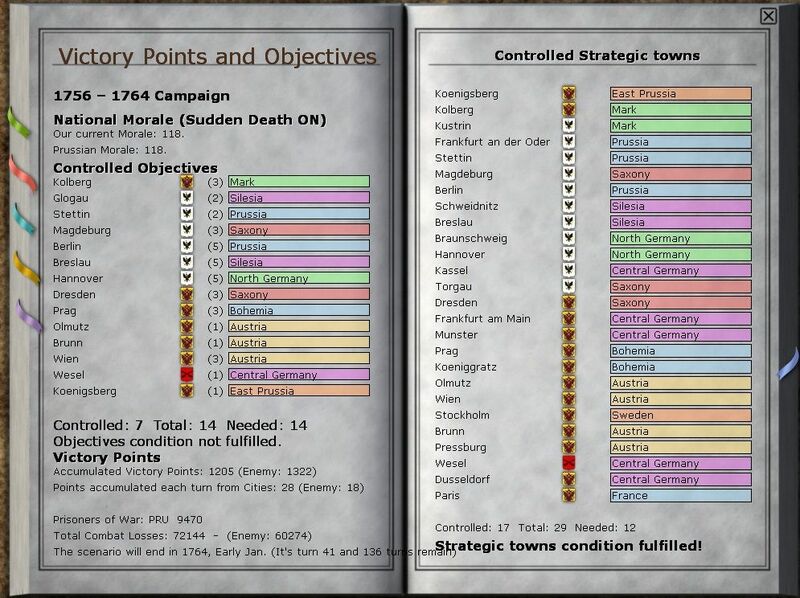 With this, I order Daun and his 4 corps to take the depot at Lobositz. 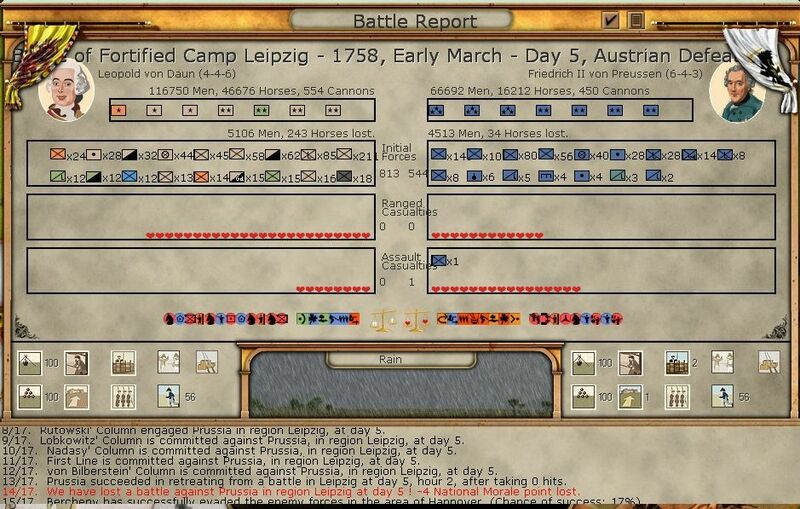 In this game, I really used a lot of scouts and it was invaluable in spotting Prussian movements and changes in their OOB. The only force that could arrive before I had a suspicion something was up was Moritz's pure cavalry corps . 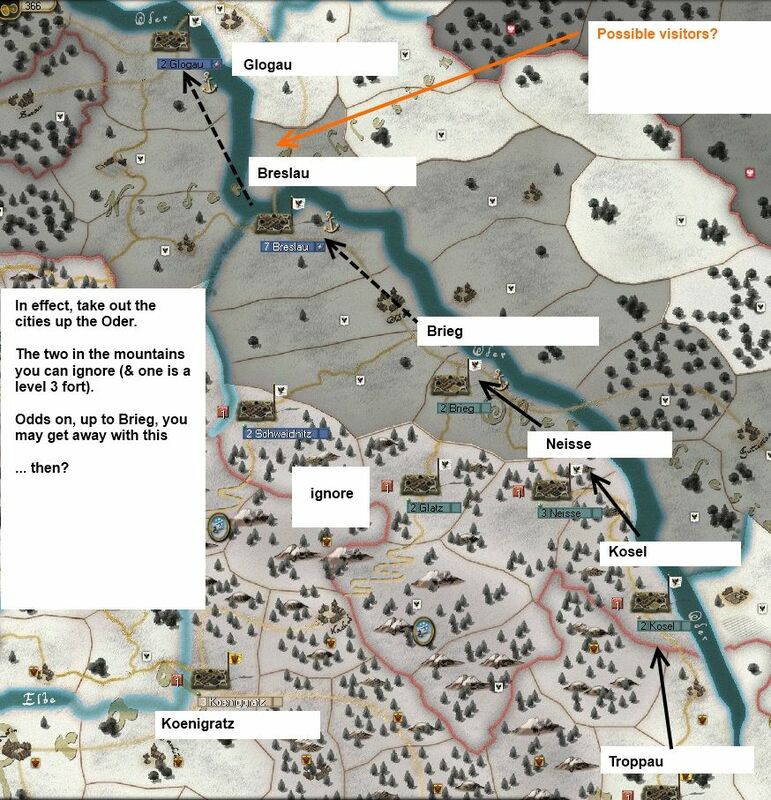 Once the Cossacks are available, especially operating out of Poznan, I had coverage of all the key routes around Berlin as well, at this stage I was more concerned with what might have been one move away from my armies. So apart from me taking Wesel, there is very little change in the overall situation. I'm well behind on VP score (which is to be expected, but I've seen much worse). 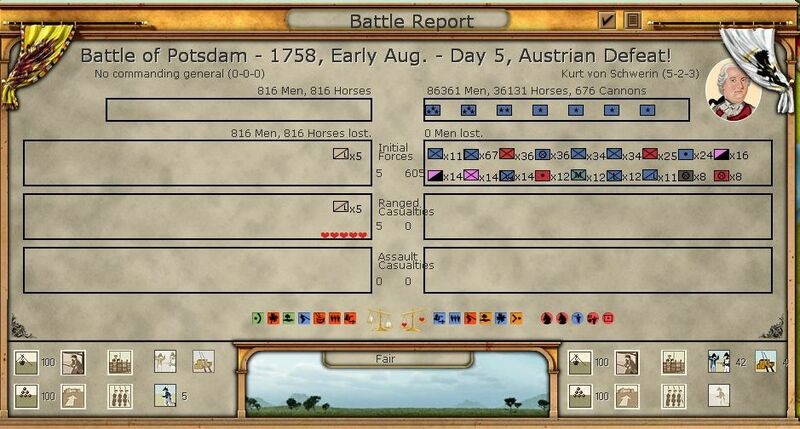 The losses are low (by my experience), reflecting the lack of major clashes between the Austrians and the Prussians and this is reflected in the relatively high and even NM scores. The conventional view is the Austrian side wants early battles to wear the Prussians down. I now am starting to think its the other way around. Early battles lead to lost Austrian elements (so VP gains) and potentially leave Daun's main army small enough to be finished off later. 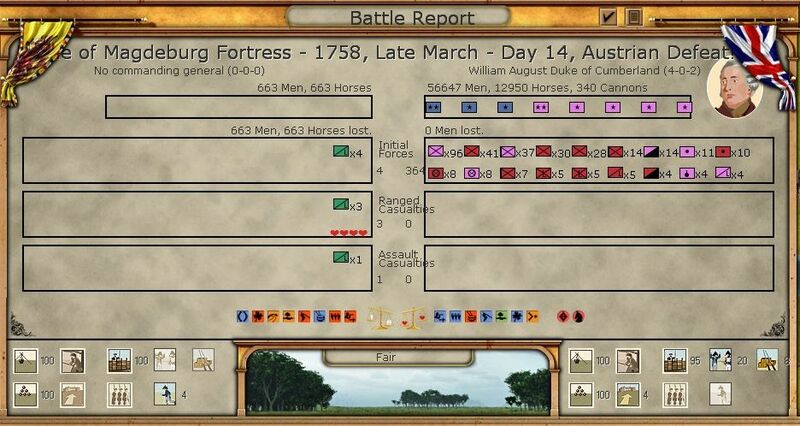 I think I'm starting to see the benefits of the lucky start with the Saxon break out and no major battles in 1756. In strategic terms, I'm happy to sit back at the moment. 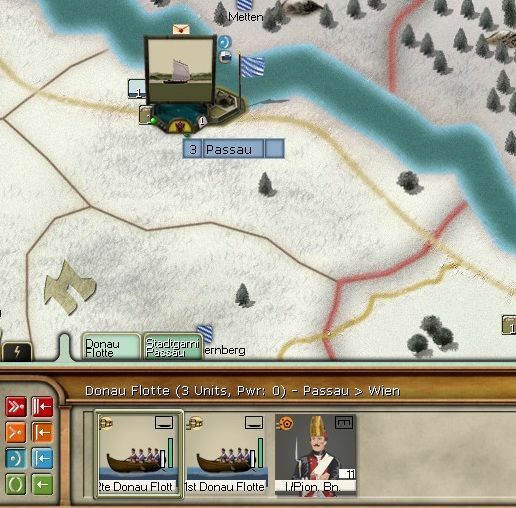 The French army at Wesel will be 90,000 or so strong in a few months (about 50,000 now), the Russians are lumbering towards Koenigsberg, and I've built up Daun's army with the winter reinforcements. 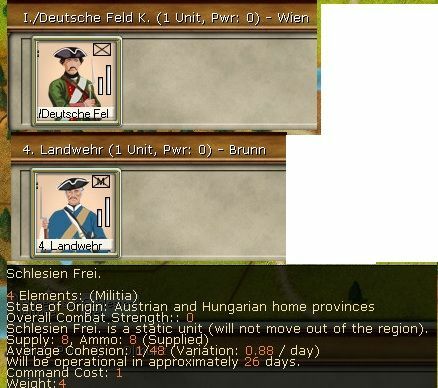 However, I'd like to wait for the HRE units to take Eger before moving into Saxony, then I can press with 2 relatively powerful columns at the same time. I've not shown it, but Charles and Piccolomini are moving east for a campaign on the Oder. That is the one sector were I end up being a bit careless , with, as we'll see, predictable results. Thanks for preserving the AARs - I have followed a few of your on the Paradox site and appreciate the time and effort it takes to post them. DanSez wrote: Thanks for preserving the AARs - I have followed a few of your on the Paradox site and appreciate the time and effort it takes to post them. 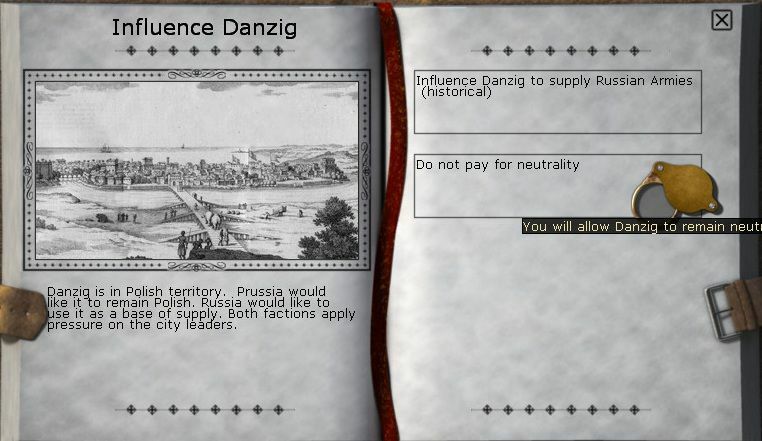 One consequence of Russia's active entry into the war is the Danzig decision. Now this is a nice zero-sum game, I can pay money to make it into an active base or not bother. Narwhal can pay money so this cannot happen (if I pay and he doesn't then it becomes a Russian active depot as opposed to just a safe place to rest). I made the gamble not to bother (remember that cash is a major constraint for the Austrian side) and I think Narwhal paid up. The war proper starts in East Prussia with Mishukov landing at Memel. There is nothing the Prussians can do about this, so this siege will go ahead till the port is in Russian hands and it duly falls by the end of the month. 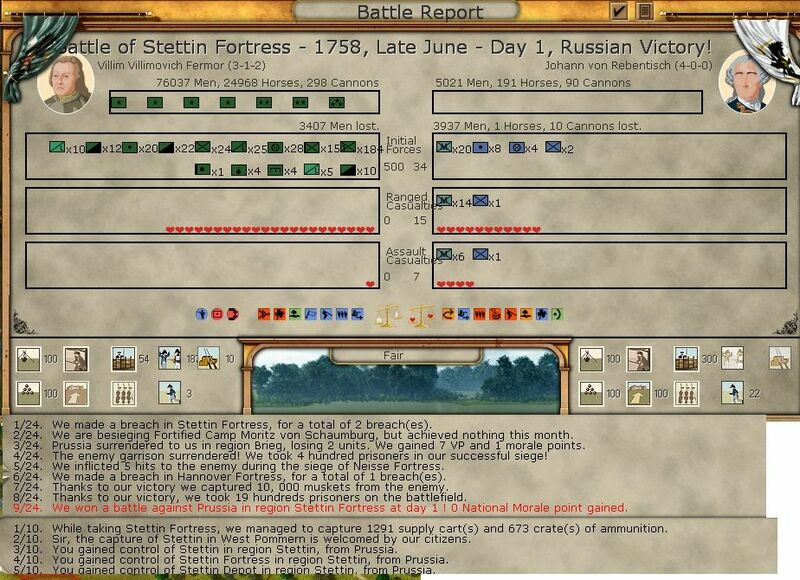 By late July, the main Russian army arrives. As usual this is horribly organised and a first job is to ensure a decent OOB. One key element is the formation of the 'Third Division'. 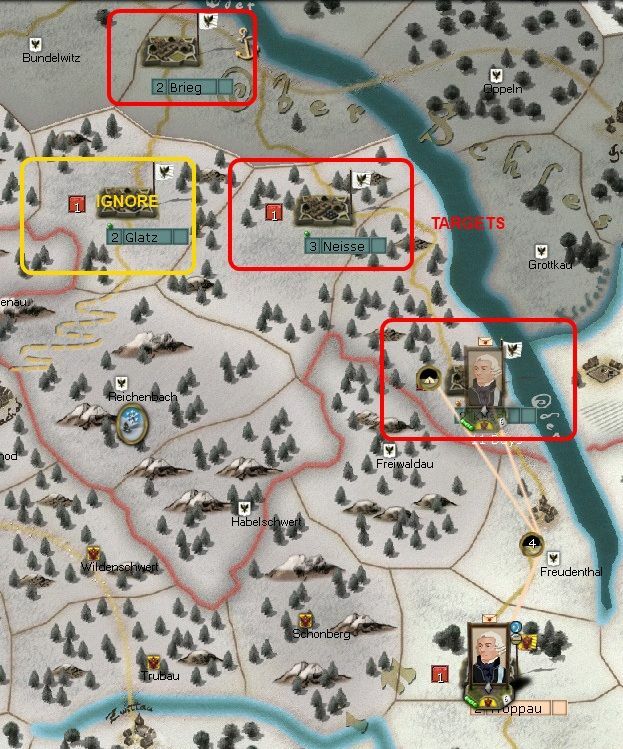 In total this has +4 on any siege roll due to the artillery in Chuvalov's brigade, the siege battery, Sappers and howitzers. If I'm lucky this will blast through various fortresses on the road to Berlin. The rest of the army is really in case of any conventional battles, which I don't expect till I reach Kolberg. 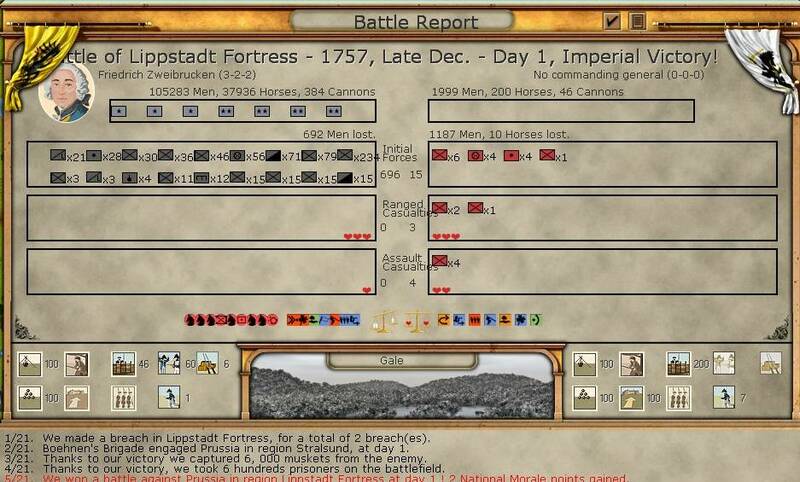 As you can see the impact is devastating, as last turn that corps had a power of about 1500-1600. At least it will recover over the next 3 turns. 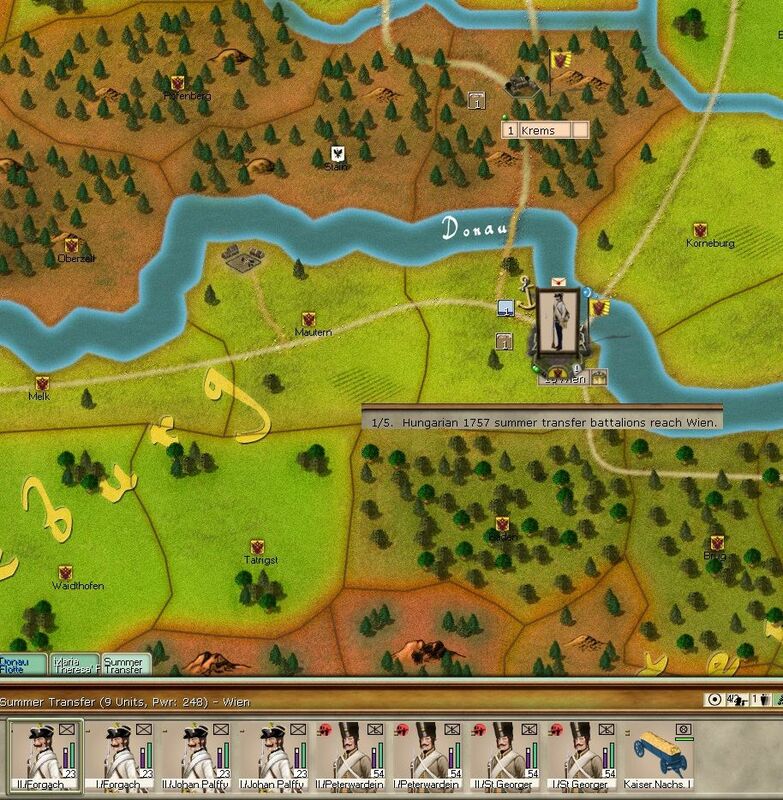 The main Prussian army waits at Dresden and being cautious I have Daun's army in defend mode. In order to deny Narwhal manouver space, Nadasdy is ordered to Budin (the province between Lobositz and Prag) and Kollowrat over the Elbe to the east. The idea behind this is that Nadasdy will 'march to the sound of the guns' if Lobositz is directly attacked but equally will make it much harder for Narwhal to manouver around me, if that is what he tries instead. Kollowrat is more exposed (I believe the 'march to the sound of the guns' routine does not apply across an unbridged major river), but it seemed a useful deployment if Moritz's cavalry were sent raiding down the east bank (as has been known to happen). 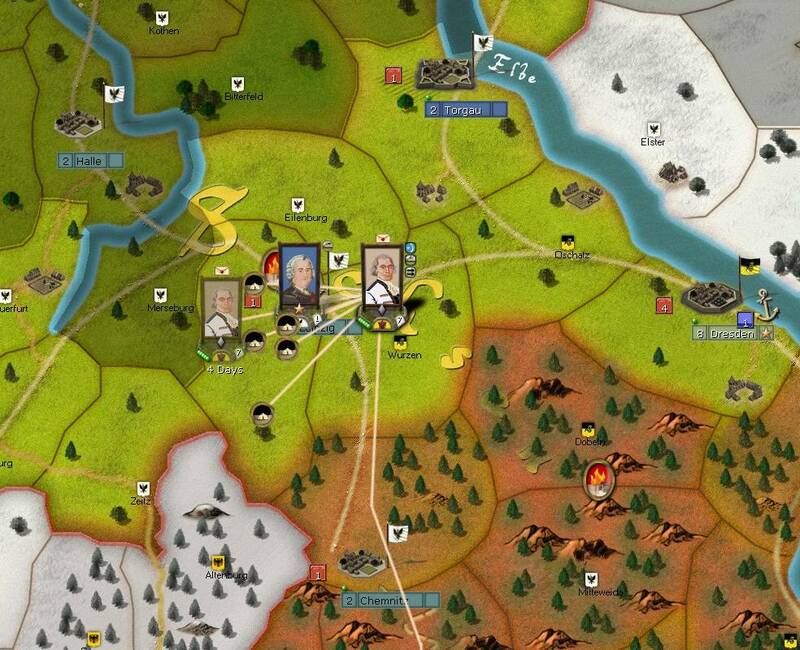 By the end of the month, the HRE army from Bavaria starts to siege Eger. 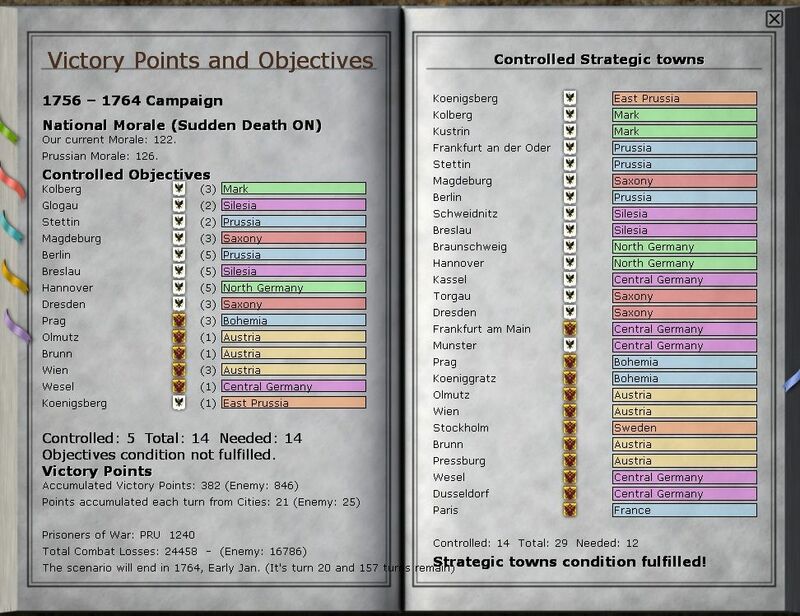 I'm happy to sit back till that force is free, and I can either use it as a column in its own right, add some to boost Daun's army even more or send some over to the Oder to ensure that offensive is fairly secure unless a massive Prussian army is deployed to the region. 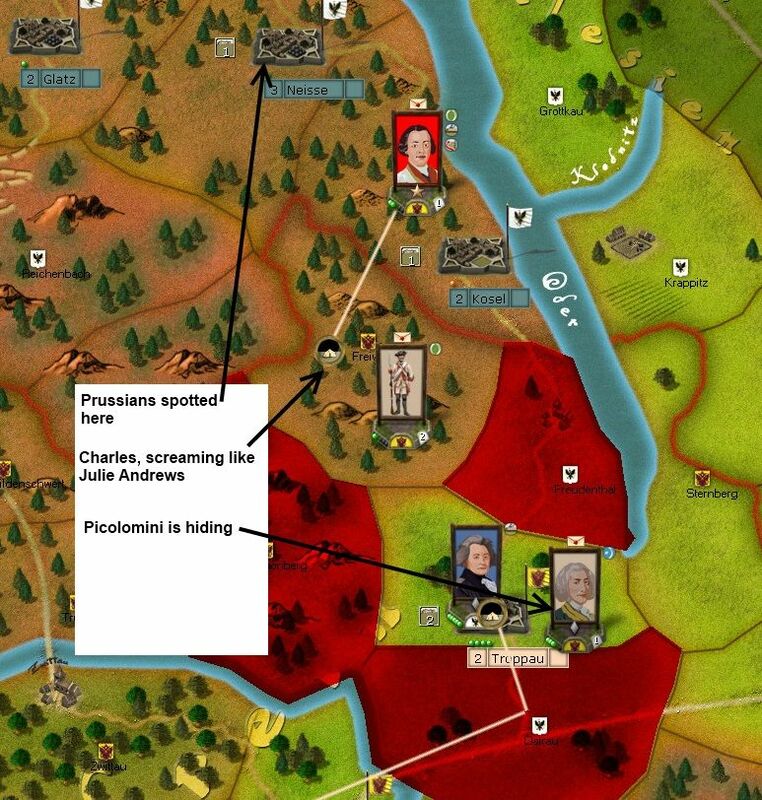 In an attempt to create some pressure, and maybe break up that stack at Dresden, I decide to send Charles to Kosel to start clearing the Oder fortresses, Picolomini is about 3 weeks marching behind him. By early July, Soubisse has reached Dusseldorf and I've split his army giving most of it to Armentieres, who will rejoin L'Armee Francaise at Wesel. But here, I'm briefly content to wait. 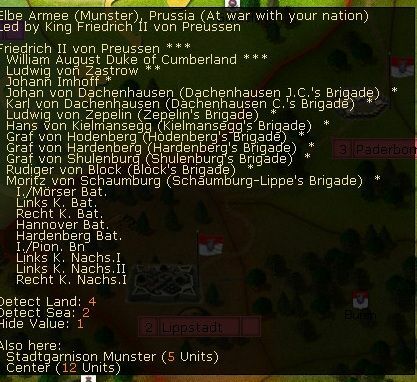 Once all my formations are here, I'll have 5 corps and 100,000 men, quite enough to overpower that Prussian column protecting Munster. In over VP terms, not much changed in July, losses were minimal (a few cavalry skirmishes) and I'm content to sit and build up. I'll have five corps at Wesel soon enough, the 3 HRE corps available in Bohemia (once Eger falls) and the Russians will move on Koenigsberg in August. 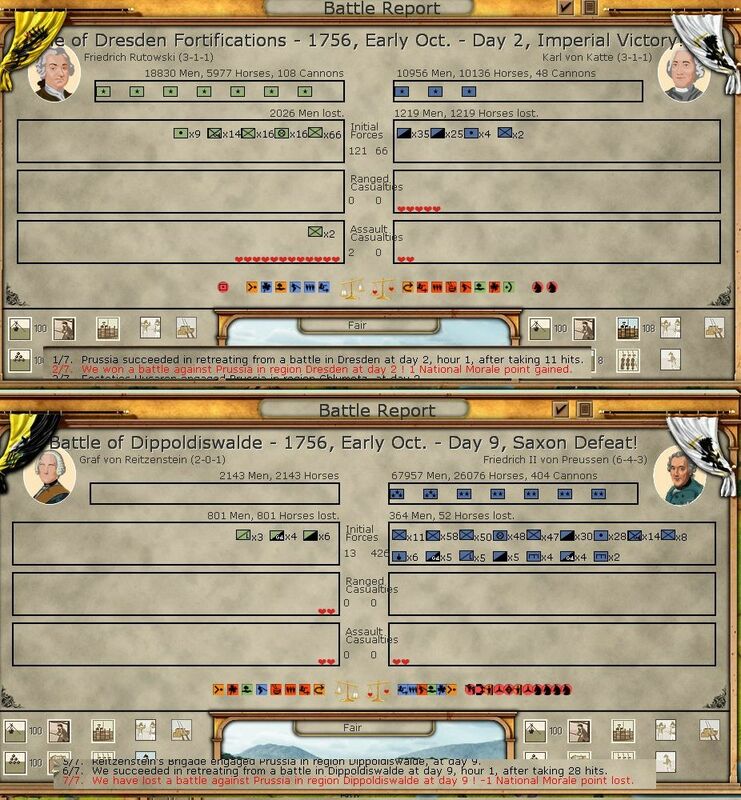 Now I have 4 corps at Wesel its time to try and hassle Frederick. 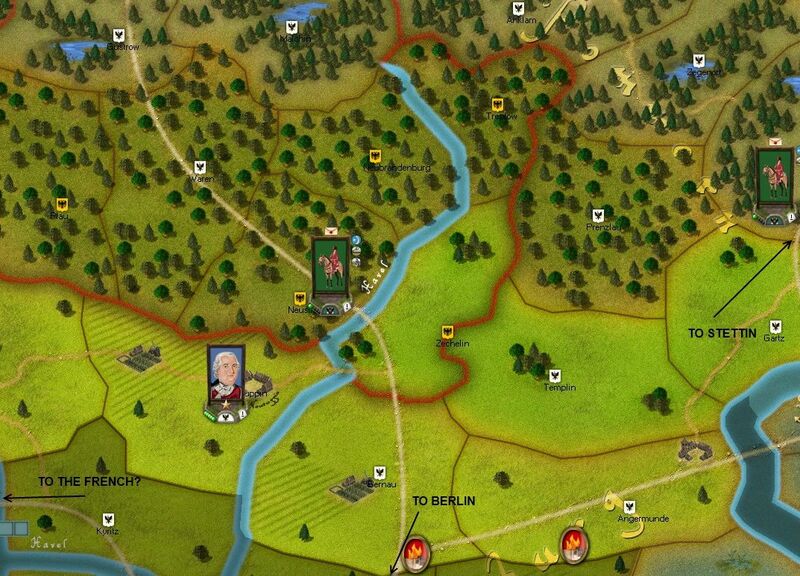 My plan is to keep one corps at Wesel, send two to Dulmen and the fourth to stay one province north. In effect the centre will involve a battle with all 4 formations, on the flanks with 3 (due to the 'march to the sound of the guns' mechanic). A key part to this is that each corps is in the stance of defend at all costs, not attack. My logic is that if some have attack orders I am vulnerable to a corps commander going inert at a critical stage and being hit piecemeal. That stance will trigger battle and if I win, I hold the ground, even if I advanced into the province. It will take 17 days to reach Dulmen (2 & 3 are inactive) but at no stage is any corps isolated. 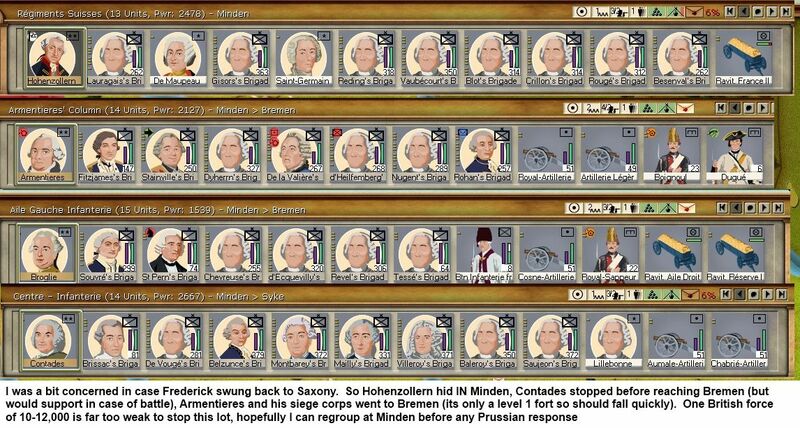 So even if Frederick guesses correctly, he'll have a 1 hour advantage and then the bulk of the army will respond. As it is, he wasn't there when I arrived. I suspect Narwhal was probing for a weakness at Wesel or to catch something weak around Dusseldorf. Well I'm content to complete my move. Once I have the central portion deployed in Dulmen, Armentieres can move onto Munster (since Dulmen is adjacent, he'll be perfectly safe). I doubt the Prussians will go for Wesel as if it fails, & it will given my stance (even if Narwhal 'wins' the battle), the column will be very vulnerable to being encircled. So I guess he'll fall back towards Hamm or try to defend Munster. In the north, there is much less movement. The siege at Stalsrund carries on in its leisurely manner and Narwhal clears my last HRE held cities out. Again, very little I can do about this. 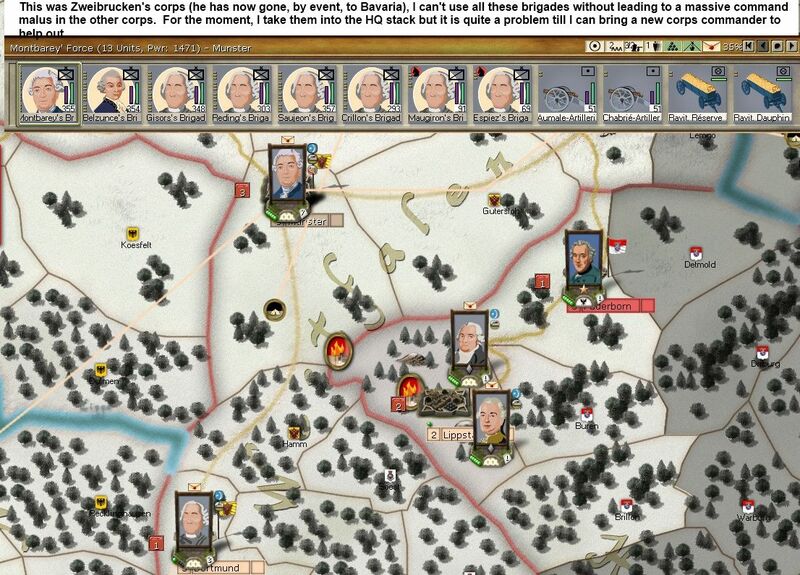 More importantly, 3rd Division does what it is designed to do, and by late August I have a breach at Koenigsberg. With some luck it should be mine by the end of September and I can redeploy the Russian army to Gdansk before winter sets in. 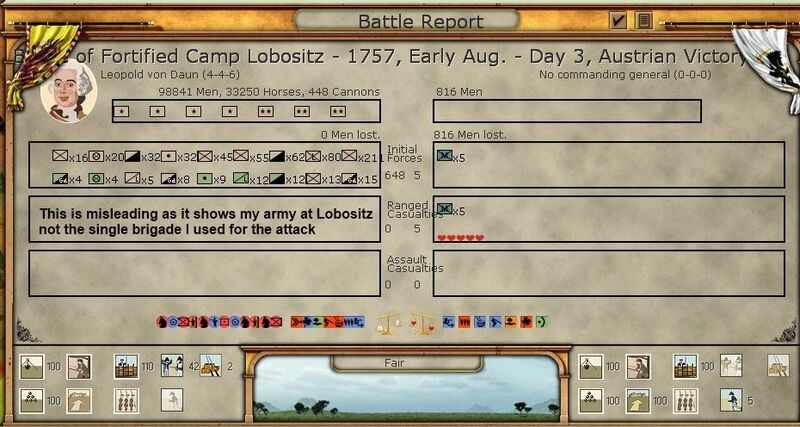 By early August, I risk putting a single brigade into an offensive stance as I want the depot at Lobositz. However, I also decided on a major re-organisation of my defence structure to avoid Kollowrat being isolated. My new structure has 6 corps (once Hohenzollern arrives), with at worst 3 corps self-supporting, at best all 6. Also the Elbe is a major barrier to a contested crossing as it is a major river. Hohenzollern will arrive at Lobositz by the end of August and will be integrated into Daun's army. Originally my plan was to use this 6 corps force to move into Saxony, in the event, given the disaster on the Oder (below), I ordered Hohenzollern over to the east to reinforce Charles. Equally by the end of August, Eger had been retaken, so I am well placed to move into Saxony before the winter snows block the roads. Between Daun's 6 corps and the 3 in the HRE force, I have around 180,000. 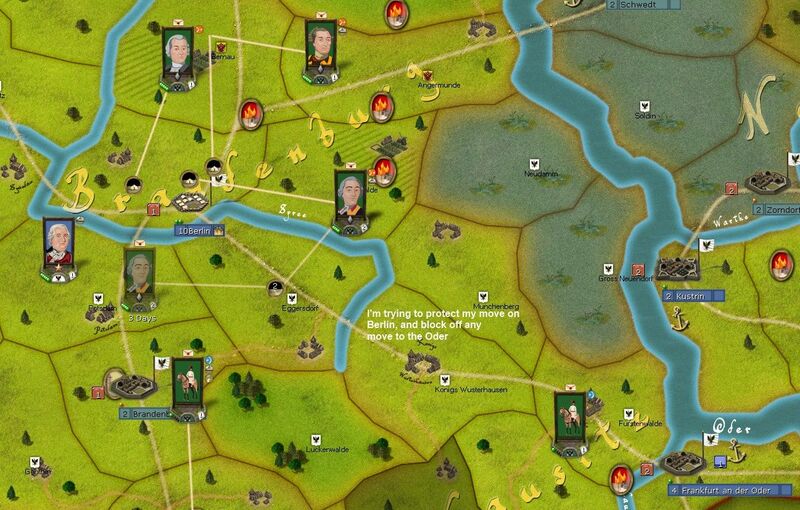 Even if I send 20-30,000 over to the Oder, I think that gives me a degree of security to now push onto Dresden. So, we turn our attention to the bad news section. Not least I seem to have taken no useable screenshots (blame panic). At the start of August, my scouting Hussars spotted a Prussian corps under von Moritz hiding in Neisse. 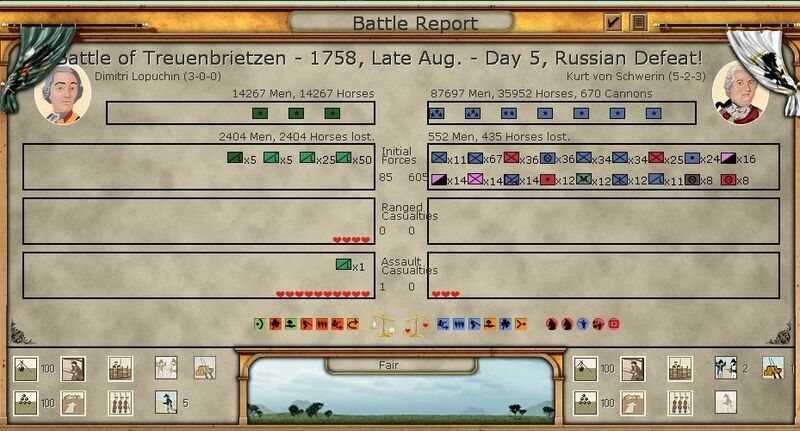 Now I have intermittent Cossack scouts to the north, so my guess was this was the Prussian cavalry with no infantry (I think I would have spotted a force moving at infantry speed in better time). 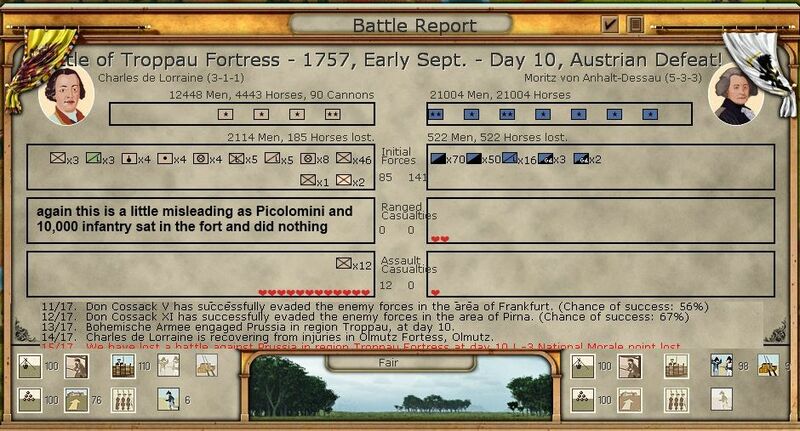 So, I ordered Charles to fall back to Troppau, but if this was cavalry he wasn't going to make it in time. So he went into the most passive of stances, if he was caught hopefully he'd retreat with minimal losses. Picolomini has arrived at Troppau. I didn't fancy his chances in open battle so I put him in the fort. If this was a cavalry force, they had no means to prosecute a long siege. In the event, 2 infantry battalions were caught at Troppau (I'd forgotten to cancel its orders), and yes, it was von Moritz with a purely cavalry corps. Fortunately, Charles had managed to run up a mountain squeeling like Julie Andrews. But he, and the valuable siege guns, are very vulnerable, for the moment Picolomini is safe. This is bad but redeemable. What I can't afford to lose is the siege guns (they are the only ones in the Austrian army) as not only would that hamper me, it would give the Prussians the means to conduct a siege. But clearly my attempt to wage a campaign on the cheap and at speed on the Oder has failed. 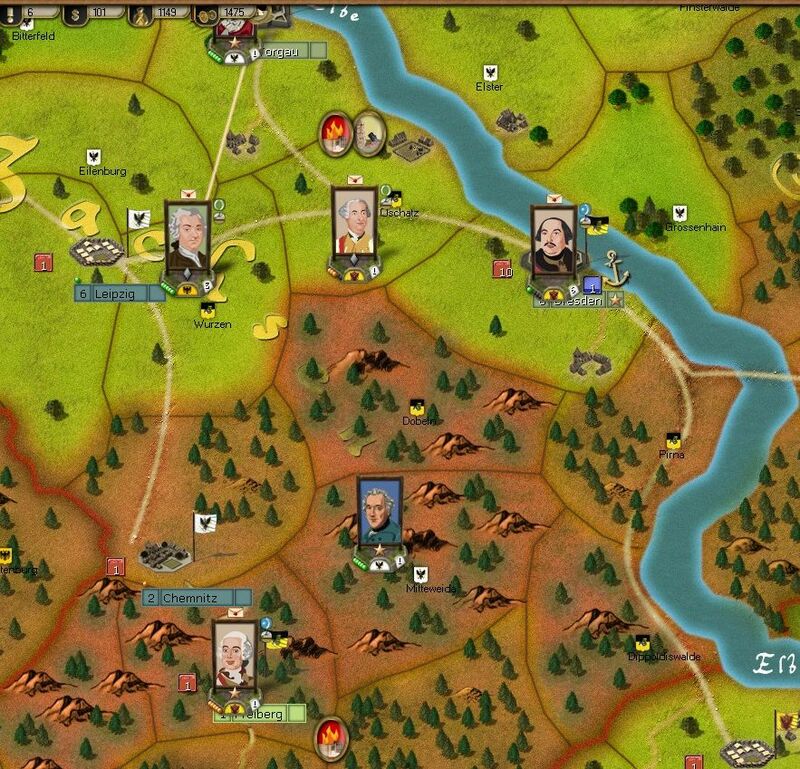 My next step is to decide how much of the force now with Daun in Northern Bohemia I need to deploy over here. Not just to sort out this mess, but commence the fortress campaign with some security. Stances are one of the complex bits of the AGEOD system. Now the manual and the tool tips do a good job of telling you what each does, but are less use in guessing what to do and when. So these are some rough ideas that I have worked out and make some sense to me. You have a very passive stance (you can see this with Charles in the last screenshot, the little indicator is green). Usually I use this for scouting (don't want to be seen, don't want to fight), however, as with Charles above it can be useful for a combat force too. If you know you are going to lose, it tends to make you run away very quickly (if you are really lucky, as I was, even on contact). So its not a bad idea to preserve a force in deep trouble, as long as you retreat somewhere you can escape from it can be very useful. You have 4 defensive stances (this shows as a blue indicator). These range from don't retreat unless you are routed to falling back after 1-2 rounds. 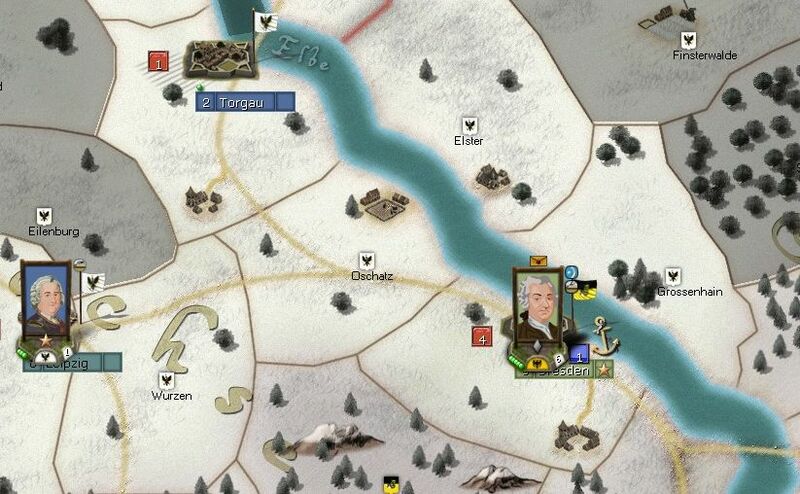 The first for the Austrian side is incredibly useful if you need to hold on (eg if the Prussians attack Prag). Oddly it can be quite aggressive too, if you enter a province and a battle breaks out and you don't rout, you either trigger a multi-day battle (till one side loses enough organisation) or you end up holding a province that your opponent originally had. You have 4 attack stances (orange). Again they range from 'probe-fall back' to 'all out attack'. Really depends on how desparate you are to take a province and how many losses you are prepared to suffer. One use of the probe-fall back stance is to give it to Hussars or Cossacks when you are reasonably confident they won't be in proper action. That way they both scout and take military control (& really muck up the Prussian supply lines). It was the widespread 'abuse' of this (by me) that we solved by a houserule, you can only go into this stance with light cavalry if there is also a leader present. 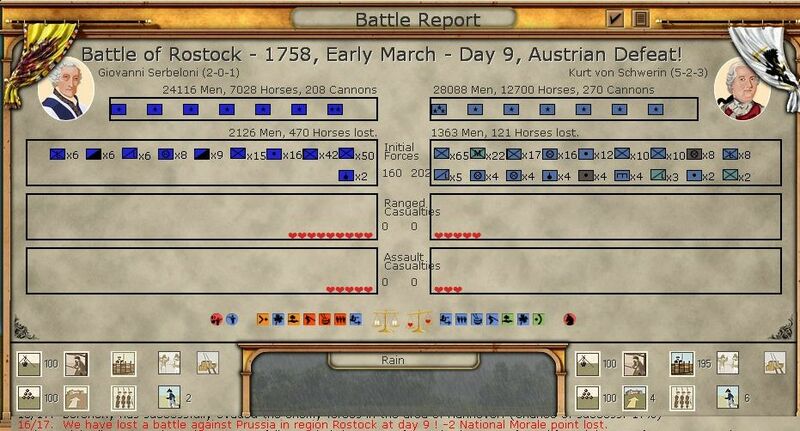 You can see an example in the screenshot of Lobositz, that weak Austrian force in the lower corner is a 'brigade' of Hussars reclaiming military control (and thus reinstalling the fog of war). There is an 'all out assault' stance (the red button at the top of the screen). 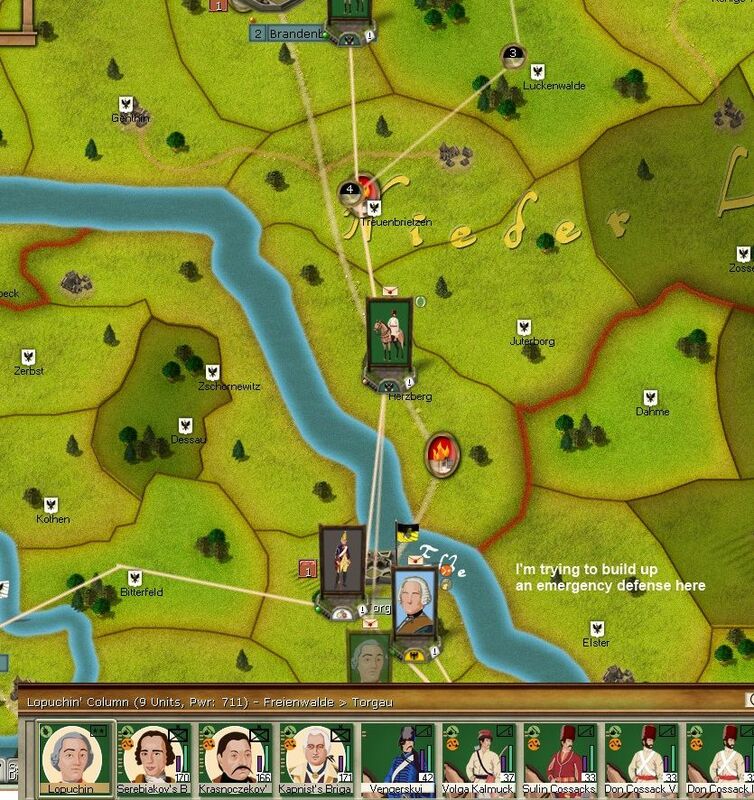 In Wars in America, this allows you to attack structures on the move or at the end of the turn. In RoP, since most cities have some sort of fort, this is less valuable. One use of this stance is if you expect to gain a critical breach in the next turn (ie you have 1 breach on a 2 level fort etc). If you gain a second breach in the turn resolution phase you can launch an immediate all out, attack to the death, assault. Guess what 3rd Division is now ordered to do, in case I manage a second breach at Koenigsberg in early September? 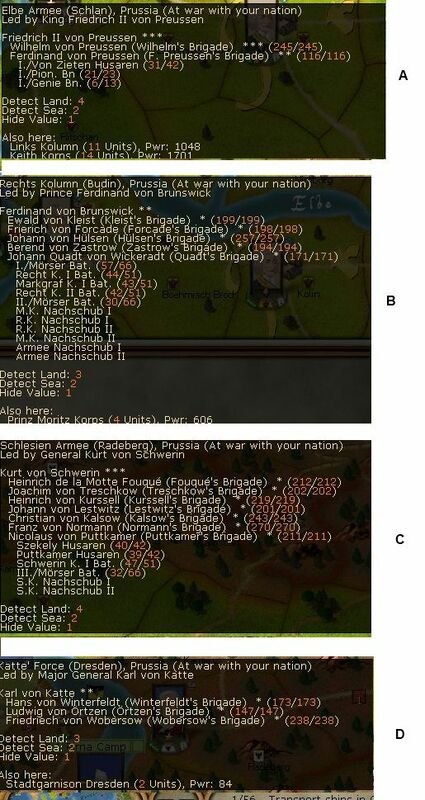 I decide to send 6 battalions to Charles, the others to Daun (this will fill out my current brigades). 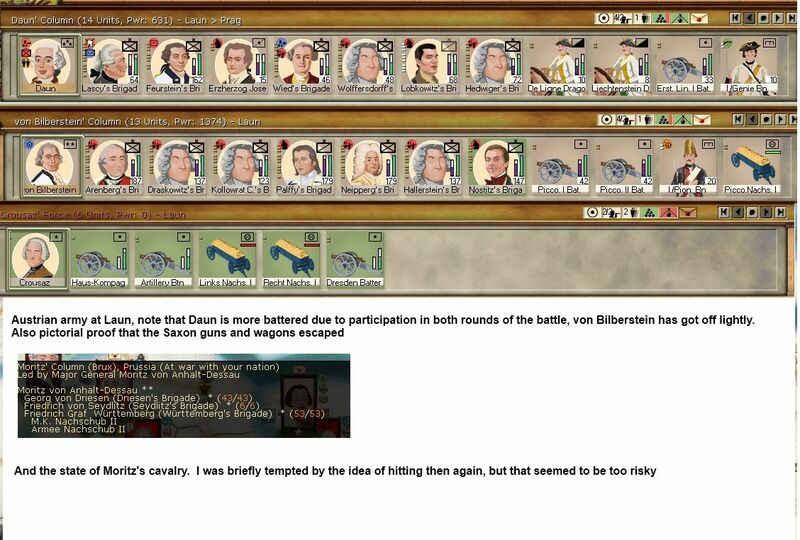 Otherwise I sit back and reorganise to make the best use of the HRE/Bavarian army. I'm also not sure if I need to send more than Hohenzollern to the east to ease the emerging problem around Troppau where things have gone from bad to much worse. 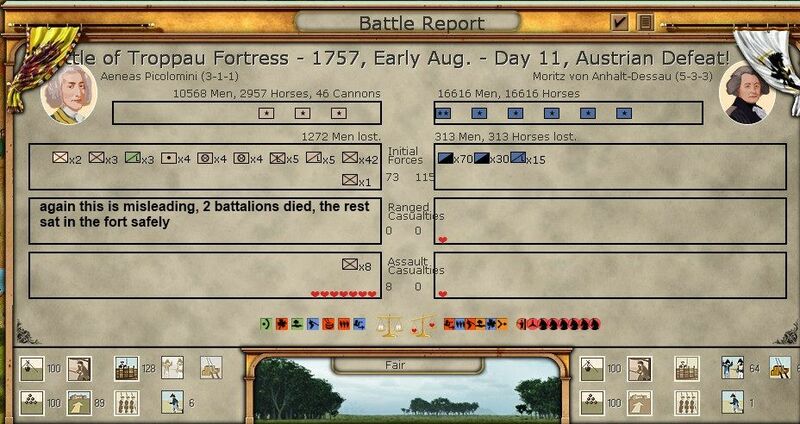 I gambled on the cavalry having to move away (& resupply) and tried to slip Charles' force into Troppau. Bad move. 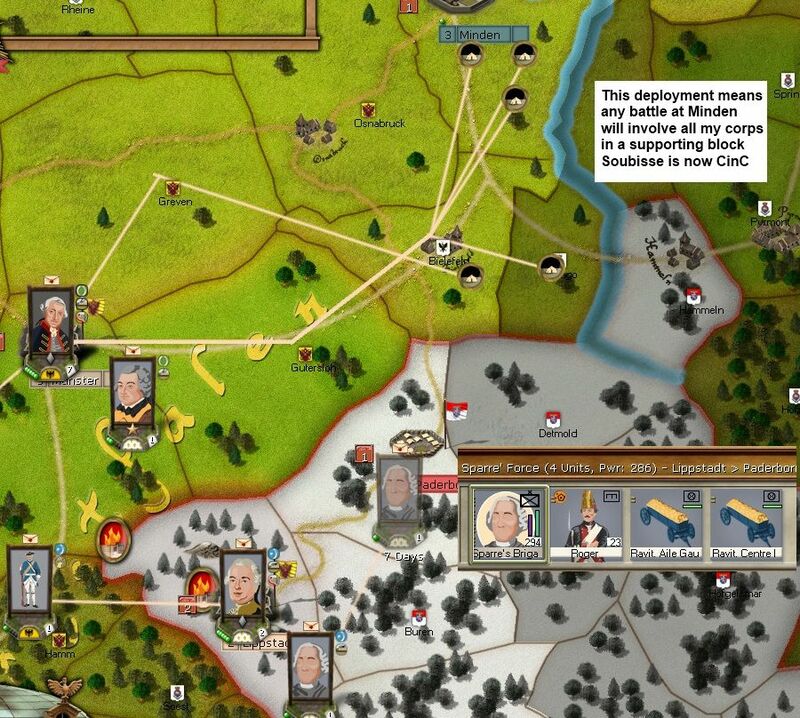 Very bad move – Charles is the only survivor, and lies wounded in Olmutz. Even worse, Narwhal now has some siege guns and a supply train to prosecute a siege at Troppau. Browne is set up to assault and I opened the second breach right at the start of September, and Browne struck at once. One major obstacle on the road to Berlin was mine. As a result the entire Russian army is quickly redeployed to Gdansk and Browne gets to enjoy his new rank. 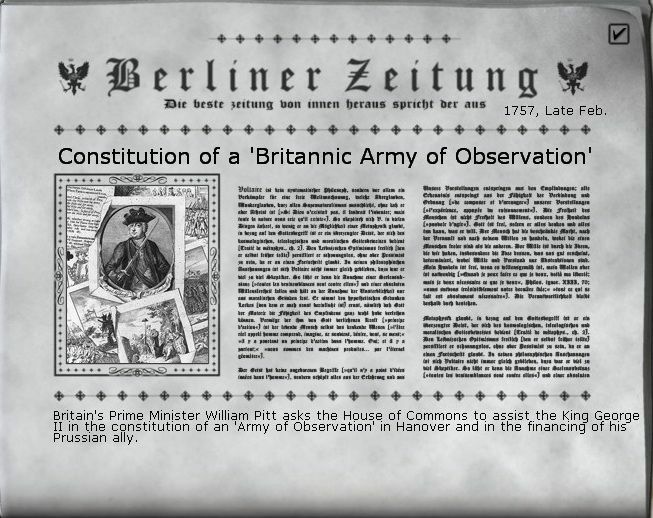 The Observation Corps is still back at St Petersburg and will unlock early in 1758. Those two extra howitzers will make mince meat of any fortress that gets in my way, adding to Browne's already awesome fortress busting division. Now in Pommerania, something strange has been going on. My esteemed opponent has been doing a lot of naval activity off Stalsrund and I've just noticed he's taken the fort guns from the Oder fort to boost his siege. Soubisse is still picking up new units and moving them to the front. In this case one of the batches of mercenaries you can call up. They will be distributed among the existing formations (in particular I have a number of brigades with less than their full number of battalions). Around Munster, by late September, Frederick has been manouvered back. In effect, a purely cavalry corps under the Duc D'Orleans will hold Recklinghausen (& can attack Dortmund if Frederick moves back). 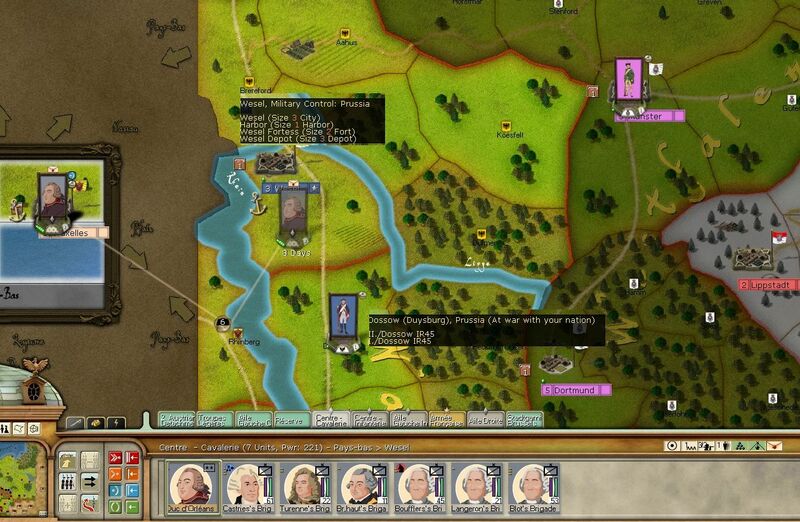 All the army is still well placed to offer mutual support and the weakest unit (the cavalry) is hard for the Prussians to hit and would put Frederick's army in a bad position to safeguard the key cities along the Wesel (especially Minden). Overall, its been a quiet summer but I now have (with the exception of around Troppau) my units where I want them. Koenigsberg is a big gain and I should start taking some cities in the Rhineland pretty soon. I'm more behind on VP score, mainly due to the lost units at Troppau and a few smaller lost garrisons. So Autumn starts to nip and I'm fairly pleased. I think I now have the initiative in North Bohemia and on the Rhine. 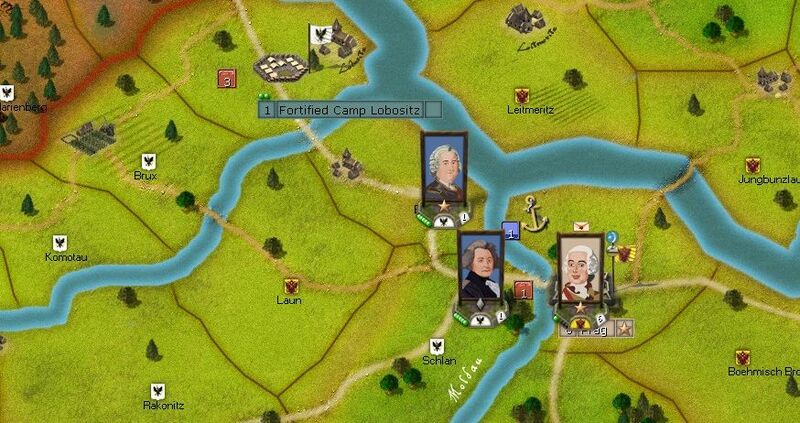 The Russians will deploy to Gdansk with the goal of an attack on Kolberg in early 1758. I'm a bit worried at Stalsrund, but I am going to horde my EP and buy the 'large reinforcement'. That should arrive in early 1758 and I'll send Lucchese up there to take command. It will also make it near impossible to capture Stalsrund. The Oder is a worry, especially now that Narwhal has the capacity to conduct a siege. I have Hohenzollern on the way, and will probably send another corps too. 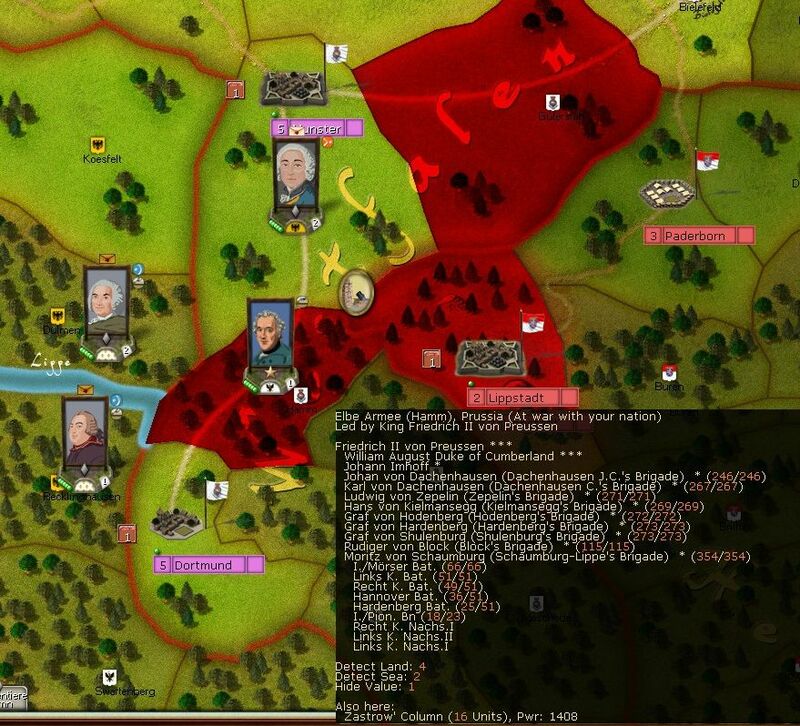 That is too strong for the Prussian cavalry and should restore my initiative on that sector. Narwhal has been strangely passive, and the bulk of his army is hiding in Leipzig. Although there is a risk of winter coming early, I decide its time to shake things up. 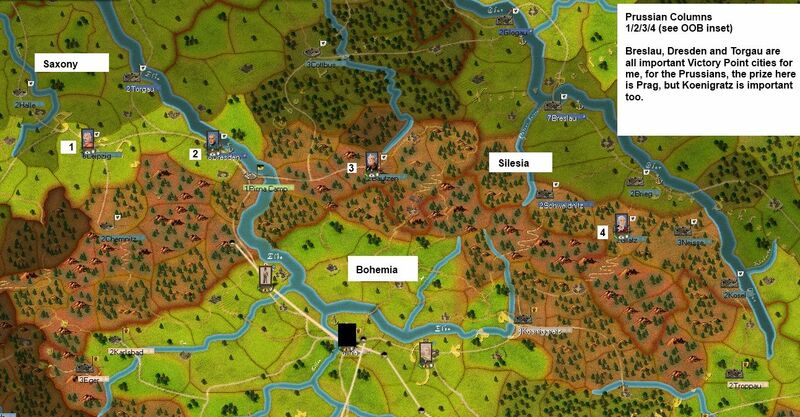 Daun and his army will storm Pirna and try to grab Dresden. If needs be, I can shuffle supply up and down the Elbe using bateaux. 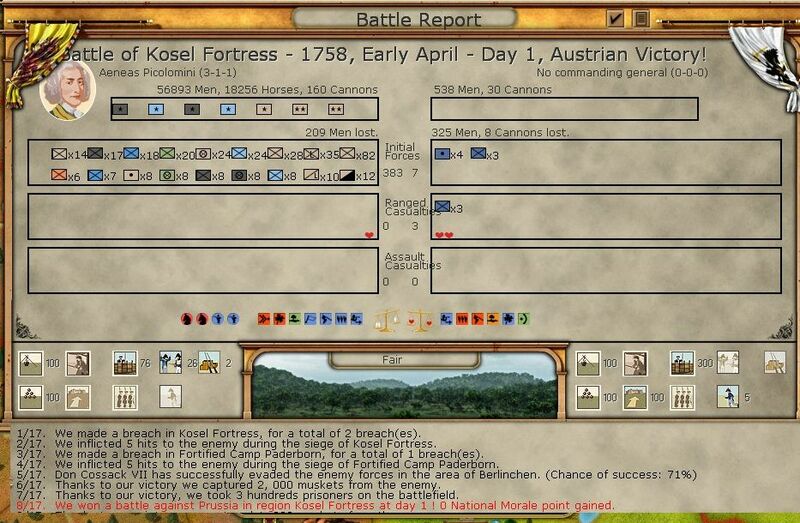 By late October, all is ready and the Austrian army commences its fateful march into Saxony. Few of these troops will ever see their homes again. (Note all are moving in defend-at all costs stance, and as a group so if Narwhal reacts I may be on the defensive and should be all on the battlefield at the same time. The combined power is almost 8,000). Armentieres reaches Munster and starts the siege. Frederick temporarily sits at Hamm, but he has lost some initiative on this front. 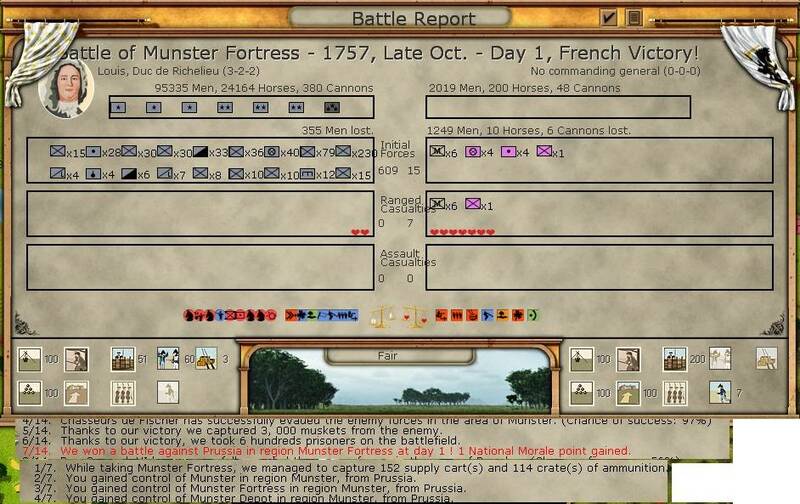 By mid-October I have breach at Munster (this really shows the advantage of my optimised siege formations) and then falls in mid-October. 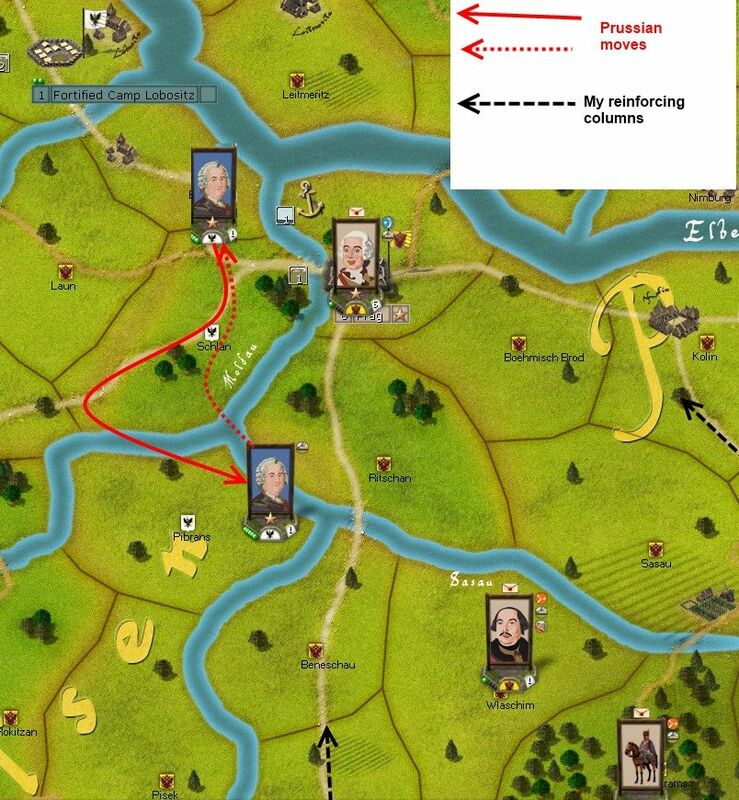 D'Orleans is ordered to storm Dortmund (this is safe as it is very unlikely that Frederick will abandon Lippstadt, if anything I expect him to fall back towards Minden). Even as Soubisse brings a fresh corps to the area of operations. Hohenzollern is on his way east to restore my control on that sector. And I decide to send Kollowrat too. If I am going to make any inroads there, I need force to do it. I dither for an age over what to do. In the end I order Picolomini to sortie to try and break the siege. 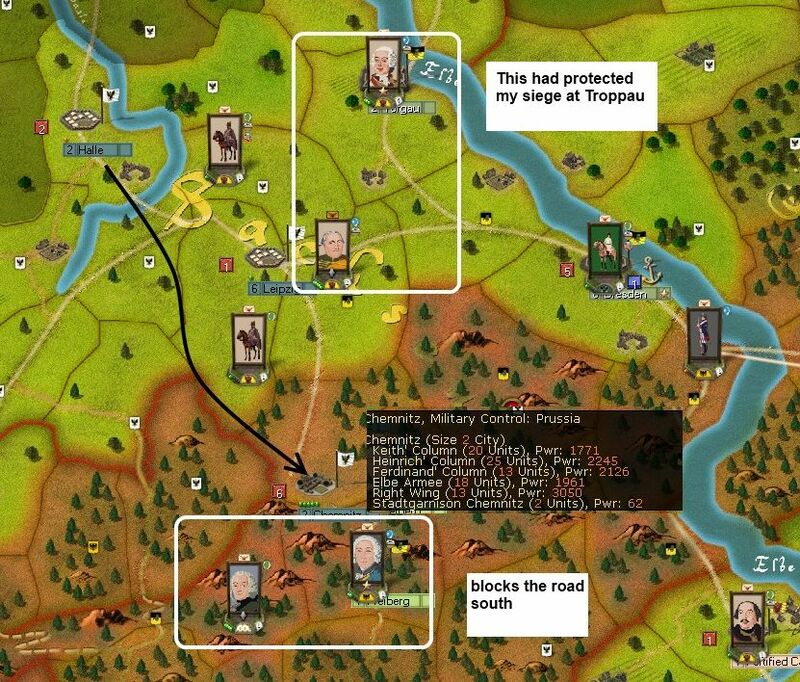 In a battle I'll take heavy losses but should then retire back into Troppau . In a couple of turns, my reinforcements will arrive, in any case, with 1 supply wagon, Narwhal can't maintain the siege over winter. Not much happened here. The Russians marched west as fast as possible (ie slowly). At the end of October, Narwhal gained a breach at Stalsrund. So even if winter arrives soon, I know I can make more progress in the Rhineland. Munster is an excellent safe haven and I can shift Frederick out of Lippstadt. 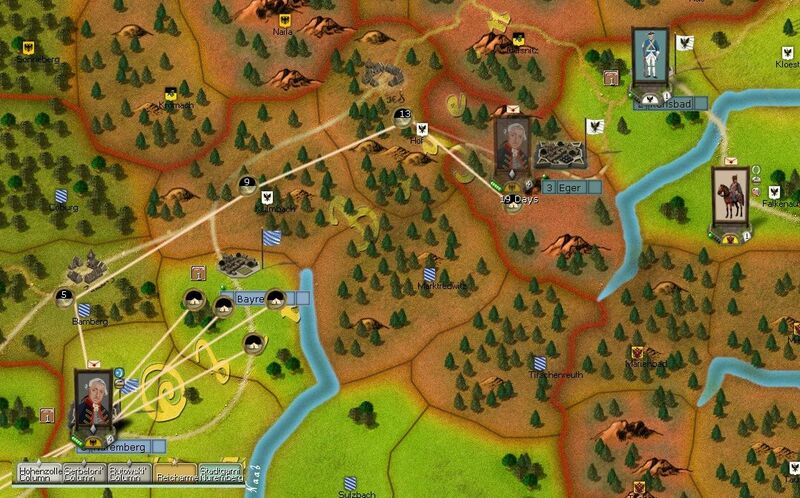 The siege can then be sustained by shuttling supply wagons back and forth. 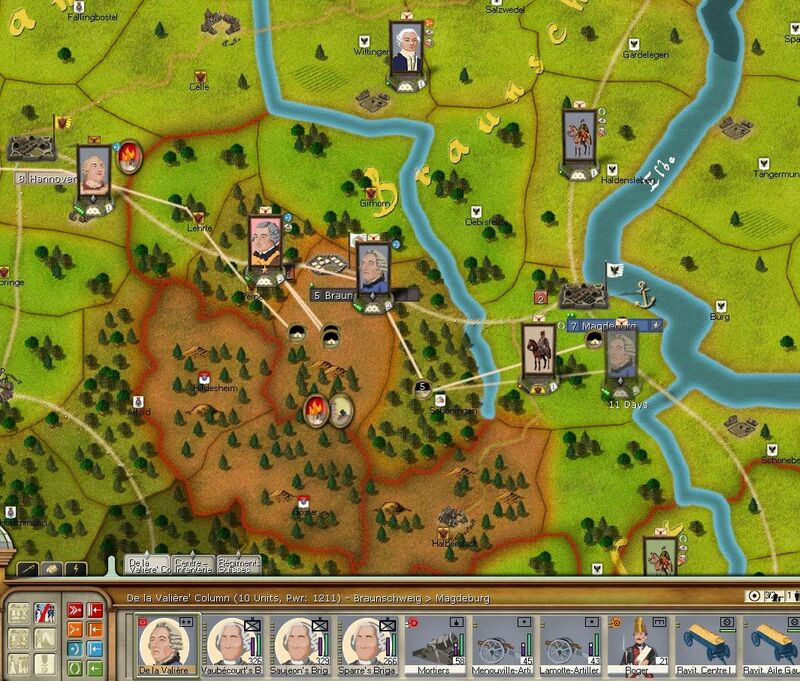 If I grab Dresden before the end of November, that gives me a valuable toe hold back in Saxony. I've restored my control over the Oder region so now its a case of grinding through the fortress line till I reach Breslau. 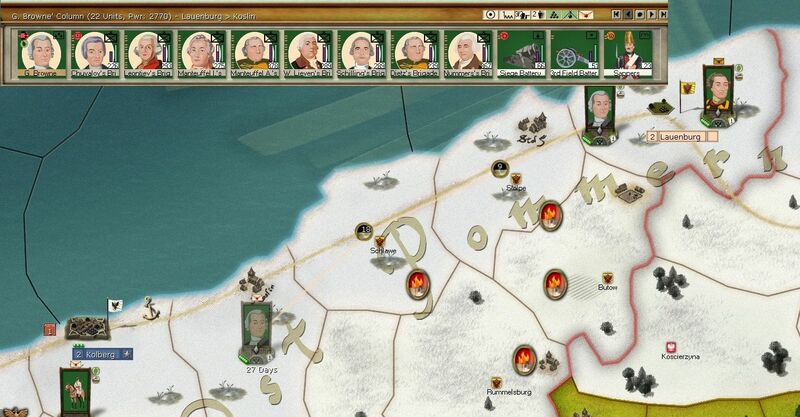 The Russians will be well established at Gdansk by December and can recover organisation. The Swedes are in deep trouble as I can't reinforce till January at the very earliest. – In the event by the time Picolomini got out of bed and started to move, Narwhal's cavalry had gone. In our discussions he said he didn't fancy the trade off of losing lots of elite cavalry to take Troppau, especially as he'd spotted my reinforcements on the way. – The other unlikely, and inactive, allies the Prussians managed to arrange was the Crimean Tartars who promised to raid Moscow. This unfortunately established in the minds of Russian policy makers the idea that as a group, they were less than reliable. Something that was to have terrible consequences in 1941. From an email comment, I think that my lunge at Pirna rather took Narwhal by surprise as he didn't expect me to risk winter cutting the passes. 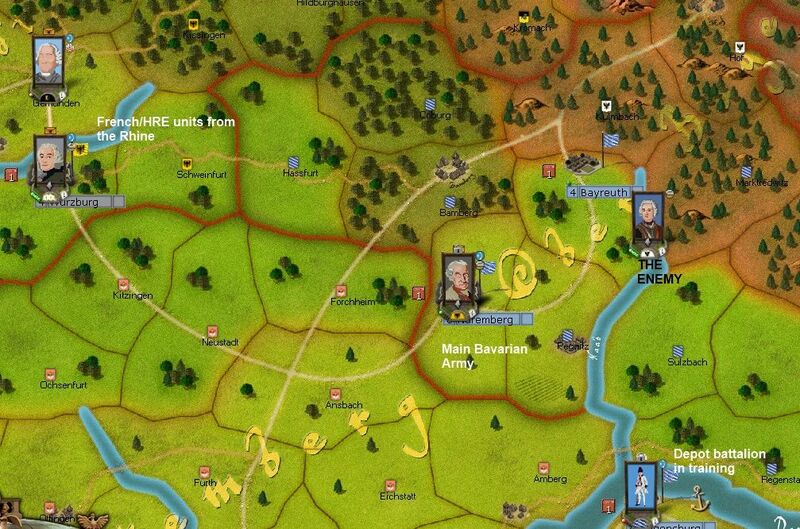 However, Pirna surrendered  and I was able to move onto a siege of Dresden before Keith could respond. I don't think that Keith will risk an attack on that force, so I should be able to take Dresden before winter starts to be a real problem. 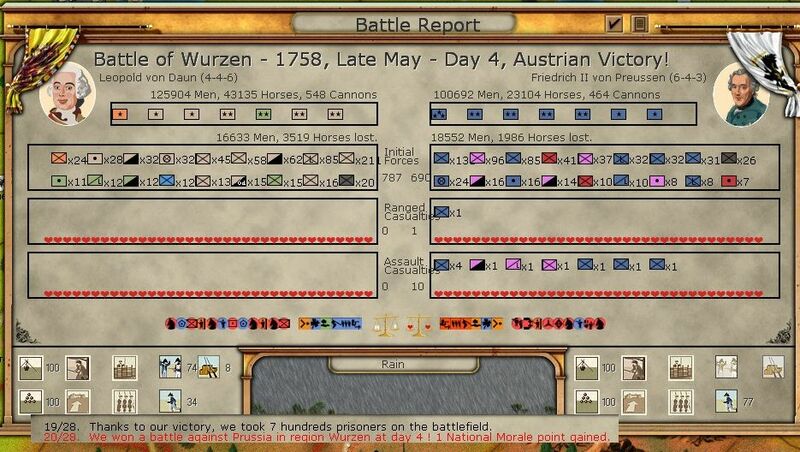 Even better, I manage to catch and damage a Hussar force that Narwhal likes to use for raiding and scouting. I'm not sure why, but they really irritate me, so this was a most pleasing win. 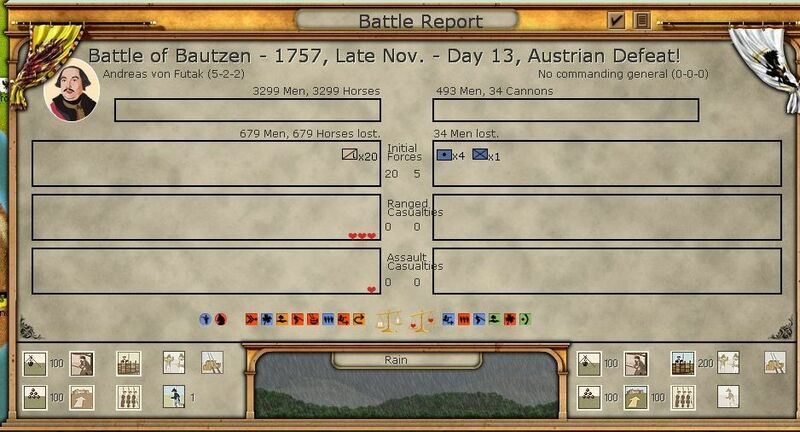 Unfortunately, I was then a bit optimistic with my own Hussars and tried a quick raid on Bautzen. Here things settle down. The Prussians have pulled back, my fresh units will reach Troppau at the end of the month and can then recover from their marches. Related to my plans on the Oder, a number of Cossack units arrive at Poznan. 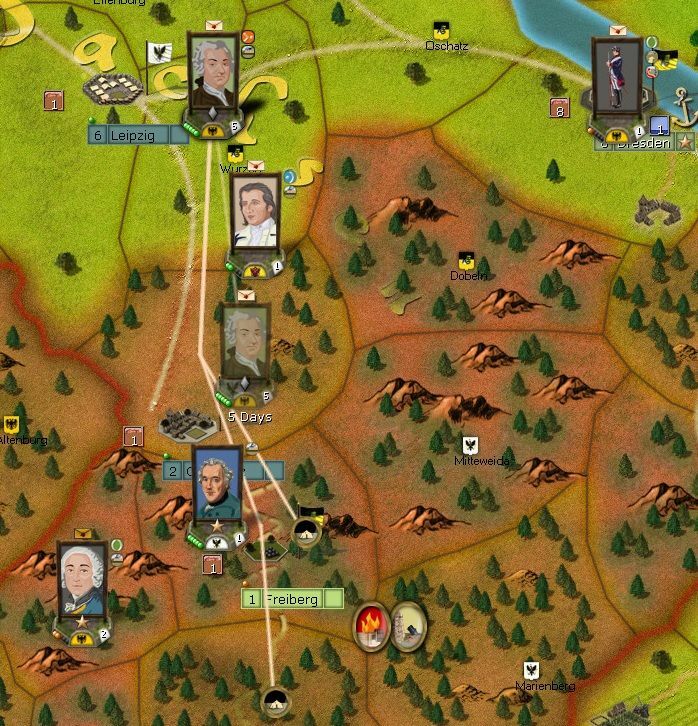 The bulk are for scouting, but a 'brigade' will be useful for taking Military Control of key roads to give me more intelligence on Prussian moves as well as to create holes in their supply network. 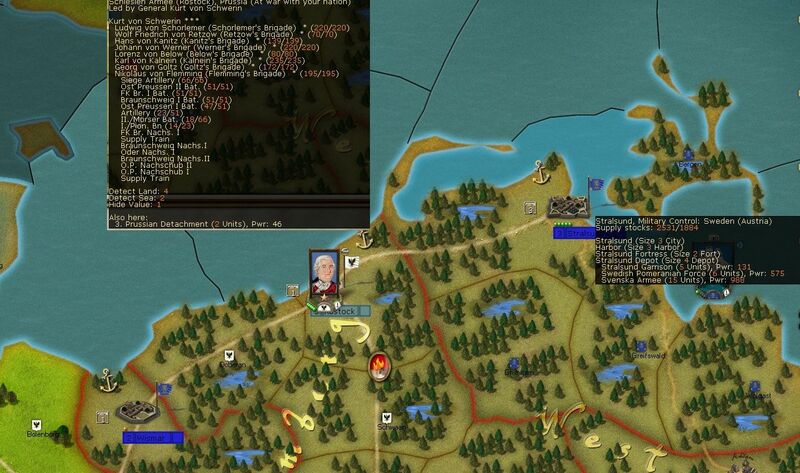 In the meantime, the advanced units of the Russian army reach Gdansk and start building the critical depot at Lauenberg. I also form up a 'corps' of Cossacks. My idea is that they are fast and can take out any isolated units I spot. Still Kolberg is there for the taking in early 1758. 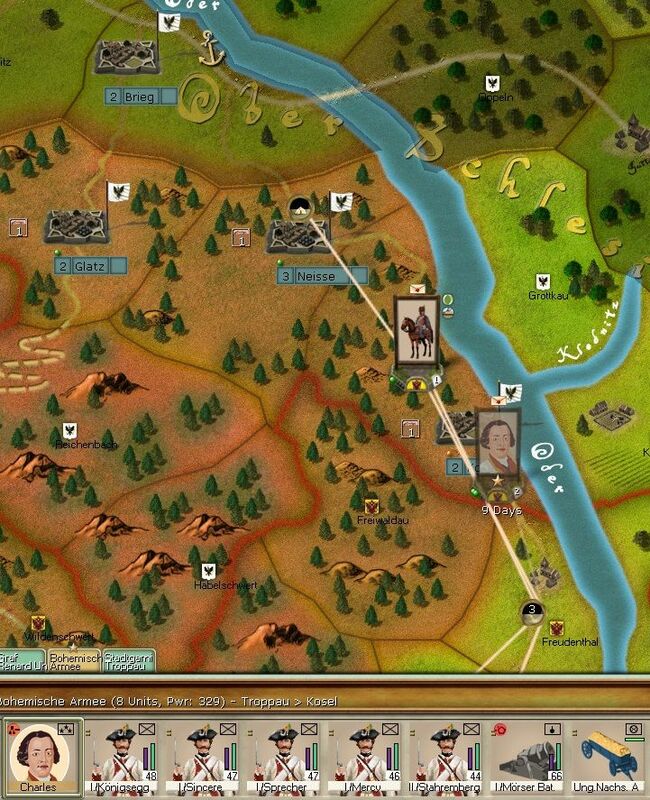 The opening battle is a stalemate, with the death of the Comte de Saarsfeld. Also, in this case the bulk of the army at Munster failed to back up the 2 attacking corps (hence the relatively even numbers engaged). However, even so the Prussians cede the battlefield (I guess they must have been in a fairly passive stance). Lippstadt matters as it is the last level 2 fort between the Rhine and the Oder. So, in combination with Munster, it secures my rear as I move onto Minden. But if I take Dresden, as I should, in early December, the regular flow of VP will start to favour me more substantially. 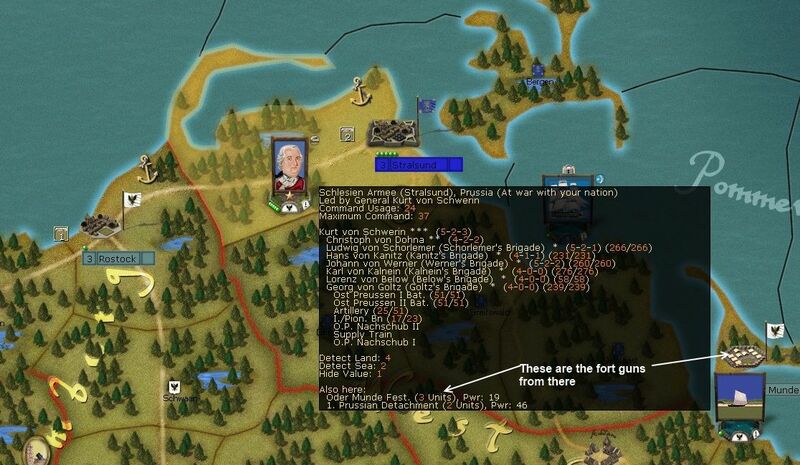 – there is a 5% chance a force with no undepleted supply wagon will surrender regardless of siege progress. I think that happened here. Somewhat later in 1758, I have an incredible piece of luck with this as a fort that should have held at least 2 turns just surrendered, freeing up one of my armies at a critical stage. Here the main issue was sorting out the consequences of Alpasin's arrest. When these change of leaders occur, its usually just a case of putting the new one in as C in C and linking the corps commanders back to the new structure. The problem is when a Corps is out of range, as is the case with my Cossacks who'd gone off looking for isolated Prussians to bully. So they had to move back to Gdansk and I split it up into the smaller units to minimise the command malus. Other than that, I decide to send Browne towards Kolberg. He'll be able to build the final depot in early January and then start the siege work soon afterwards. 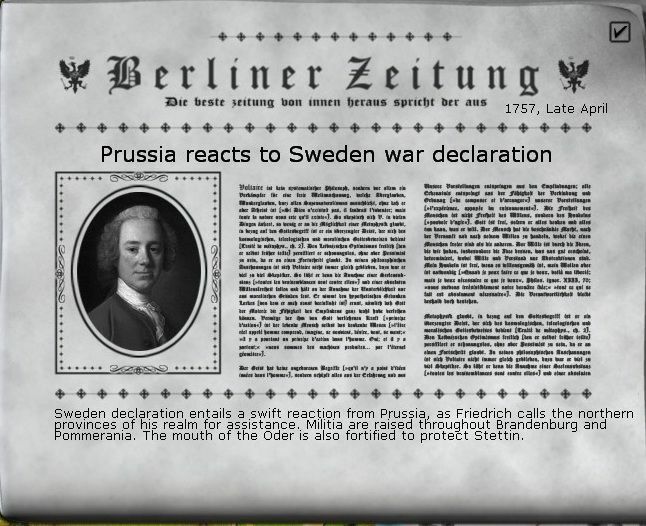 However, my calm is a bit disturbed at the end of December when the Prussians reopen a breach in Stalsrund and the Swedes decide this is a good time to sack their manager. It will be one more turn before I can order up the large reinforcements so I could well lose the fort in early January. Frederick's second intervention coming too late, this time I even won the battle. Even if poor Claude de Guerchy  laid down his life for the glory of France. Both the British and French celebrate by sacking their existing commanders. At the start of the month, Daun storms Dresden, gaining me a valuable winter rest place as well as commencing the liberation of Saxony. The VP situation is relatively even as, so far, there have been no major battles. 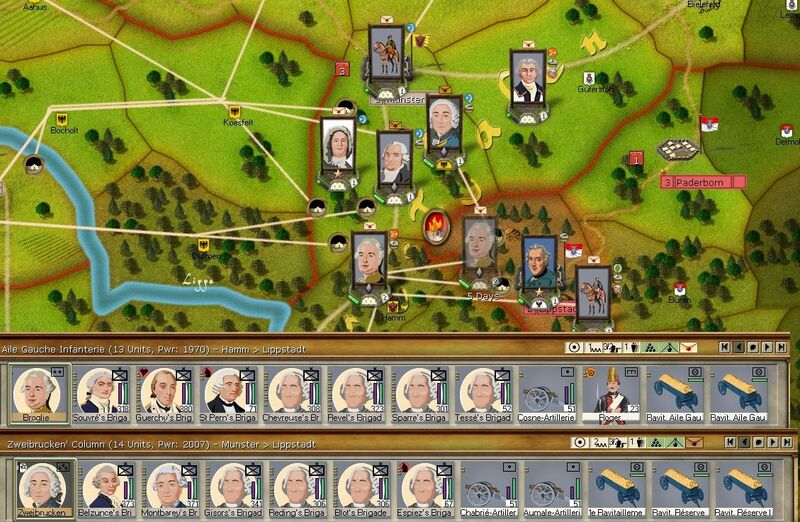 However, losses are about to escalate as the 1758 campaigns develop. My plan for the coming year involves 5 elements. 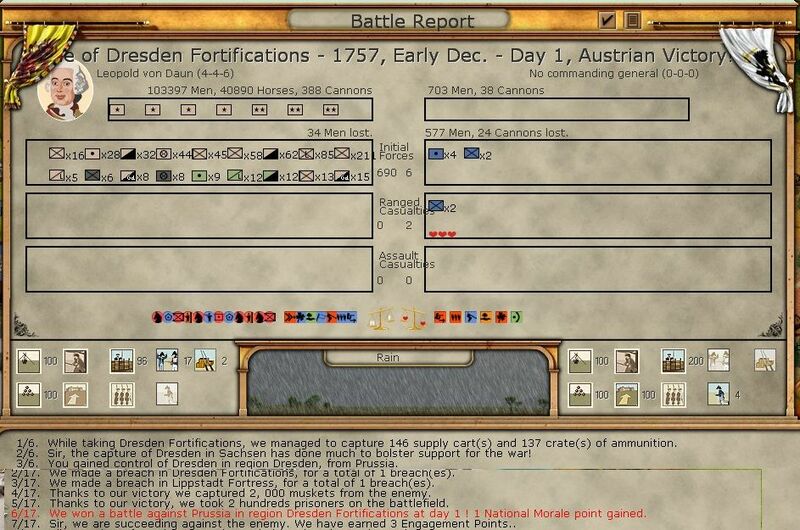 At the moment Daun has about 8000 power in Dresden facing 5000 under Keith at Leipzig. This makes Keith's army my target not any more Saxon cities, but I don't want to risk the organisational losses of marching in the snow. So if needs be, I'll sit back for a couple more turns. If I can dent Keith, I'll then go for Troppau. On the Rhineland, at the moment, I'm in control. 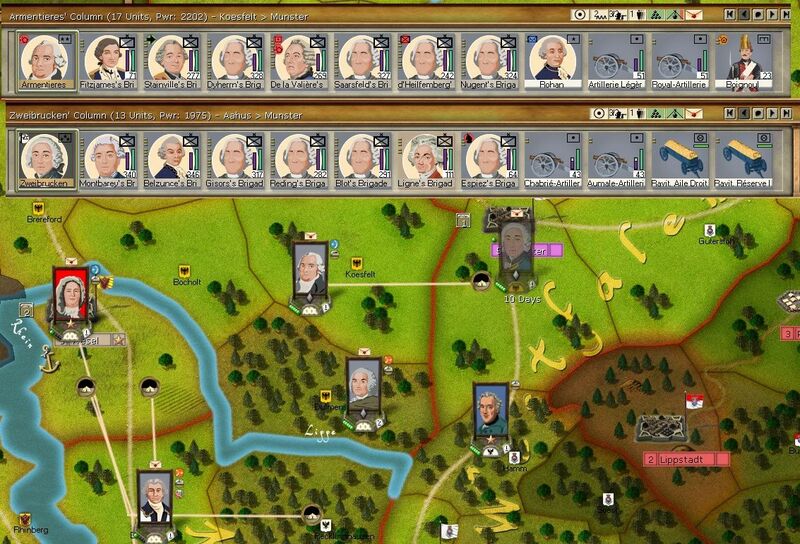 I have 6 corps (about 120,000) and will sort it so it is all commanded by Soubisse (who is a better CinC). I have about 35,000 of easy to gain reinforcements that I can draw down by late Spring. I'll drive Frederick back to Minden, in fact I'd like him to hang around to fight, and then decide on Hannover or Bremen. I'm now in a position to start an offensive on the Oder. This will be slow at the start, but I can reach Breslau by the summer, these gains will then start to eat into Prussian manpower as well as netting me more VP cities. The Russians will take Kolberg by March, if the Swedes are still in existence, I should be on the lower Oder by May. The Swedes need to survive to late January, then the 'large reinforcements' will give me even numbers (even if with poor commanders), enough to lift the siege of Stalsrund and help the Russians out (even if just by forcing some Prussians to stay and keep an eye on them). All of which assumes that Narwhal doesn't wreck one or other of my prongs. At this momemt, the Swedes are very vulnerable. One comment about winter. I suspect this is the new patch, but we found active campaigning in winter quite easy. The only cost was in terms of slowed movement and higher organisational costs, so ideally its not a time for long marches. But I was constantly able to maintain my sieges and move forward slowly and methodically. – in truth, if there is 1 command level I have more than enough of, its French 3-0-0 brigadiers. If this was in the Austrian army, the losses would have really hurt. One major problem this turn is dealing with the consequences of Richelieu's hissy fit at the end of December. Some is quite easy, appoint Conde to CinC and link the corps back together into an army. 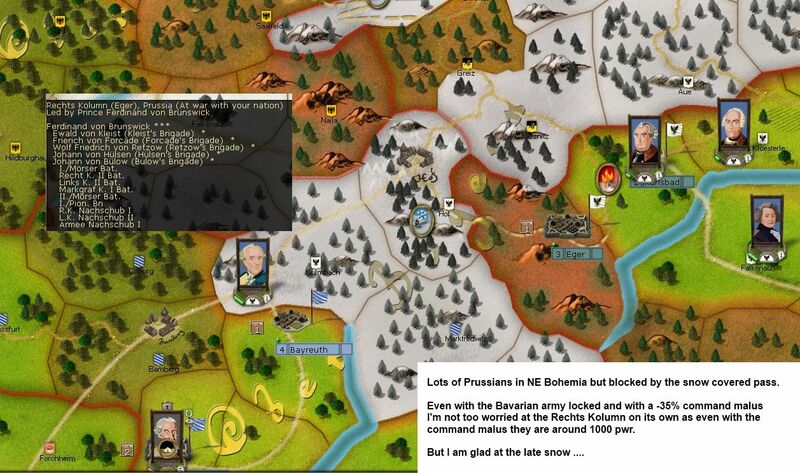 However, a larger problem is that Zweibrucken, who had a corp is now sent (automatically) to take over Bavarians. One consequence of my slow, rather deliberate approach on this sector, is a large British force has now turned up at Bremen. I'm not too worried as I will still have 3-2 odds on this sector. By early January, Browne has reached Koslin and starts to build a depot. 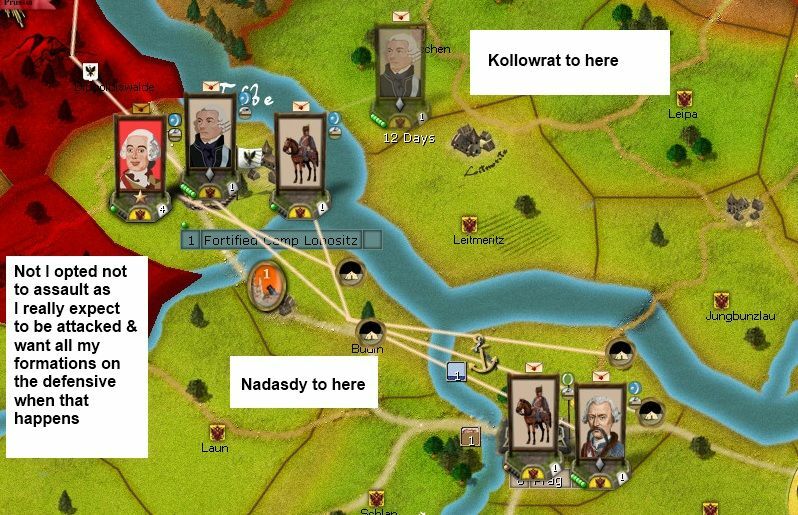 I have a lot of supply wagons with his division, so next turn, I'll start the siege at Kolberg, I'd like, if possible to make more progress than Narwhal expects. 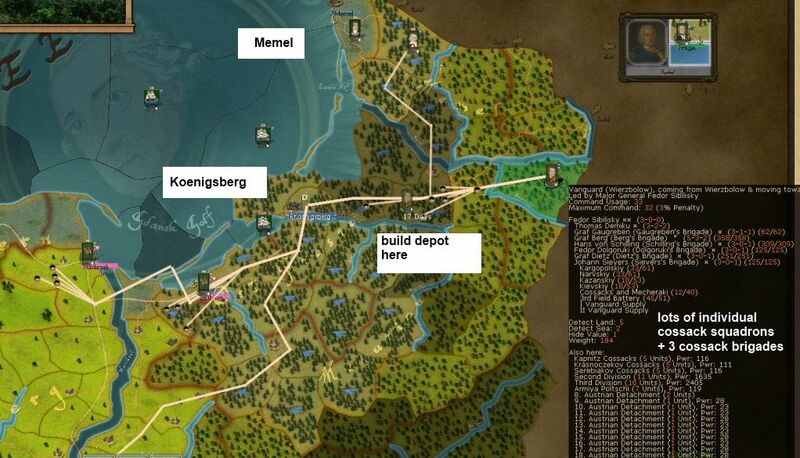 The rest of the army sits back at Lauenberg (now a level 2 depot) so as not to stress my supply lines. 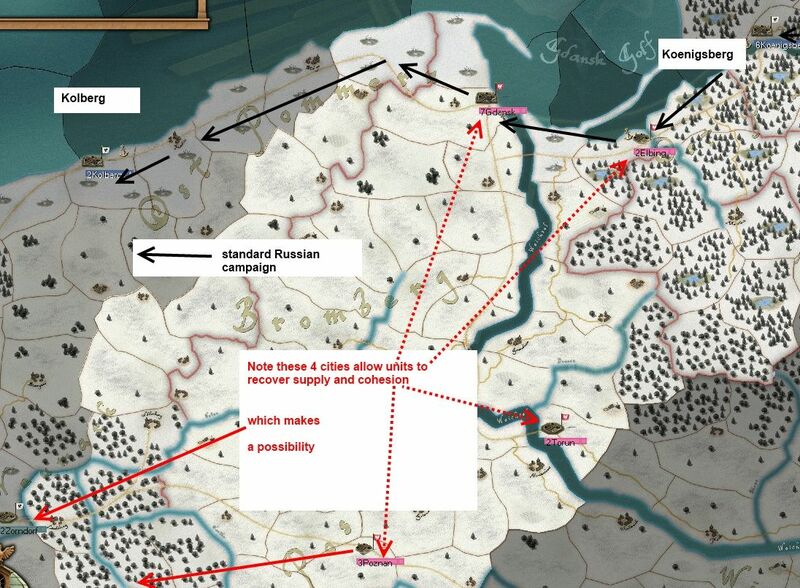 Usefully the Observation Korps unlocks back in Russia and will be broken down (to minimise the command problems) and start its march into Prussia. Those two additional howitzers will give me the capacity to take out any fortress at speed. In early January, the Prussians re-open the breach at Stalsrund, but its now too late (I hope), at the time I was confused as to why no assualt had happened but Narwhal has since said they all caught typhus at a critical phase. Now this shows part of the problem with mess caused by Richelieu's hissy fit. Zweibrucken has been sent to take command of the HRE army, so I need to send Hohenzollern in turn over to France (that corps that Zweibrucken had is too vital to lose), so I am now a corps commander short. I think I can juggle those brigades between Picolomini and Kollowrat but its not ideal. 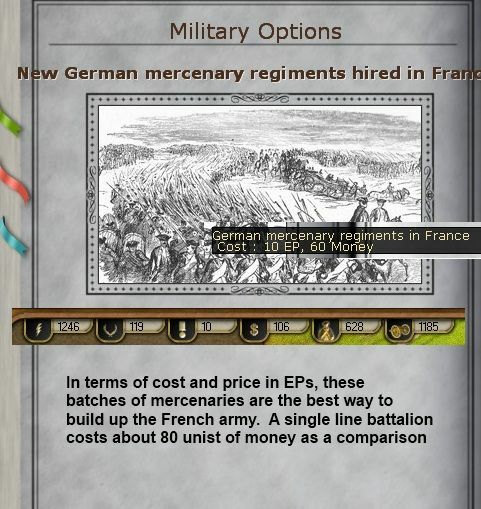 As a gameplay note, I don't think someone who tends to play the Prussian side knows how much a problem these command shifts are, especially this one for the French. Its a good time to think about launching an attack as at least some of the command structure is not going to function. As with the Austrians, I opt to raise a number of militia battalions (these are HRE/Palatinate units) to fill in as garrison forces as I sweep (well wander slowly) towards the Elbe. Frees up the better stuff to remain in the combat units. I also want to build up the depots at Munster and Minden to sustain that large (and still to grow some more) army so I order up another supply train. So March, will see a more aggressive stance on the Rhine. I'll push that Hannoverian-British force away from Minden and then decide between Hannover and Bremen as the next target. 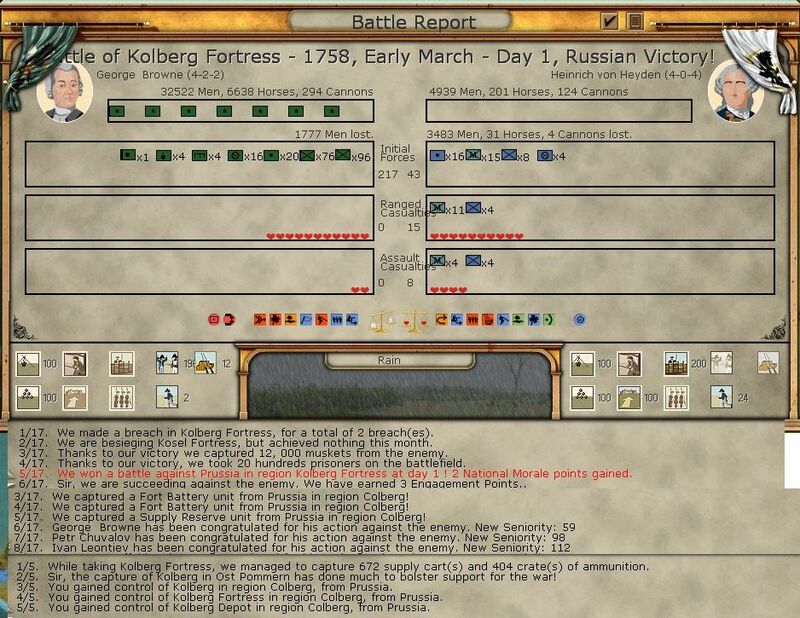 By mid-February, Browne has knocked a hole in Kolberg and Narwhal has stolen my depot at Koslin (it was left unattended for about 2 days with one unit of Cossacks leaving and another arriving). As long at Kolberg falls soon this doesn't really matter as that will become my new supply base. 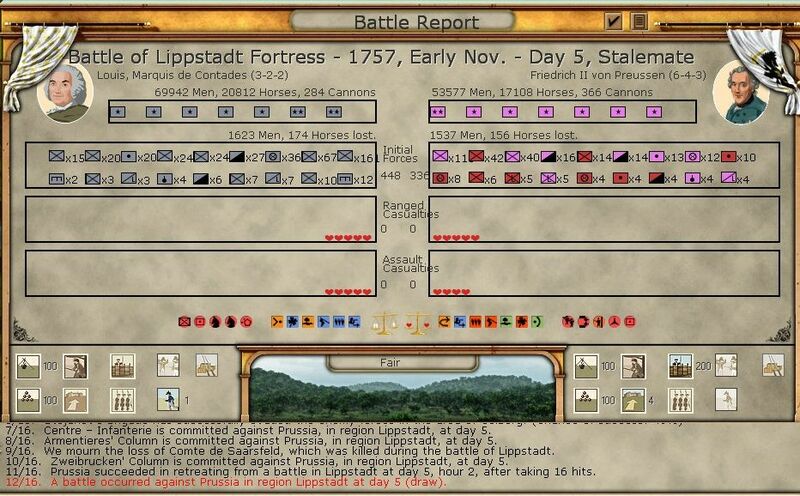 Over in Sweden, the Prussians pull back from Stalsrund. All I know have to do is to find a use for a mass of Swedes. I doubt they will be much use in battle, but they become yet another threat Narwhal has to worry over. Here, I am finally able to commit Kollowrat and Picolomini to commence the siege of Kosel late in the month. This is now too powerful an army for Moritz's cavalry to dislodge and I doubt that Narwhal can spare anything else to threaten me. The expectation is a slow slog to Bautzen. And in Saxony, the snow lifts so its time to go and play with Keith. Well, no it looks like Frederick has returned. Technically I lost the battle (I didn't use the hold at all costs stance) and took quite a hole in my NM. But I'll trade those losses all the way to Berlin, especially as it was the Prussians who took the losses in terms of elements. I also now know just what numerical advantage I hold in the theatre, even if I lag in terms of leadership quality. 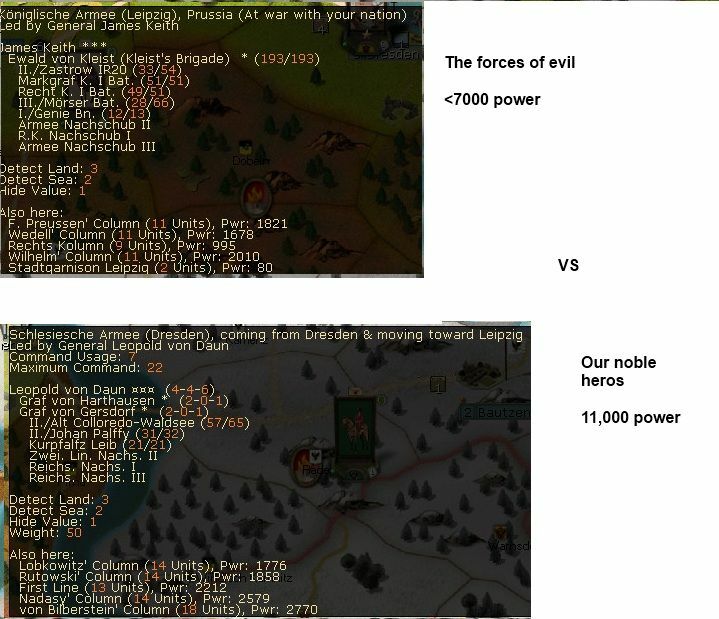 So, I lose the first big battle of the war. In truth, if I can pin the main Prussian army down to a set of bruising encounters in Saxony I'm well on the way to winning. Narwhal is soon going to have to worry about derailing both the French and the Russians, as well as my side campaigns along the Oder and with the Swedes. Browne should finish off Kolberg in March, putting the Russians on the lower Oder by May or early June. 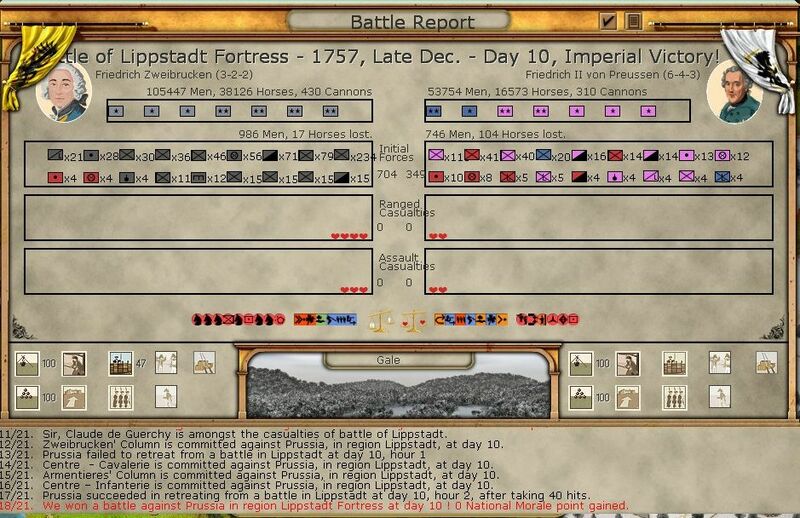 Despite the defeat at Leipzig, my main army is still in good shape (in terms of organisation), so I decide to initiate a second battle for Leipzig. Well I lost again, but again, its the sort of loss that will win me the war in the end. 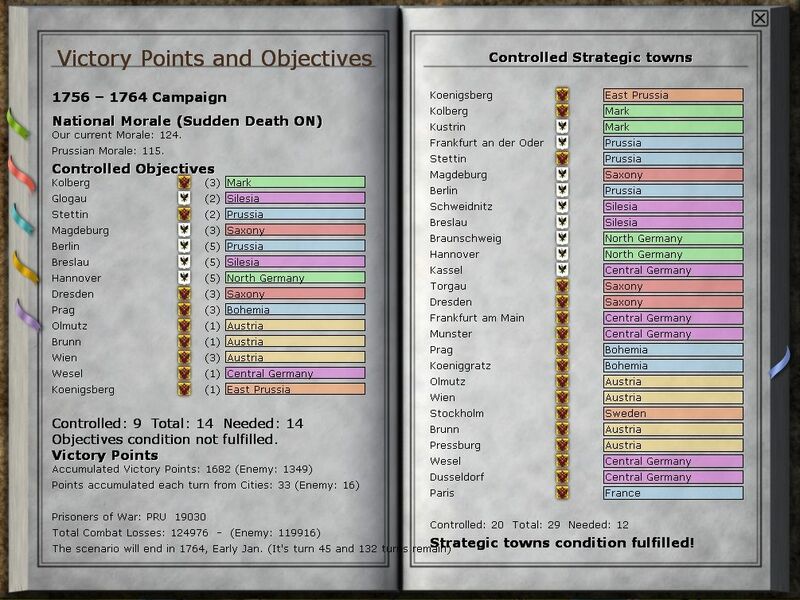 There are two reasons for the defeats, one is that, with exception of Nadasdy, my commanders excel on the defense (Daun has a 6, Von Bilberstein is a 4 in this respect). 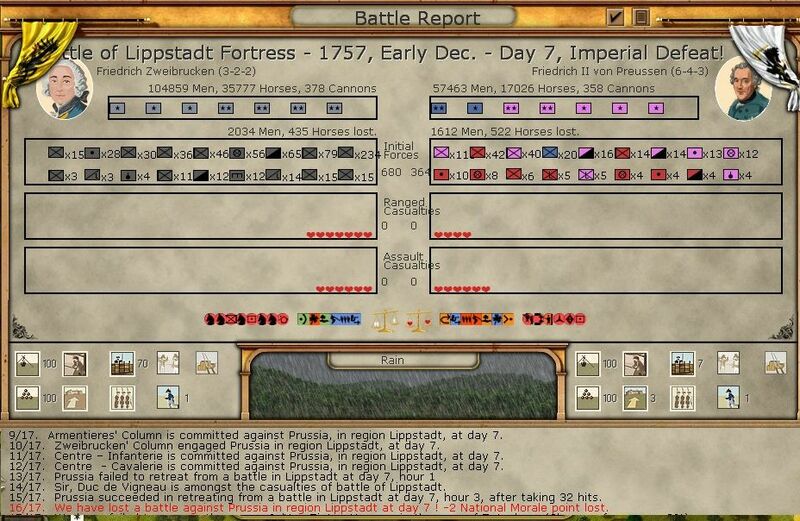 Equally its clear from the battle logs, my army is not fully committing while the Prussians are. This is not all bad, I'm rotating brigades to some extent, Narwhal is taking sustained damage, hence the loss of another element. Note that, thanks to the Saxon guns, I actually have an advantage in artillery and you can see the impact in the ranged-fire phase (one reason why unlike in our earlier game, the final battle losses are coming out much more even). Thus Daun's force is ordered back to Dresden to recover. In case Frederick opts to raid into Bohemia, Chevet's French corps is ordered to build a fort so as to secure the passes south of Chemnitz. So I suspect he will try to retreat north. Now in view of what happened in the turn resolution element for late March, I was very glad I made this decision to pull back, regroup and allow the damaged brigades to absorb the significant number of replacements I have generated over the winter. 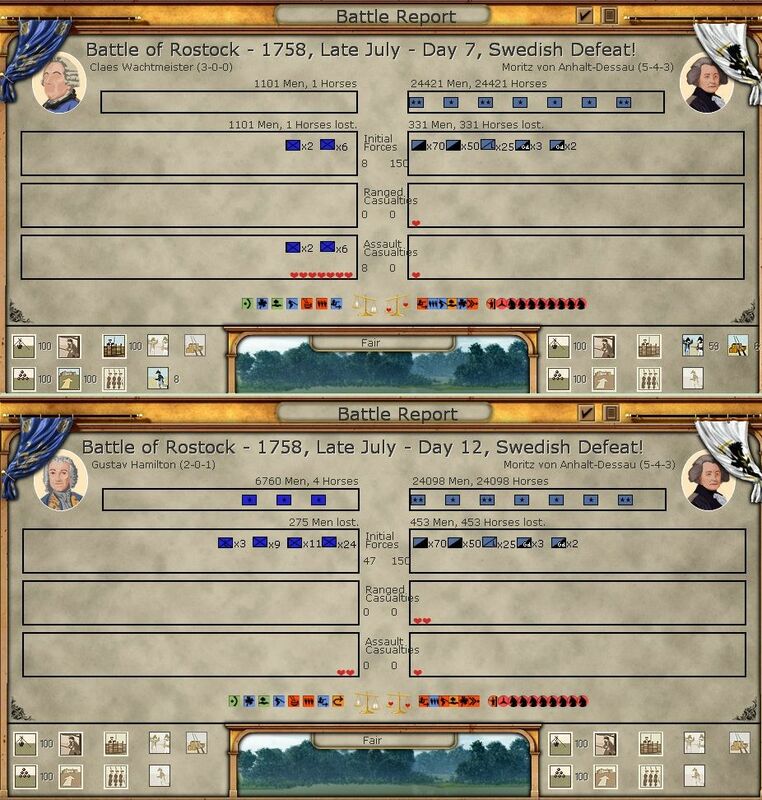 In the spirit of being more aggressive, the two Swedish corps (I lack the commander needed to make an army of them, so they will not mutually support unless they both arrive at the same time), are committed to drive the Prussians from Rostock. 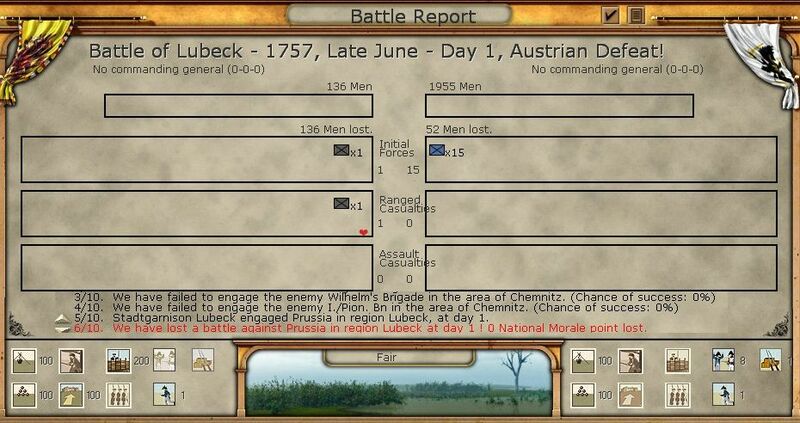 And ends in a dismal defeat, well not too bad, my losses don't matter, but that is another drain on Prussian numbers. 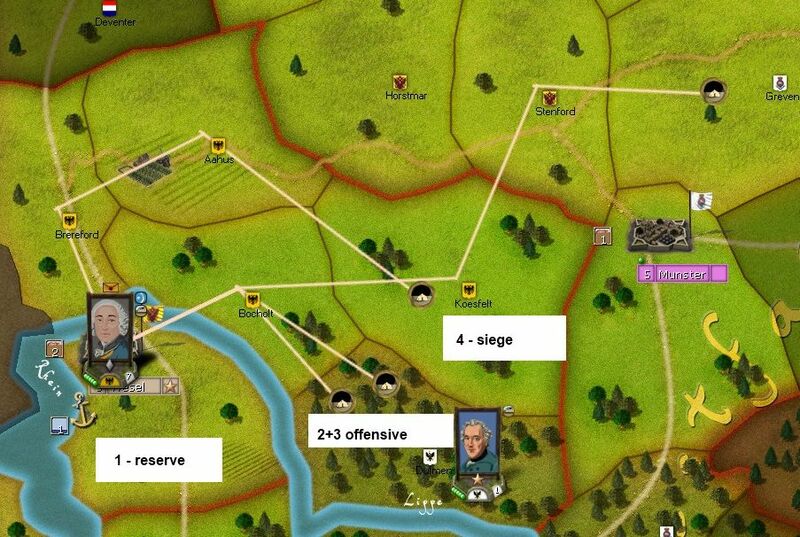 In pulling back, another short skirmish occurs, but I manage to retreat into Stalsrund with no real damage. In better news though, Kolberg falls at the start of March, as the guns of the Third Division flatten the walls. 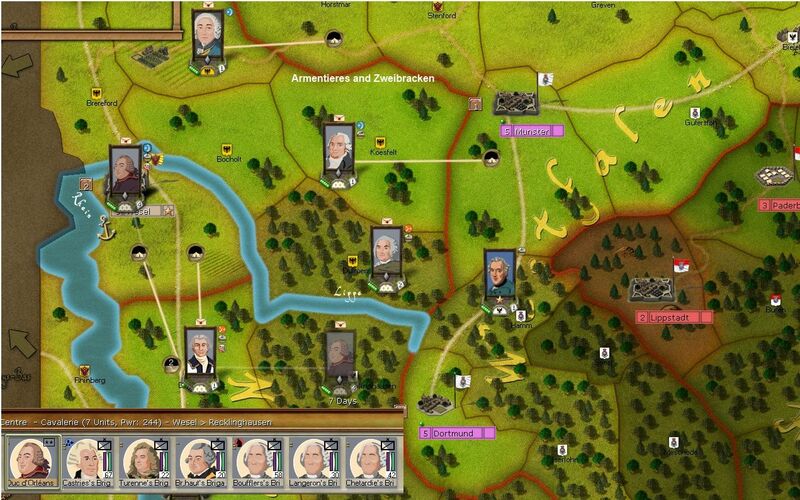 I need 1-2 turns to recover and move up the rest of the army and then its time to take Stettin. Here, I create a special 'siege-brigade' to take out Paderborn. From experience, if I leave it behind my lines it becomes a base for all sorts of annoying Hussar-types who then take back MC and threaten my supply convoys. The rest of the army marches on Minden, if there is a battle, they will be in a position to support each other. But when I arrive, mysteriously, the British are not to be found. At the end of March, a scouting group of Cossacks at Magdeburg sends back interesting news. 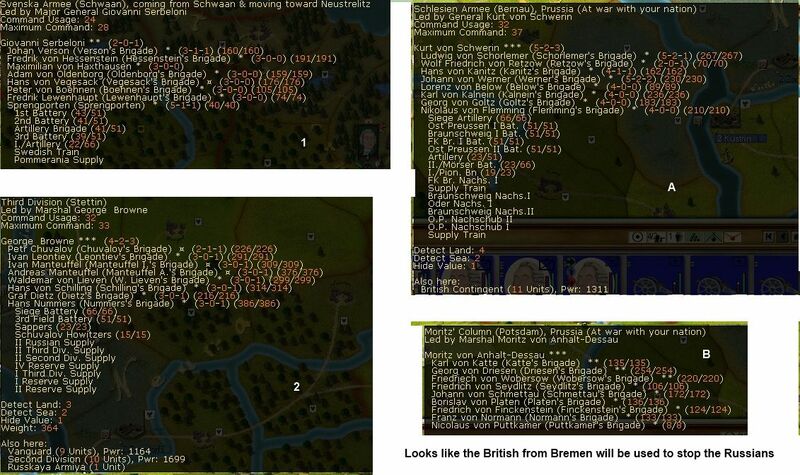 It looks like the British have abandoned Hannover and will join up with Frederick in Saxony. This is maybe not good news for Daun. In better news, abandoned by the coward Cumberland , the garrison at Minden quickly surrendered, opening the way to take out Bremen and advance on the Elbe. And a fresh Saxon force arrives in Paris, and I have the 'Armee Francaise' already there to provide command and they will reinforce the main French armies. For them, the road back to Saxony lies across the plains of Hannover. Not much happens here, Kosel is under siege and I am a little worried at that Prussian force at Schweidnitz. In theory it could threaten E Bohemia, but with mounting pressure in Saxony I can't see the Prussians being able to spare it for independent action. Especially as it seems to consist just of Moritz's cavalry. Well I now have two of the outer doors to Prussia secured. Minden and Kolberg mean that the French and Russians will move onto the Elbe and Oder respectively and feasibly threaten Berlin. 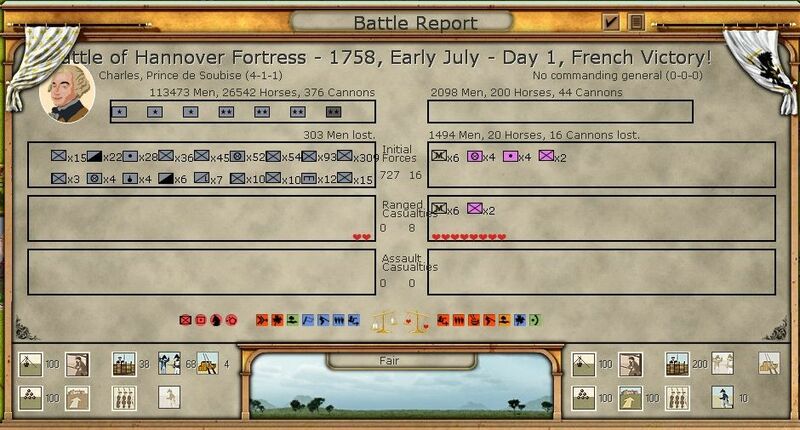 With the French, I'll take Bremen first to secure my rear against any more British reinforcements. The Swedes clearly can't fight their way out of Stalsrund, but at the moment they are pinning down a corps of some 25,000, so its a pretty good trade off. The worry is in Saxony. Cumberland plus Frederick is an army of about 120,000 so larger than the 110,000 with Daun. I'm glad I took the chance to allow Daun's army to recover as it looks like a lot of fighting is going to happen. My guess is that Narwhal has decided to ignore the Russians and the French (& the Oder) for the moment and try to destroy the Austrians. April can be seen as a brief lull in the fighting. The Austrians and Russians were mostly regrouping after the March battles and the French were involved in clearing the threats to their flanks and rear before moving onto the Elbe. Equally it seemed the Prussians needed time to recover from their marches and their losses at Leipzig. However, although outnumbered almost 2-1 in Hannover and Saxony, in combination the Prussians were much stronger than any of the Allied armies. The advantage of interior lines, faster movement and superior generals was very much in my mind at this stage. After the defeats at Rostock, the Swedes retired into Stalsrund. It was clear they were more of a threat when they were nowhere near a battlefield. However, by late April, the Prussians abandoned Rostock, presumably either to reinforce their armies in Saxony or to contest the Russian approach to Stettin. By early April, the French were securely in charge of the west bank of the Weser with the exception of the major port of Bremen. It was decided to leave Hohenzollern's column to secure Minden while the rest of the army drove the English away from Bremen and secured the rear before moving deeper into Hannover. At the same time, Hohenzolllern oversaw a massive expansion of the depot at Minden, vital if the large French army was to be supplied as it neared the Elbe. The British force at Bremen retired without giving battle, enabling the siege to begin. freeing the French armies to march on Hannover. 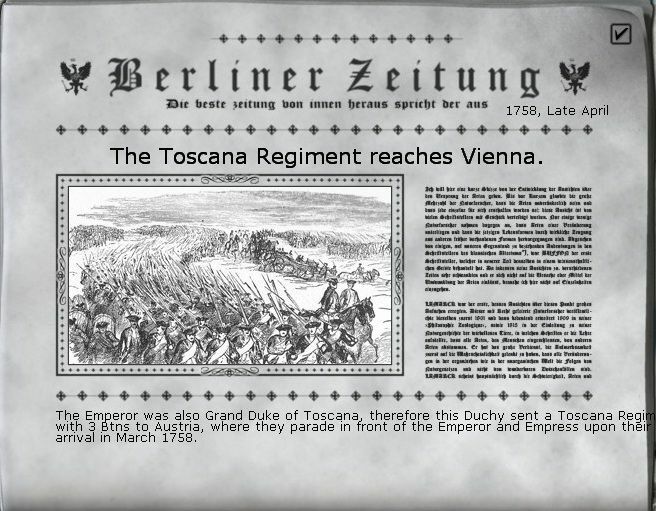 The arrival of fresh battalions at Wien, offered a further boost to his numbers. After the twin battles of Leipzig, the front in Saxony was quiet. Both sides were content to sit back in defensive positions and recover their losses and organisation. 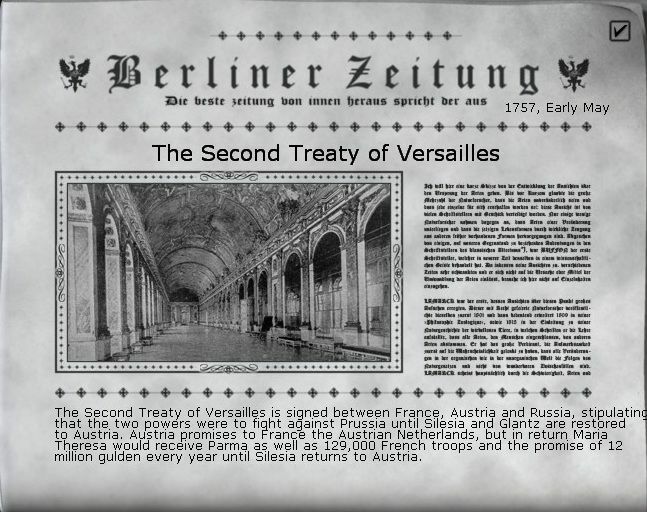 However, with the weaker Russian and French armies now within striking distance, it became clear that the Austrians needed to actively engage Frederick in Saxony in order to prevent him destroying one of the other threats to Prussia. Equally May was to see a renewal of the Russian offensive. Well for those of you worried at the lack of major battles, never fear your needs will be fully met in the next few reports. 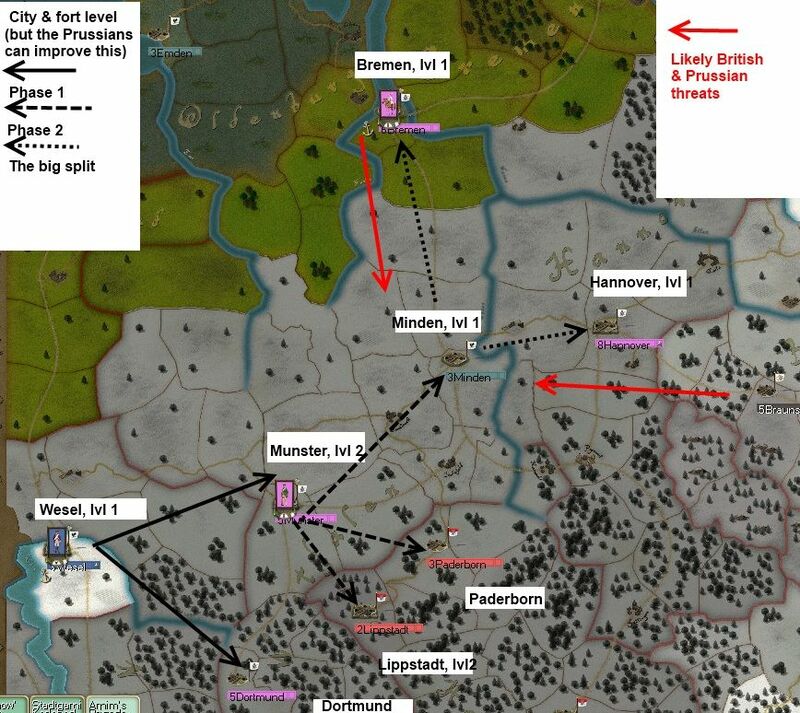 Here, I redeploy the force that took Bremen back to Minden (to pick up fresh supply) while the 2 fresh corps and Soubisse's HQ stack move onto Hanover. 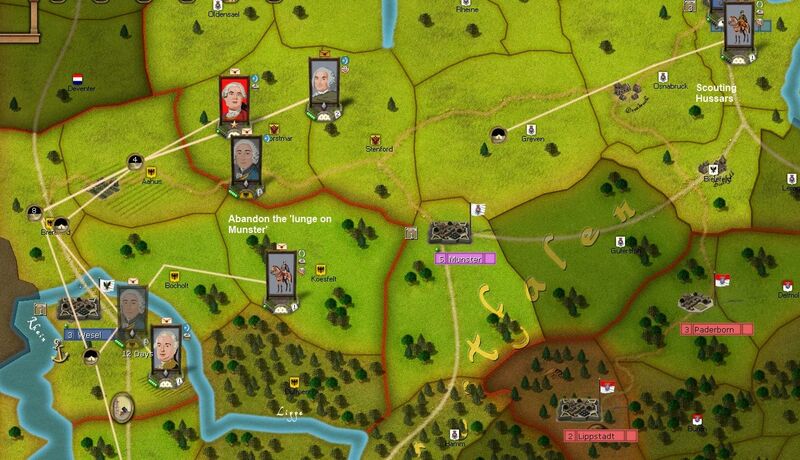 In the meantime the fresh Saxon corps starts the long march to Minden, it should arrive by early July. 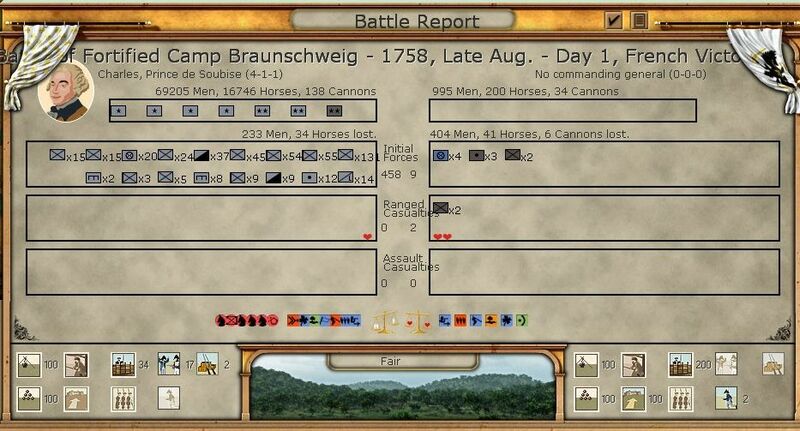 In an attempt to force the pace, I decide to send Orleans and the French cavalry onto Braunschweig. 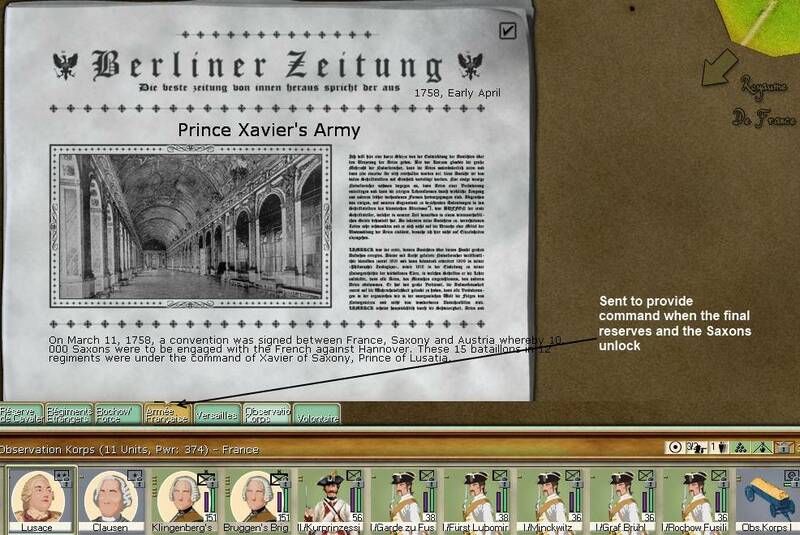 I may be lucky with a surrender event, and it will also help gather intelligence on the Prussian deployments. As it is by late May, my sieges are ongoing and that British corps from Bremen is spotted at Magdeburg. Again I am suspicious that he is on his way to join Frederick. 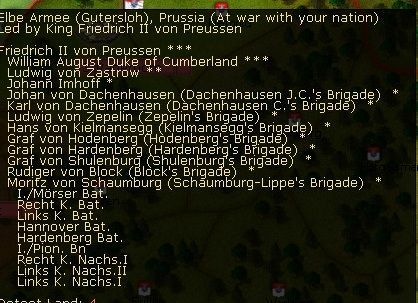 At the start of May, I decided to try and threaten Troppau and deployed the entire army so it was mutually supporting, but still protected Dresden. Not least, the core of the Prussian army was at Halle (including the force that had been at Magdeburg). However, by mid-May, the situation is rather different. Frederick has moved into Chemnitz itself. 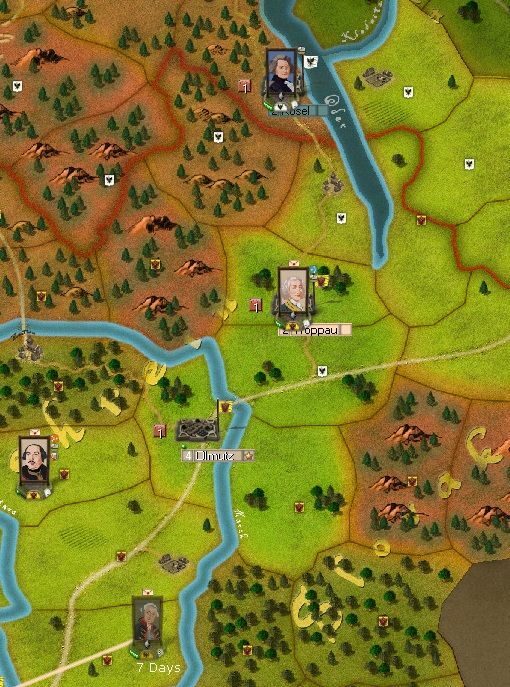 Well I decide to gamble on taking full advantage, lifting the siege of Troppau the entire Austrian army redeploys to Leipzig, Wurzen and one corps is ordered to Chemnitz itself. Again the moves are timed so as to be self-supporting as I see the opportunity to trap Frederick well away from any regular supply sources. Equally he can't move south without fighting some sort of battle. 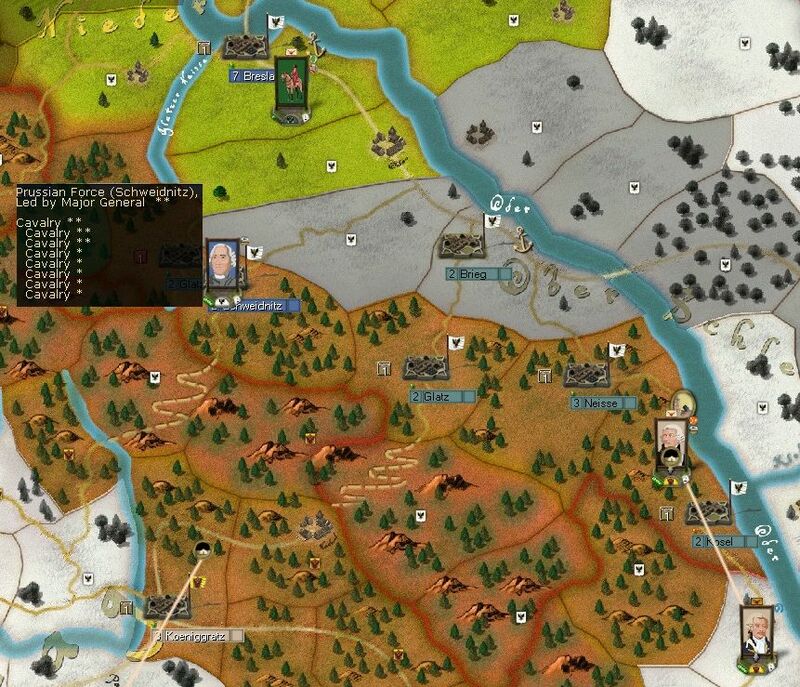 Even better, Frederick is then forced back to Chemnitz, which cannot be doing his supply situation any good, and, overall, the Prussian army is now split into two. However, I have paid a high price. 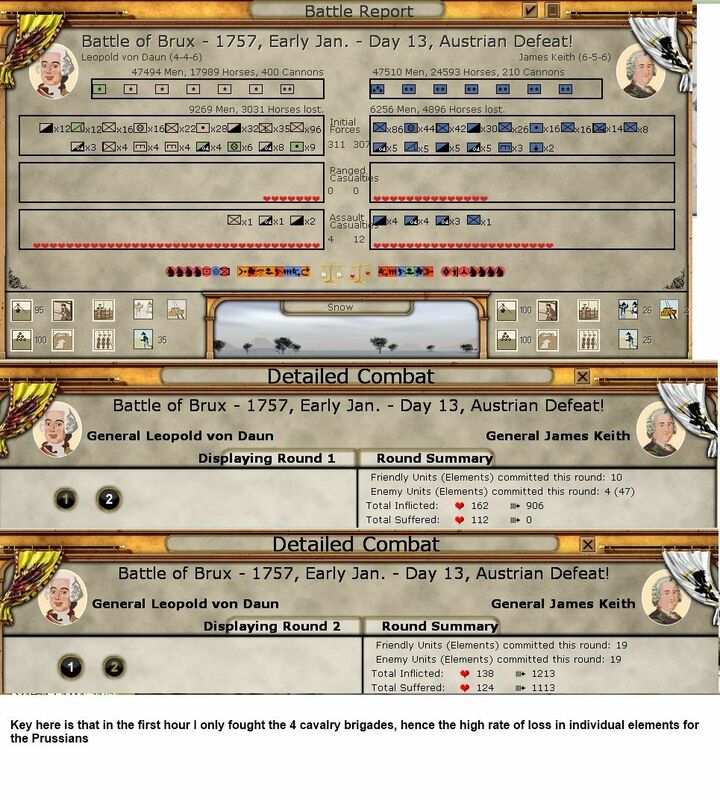 Von Bilberstein (4-1-4) has been killed, now I can juggle brigades and do some promotions but he was one of my best corps level generals. Here again, I'm just moving methodically northwards. 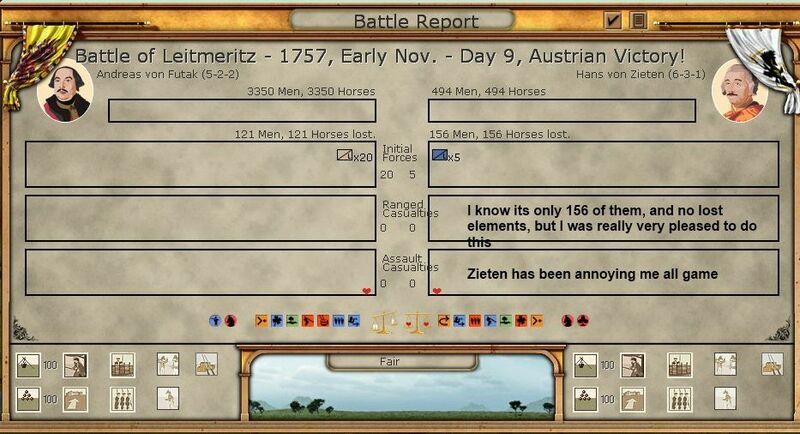 My only concern is that Moritz's cavalry are still in Silesia, but I don't think they can really harm 2 full corps of infantry. 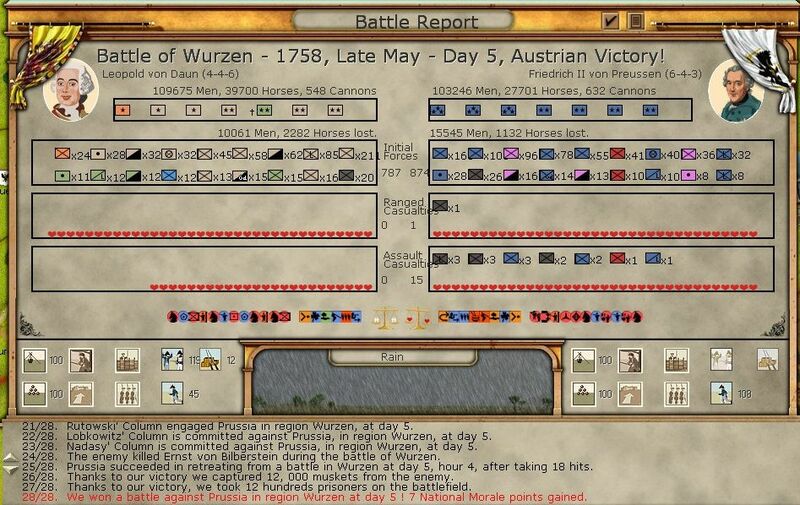 The net effect of the twin battles at Wurzen is I am now ahead in Vps, fairly meaningless but a nice sight. Equally, I am well ahead in NM (I've just lost some in return for more VP and EP) and our battle losses are pretty much even. So things are about to become rather vicious. I have effectively trapped Frederick, but that British force at Magdeburg and Schwerin around Berlin are in my rear. Moritz, I suspect is going to move to Saxony as he can do little on the Oder at the moment. The French and Russians need to clear a barrier of forts before they can really help. I'm afraid that Frederick will try to run south, but as long as I can secure the major supply sources, sooner or later that leads to serious problems. 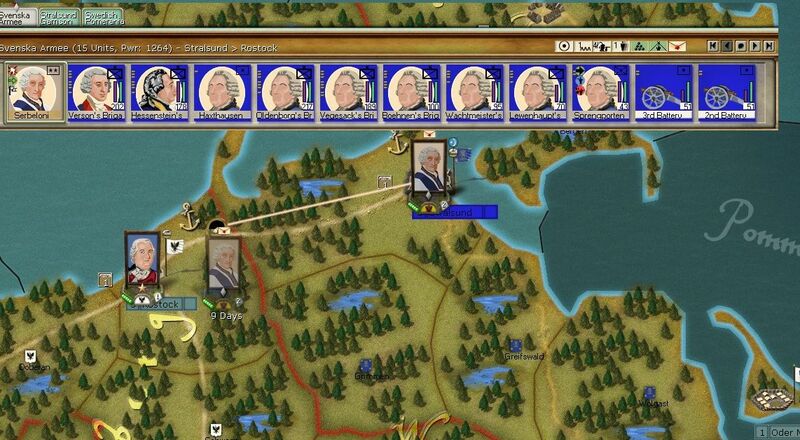 For the moment, I want to see if I can trap his army and inflict substantial losses. That it has split into two may allow me to do serious damage to one column or the other. 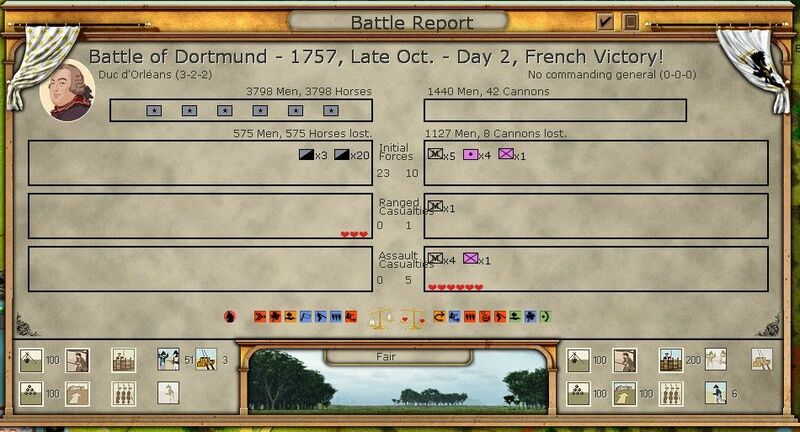 This was a strange month, no progress with the French at all but more vicious battles in Saxony. On the Oder, both in the north and the south, I made some useful progress. 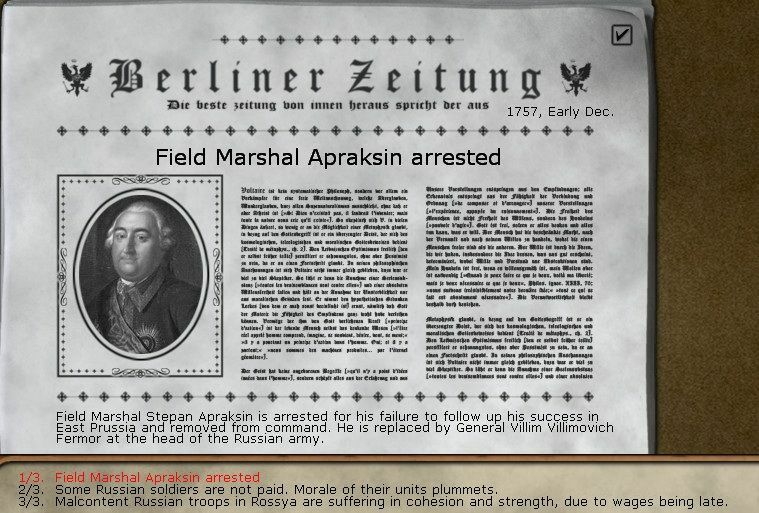 So its coming down to a question of whether Frederick can either cripple the Austrians, or escape, before the Russians and French enter Prussia proper. 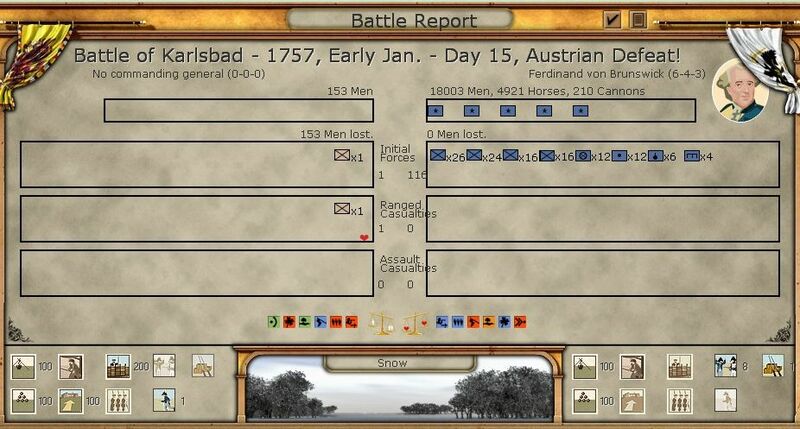 At the start of the month, I'd decided to risk sending one of Daun's corps to Chemnitz to see if it provoked a battle. 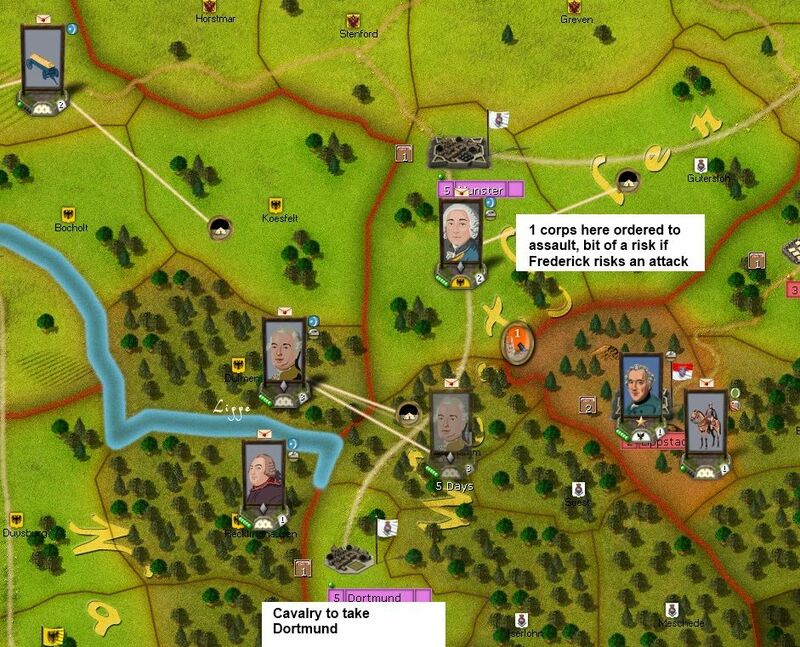 In the event, before I could move, Frederick again tried to escape and hit my army at Wurzen. Despite the three vicious battles, my formations are still ok, my main problem is the loss of Von Bilberstein as a corps commander, a number of wounded brigadiers and some battalions close to losing elements. So my neat OOB is a bit less neat (and is going to get a lot worse) . To allow my forces to recover organisation, I opted to remain on the defense in late June. 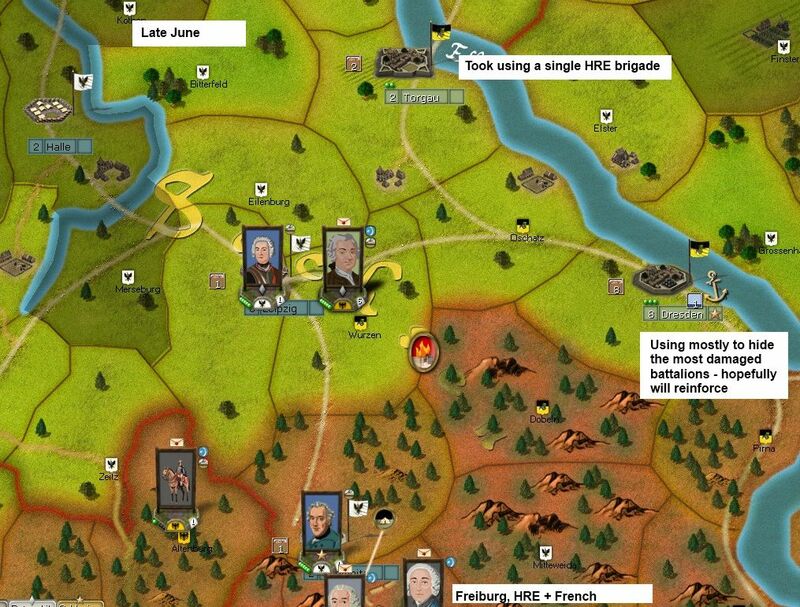 As it is Frederick tries to break out south, running into the HRE/French force at Freiberg. 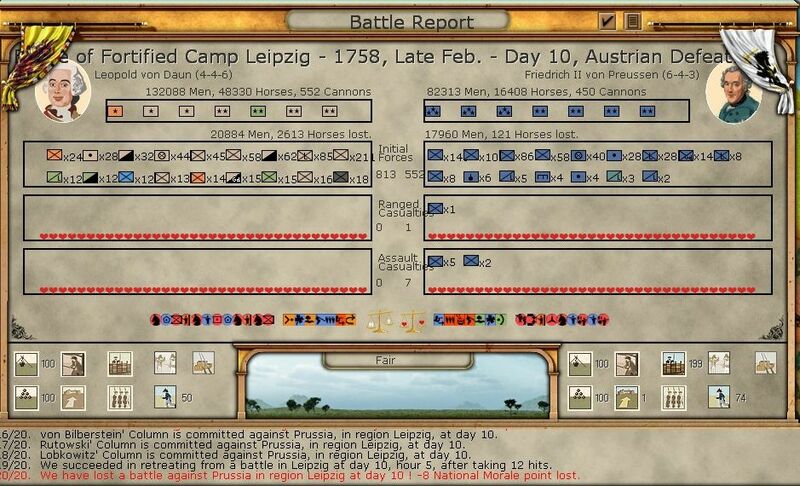 I lose a 3 day battle but inflict more losses in terms of elements on the Prussians. Frederick's army is clearly suffering for lack of replacements. 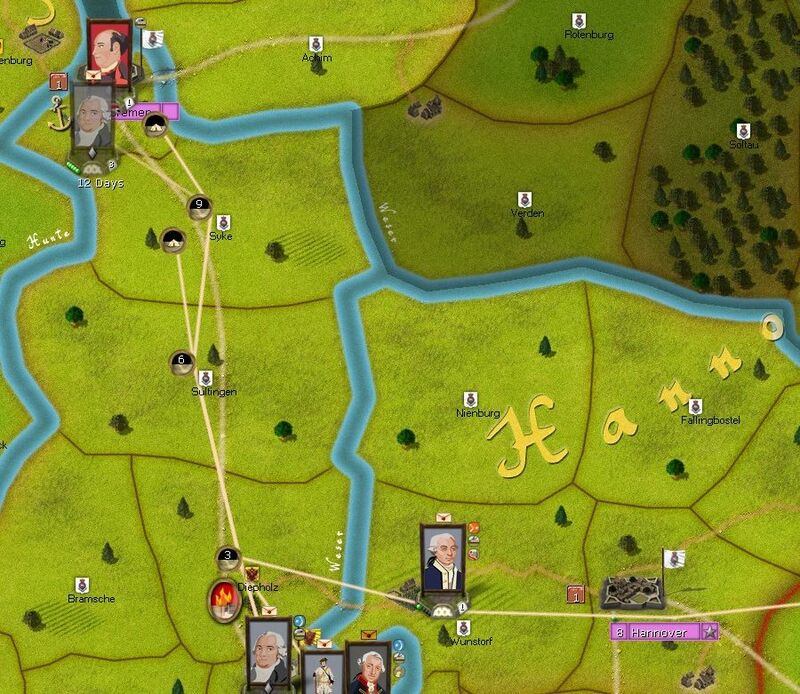 In the end, Frederick drives me from Freiberg but is still blocked by the fort I built. It won't last long, but I might be able to trap him before he escapes. 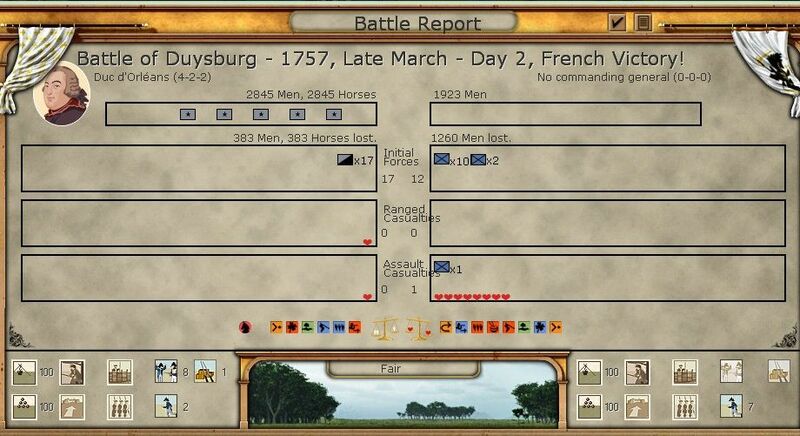 The problem with this battle was the HRE command stack and the French corps were in different stances and it looks like the French took no part in the actual fighting (an oversight by me, I really hadn't expected this battle as I thought Frederick would have slipped out via Leipzig). With the Russian army at Stettin, I don't think he will be an obvious target for the Prussians, and hopefully he can boost the Russian force. 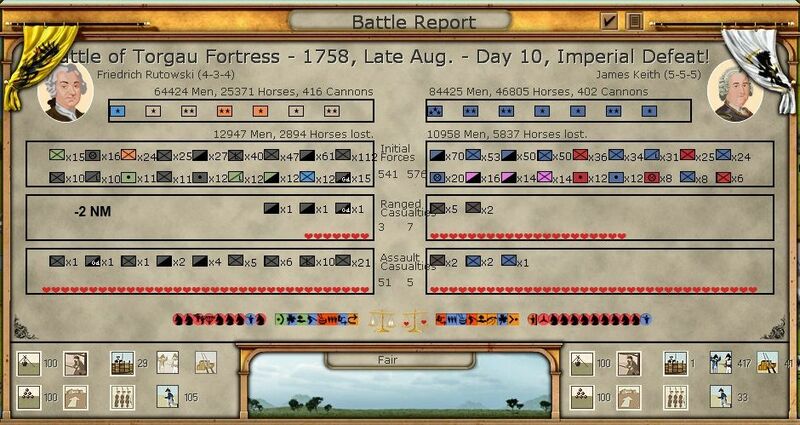 In combat terms that is the weakest of my three main armies. It looks like Narwhal is going to use the Cavalry, the British and the Schlesien Army to protect Berlin from the Russians. This is feasible as I have about 3000 power against 2000 in those Prussian forces but would suffer if I was the one on the offensive. Here, I've gambled (correctly) that Moritz is not going to hang around so have split up Charles army. 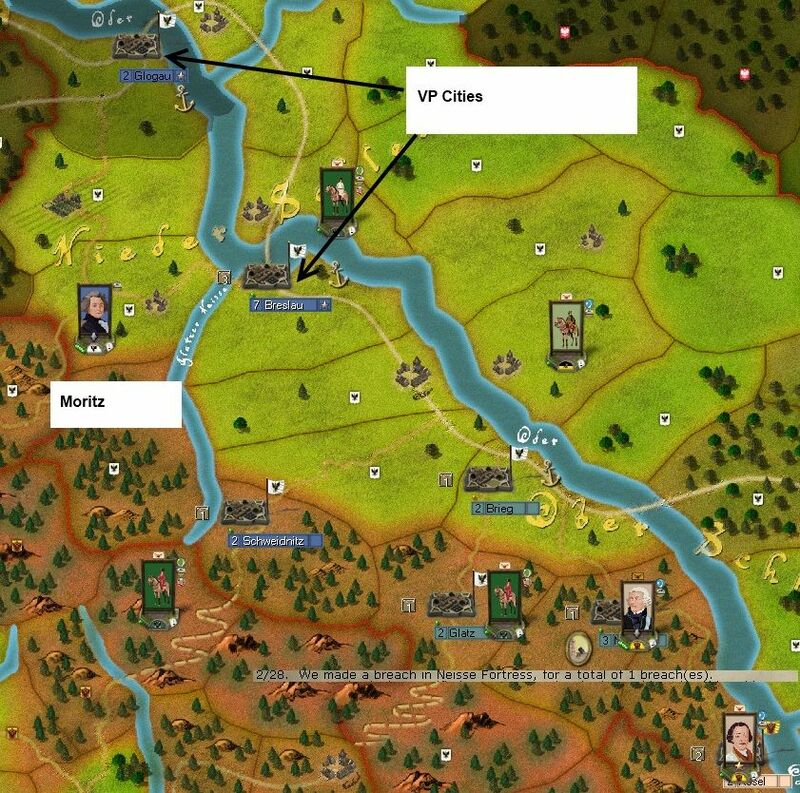 One corp continues the siege at Niesse while Picolomini moves onto Brieg. However, Hannover is proving tough and I can't move on till it is secured. 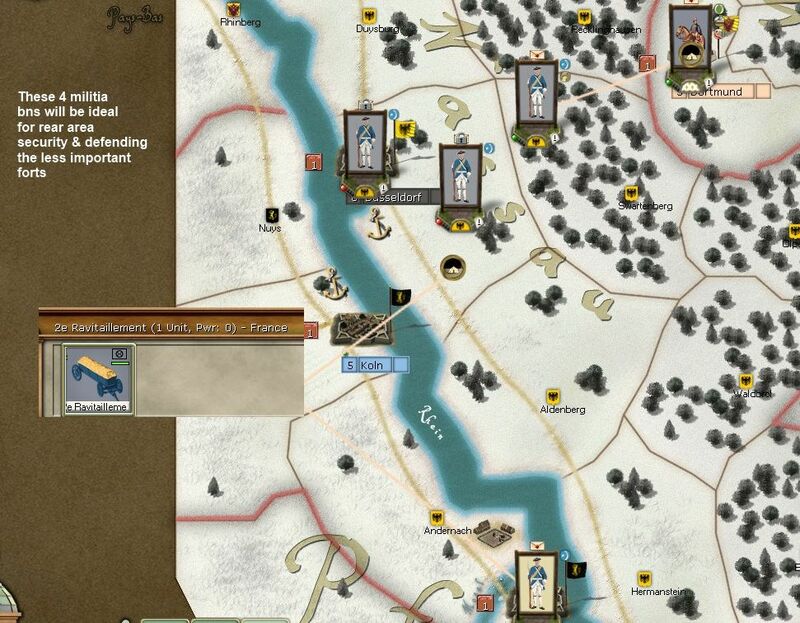 So as the war escalates in Saxony and I make steady progress at both ends of the Oder, the French army stays immobile. So overall, losses remain even, and there is little shift in terms of NM as my gains for Stettin were wiped out by the losses for Freiberg. At the start of the month, Frederick was at Freiberg, snagged up on my small fort there. 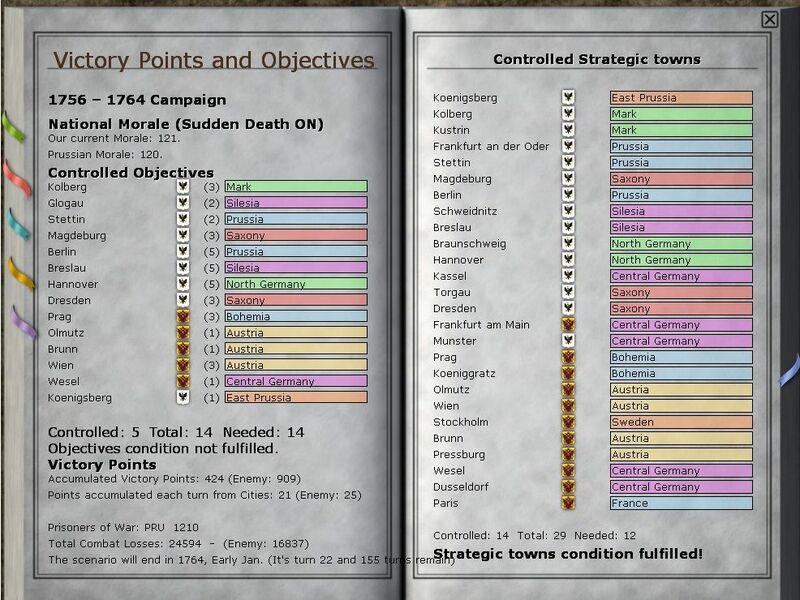 I decided to move the bulk of Daun's army to Chemnitz, and, as before, order a single corps to actually move on and engage. However, by mid July the situation is downright confusing and Frederick's army is in a real mess and large parts of mine not much better. Puffy was promoted and went to Dresden to pick up some fresh units and would return in a few days. In any case, the slaughter recommences. Here it seems as if the Prussians are trying to bar the road to Berlin, even as more powerful siege guns have almost reached the front. I'm content to wait a while, as I need to recover organisation. I'm not that worried, they fell back to Stalsrund and can hide in the fort. 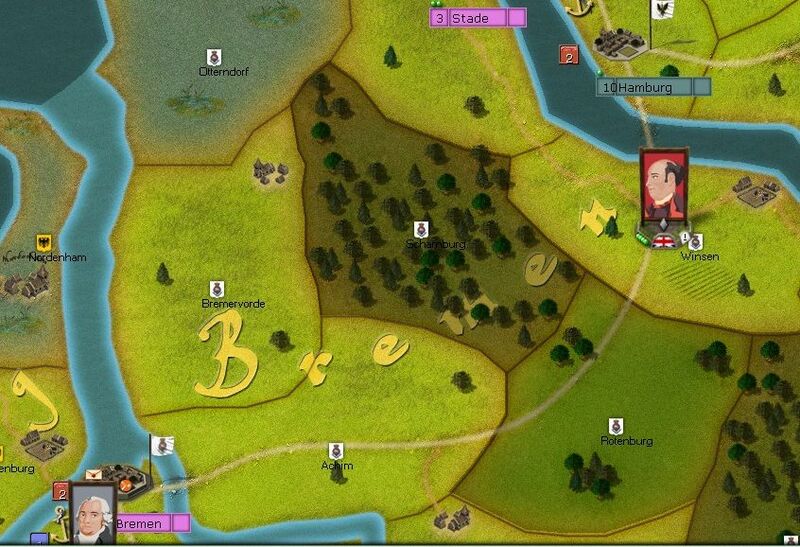 Opening the road to the Elbe and the French move up to renew the siege of Braunschweig. Well the VP situation still favours me, and I'm still ahead with NM. Losses are escalating but still pretty even. Its a case of whether I can really finish Frederick off. 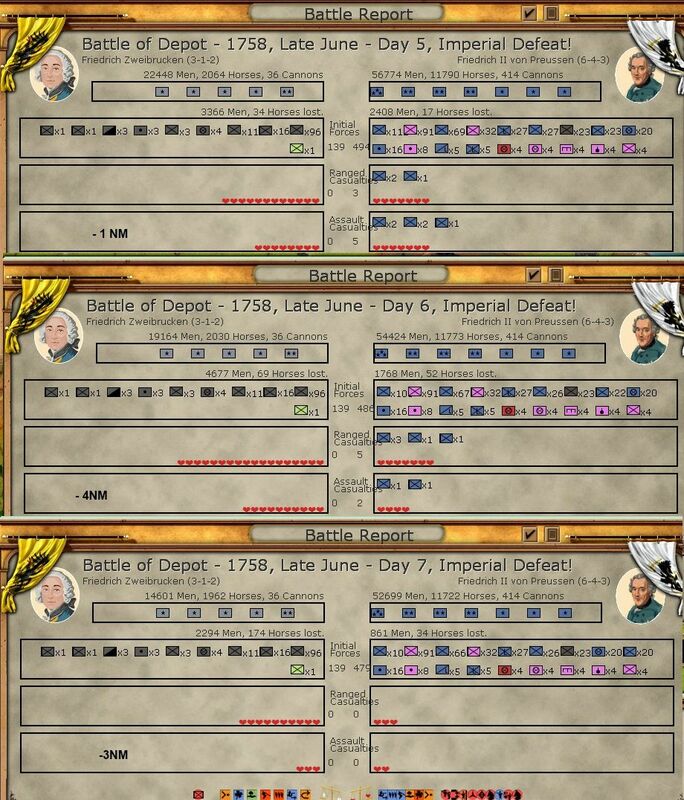 In those last battles a lot of units were inactive. In particular in the assault phases, the numbers engaged dropped by almost 50% (failed morale checks) and this is going to get worse. The main fear is that those forces facing off against the Russians move to Saxony. They might be able to overwhelm Daun's battered army before the French and Russians will be able to deploy. I'm torn between wanting to finish Frederick off and the state of my own army. Most of the problems are with low organisation, but even with a lot of reorganising I am going to start losing elements soon. Anyway, the only clash is brief, neither of us really being in a position to sustain much combat. 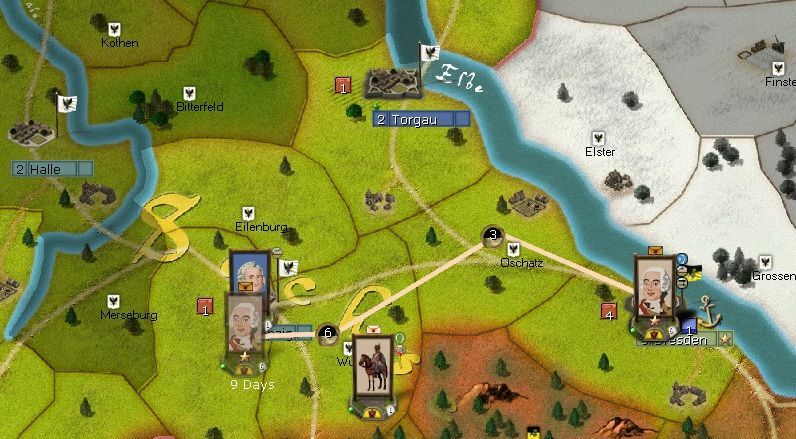 As that screenshot hints (its not very well composed), I have a new problem as Torgau is now under siege. I'd moved a collection of units to Torgau to protect my rear (especially when, as below, I found the Prussians had abandoned Berlin). 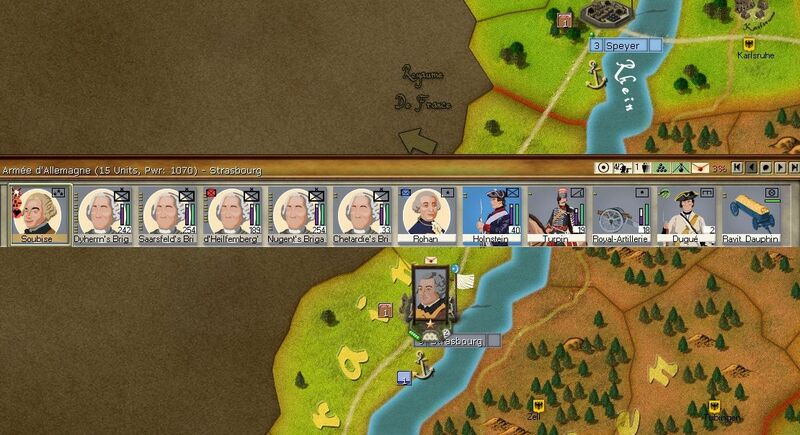 Even attacking across a river, the fresh Prussian force pushes me out the way. As you can see my losses are now feeding into lost elements. This is probably the last turn when splitting up the map into sectors will make any sense at all. Well the Russians wake up on 1 August and find the Prussians are all gone. Even worse, they seem to have moved to the one gap in my scouting network. I decide to push forward in an arc of corps to just north of Berlin. I want to protect Stettin and I am afraid that Narwhal would retreat towards Frankfurt an der Oder, where it would be very hard to dislodge him. 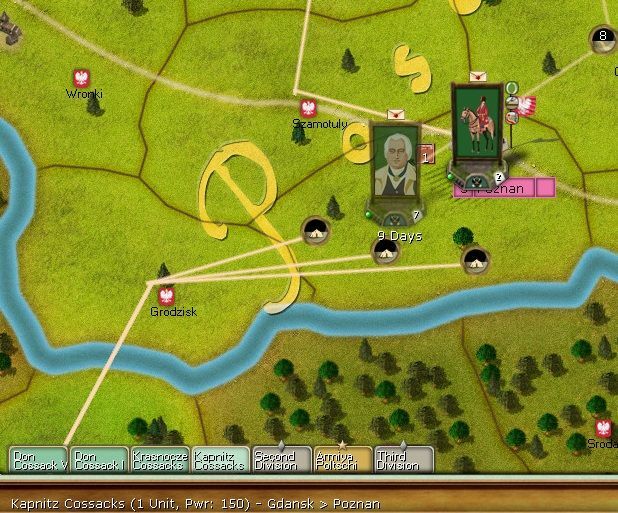 and the Cossack formation is sent to Torgau in case, as I suspect, the Prussians are heading to join up with Frederick. And the last of the forces unlocks back in Paris. Well off they march to the front, where I suspect I am going to need every unit I can muster. Overall, this is from mid-August, using the control/supply map mode. Shows how little is under Narwhal's control and, hopefully, how little of his produced supply is able to move to his field armies. So its in my favour, but also very tense. 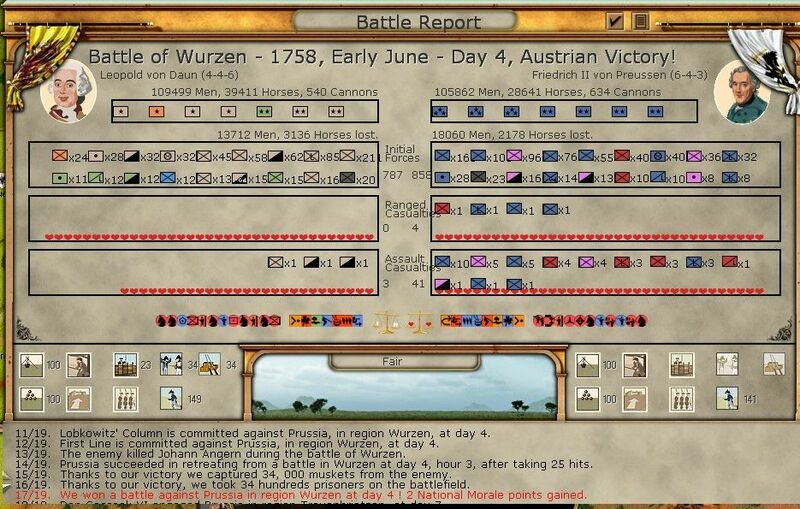 That fresh Prussian army is a real threat to the battered Austrian forces. The French won't take Magdeburg till the end of September (at the best), and it will take time for the Russians to clear Berlin.